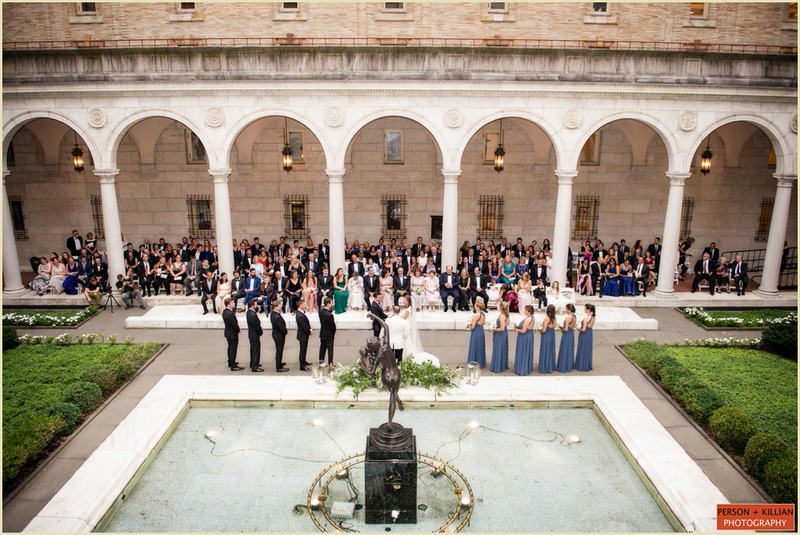 While Meaghan and Harry were saying their royal wedding “I do”s in England, we were celebrating the beautiful wedding of Laura and Mike right here in Boston. 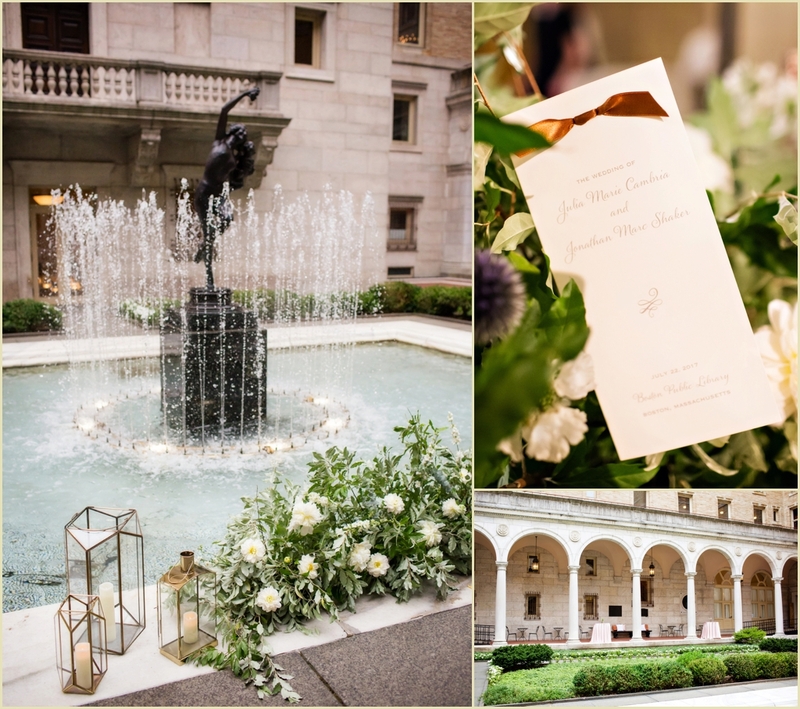 This wedding was extra special for us to be a part of, because Laura credits our very own Person + Killian blog for helping her find inspiration, ideas, and vendors for her own celebration. 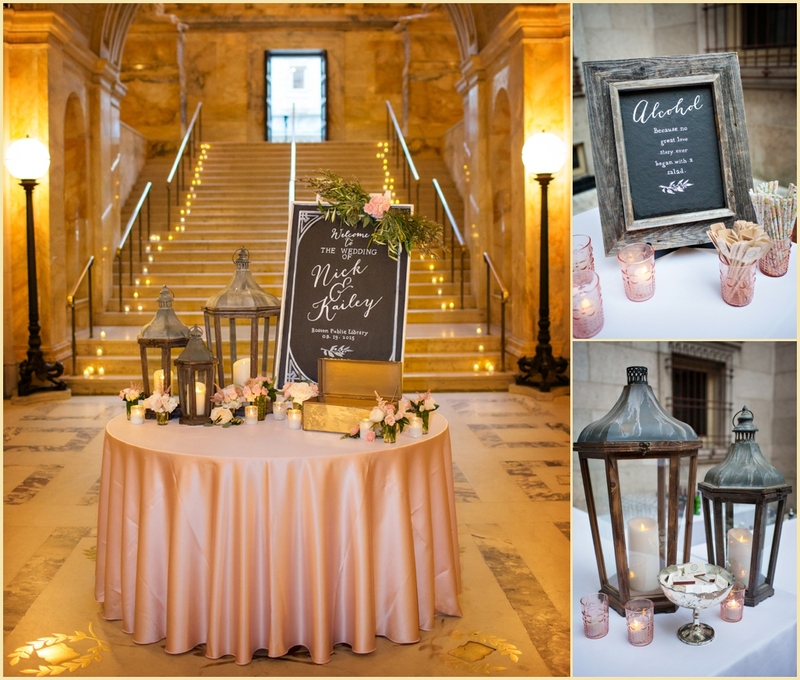 The couple described their vision for the wedding as “modern and romantic” with “lots of metallic colors” along with white, green, and pink flowers. 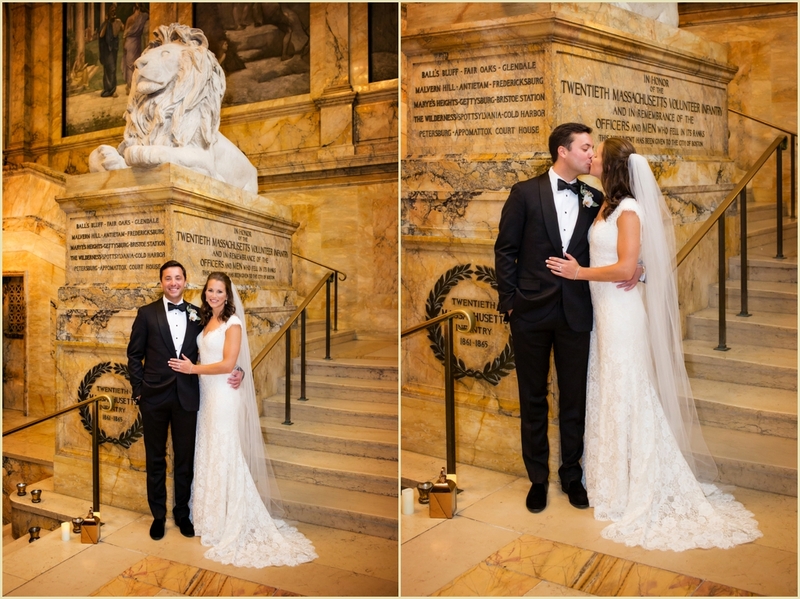 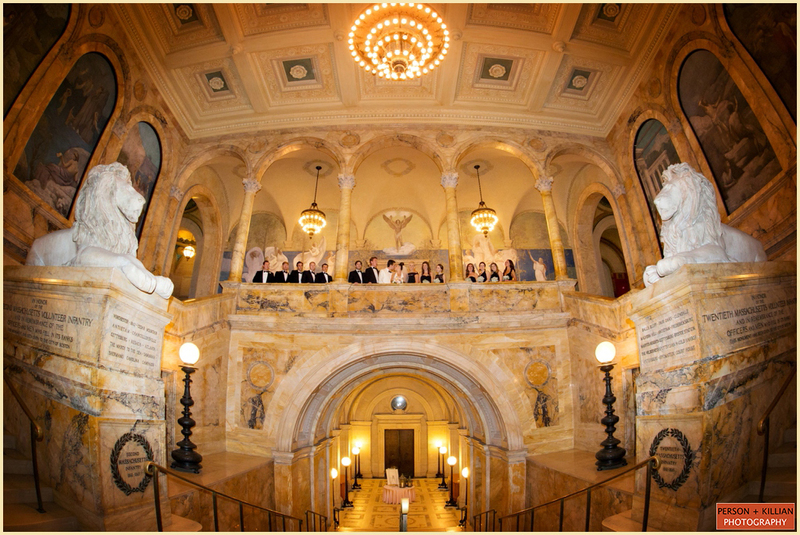 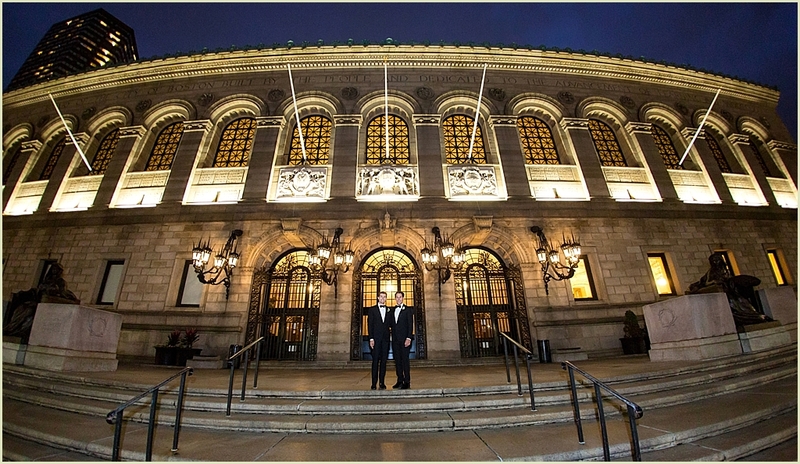 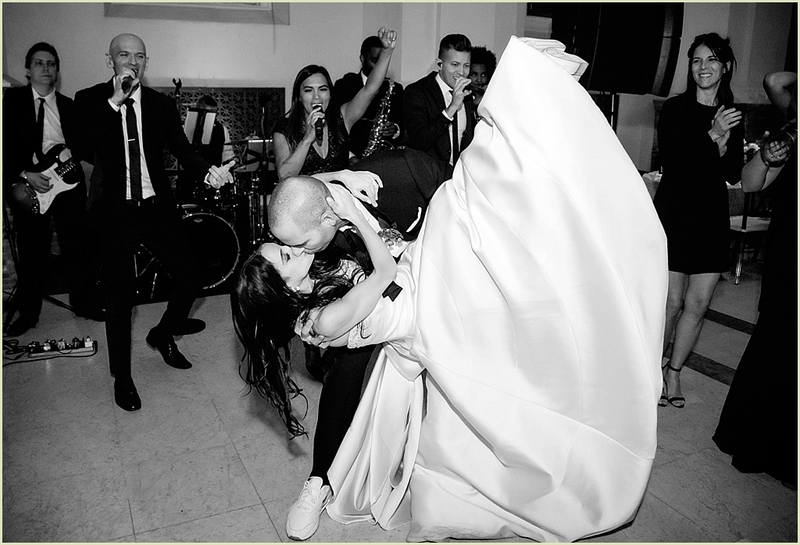 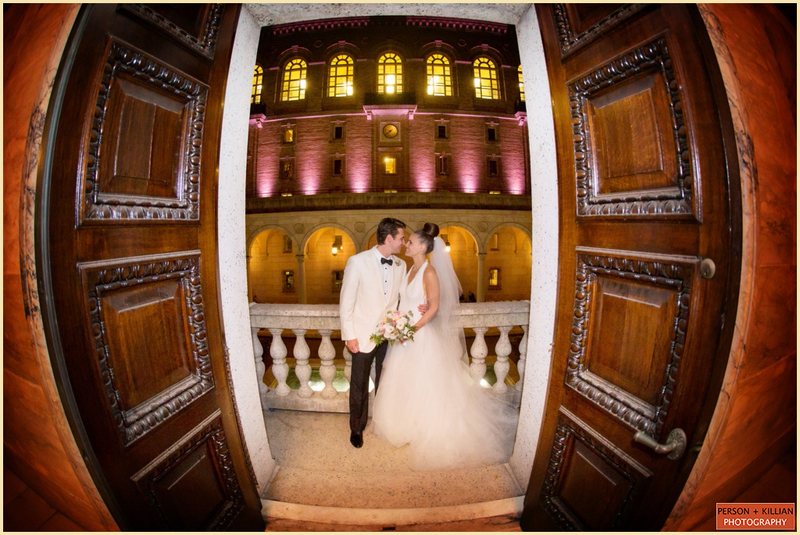 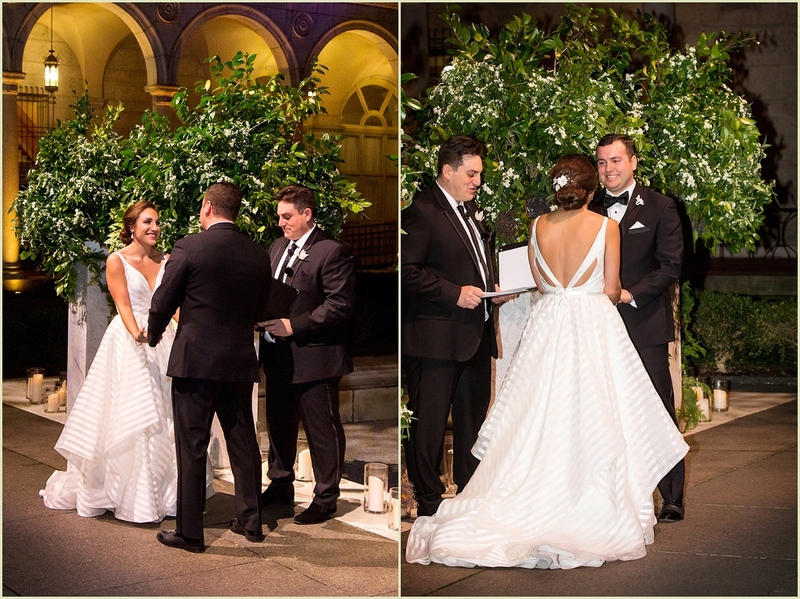 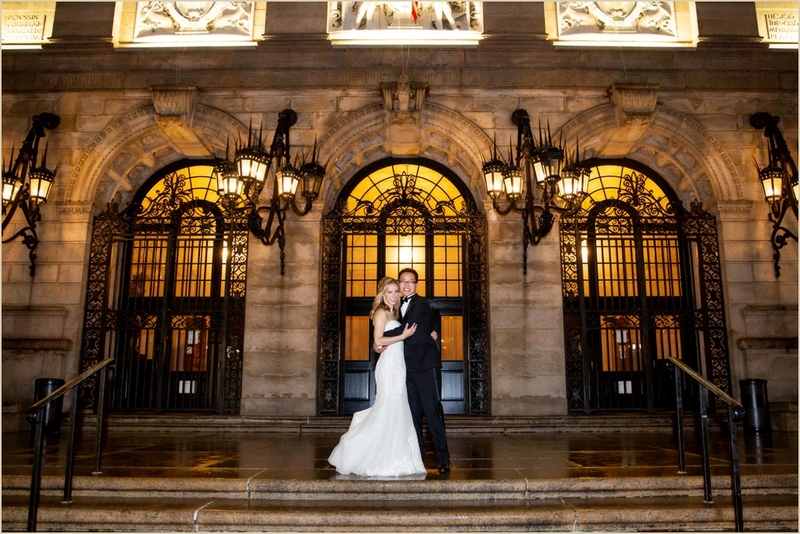 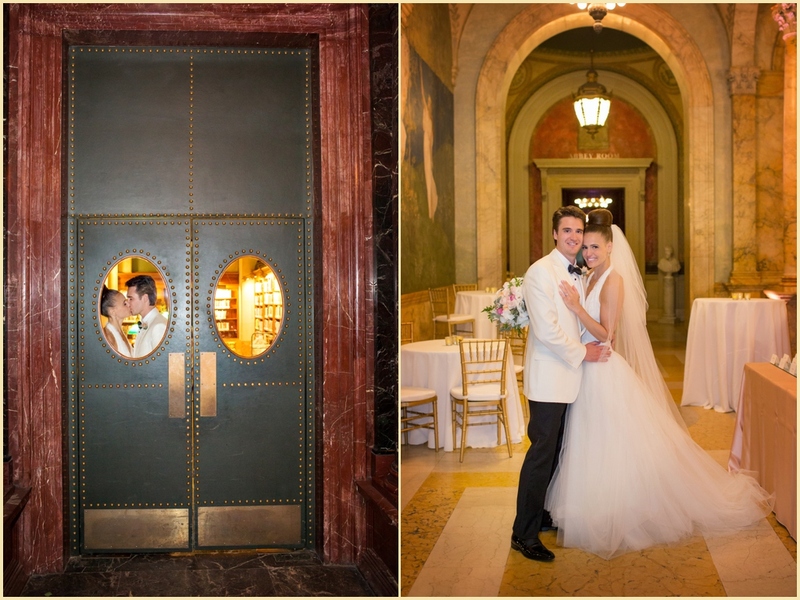 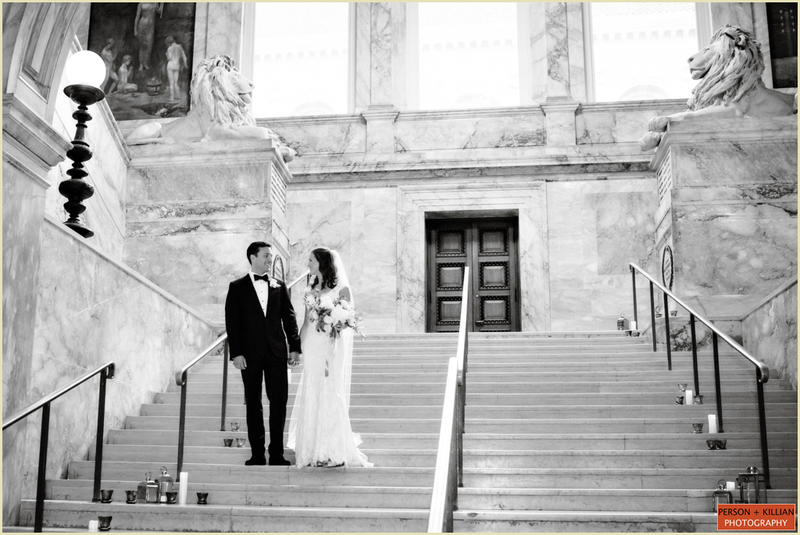 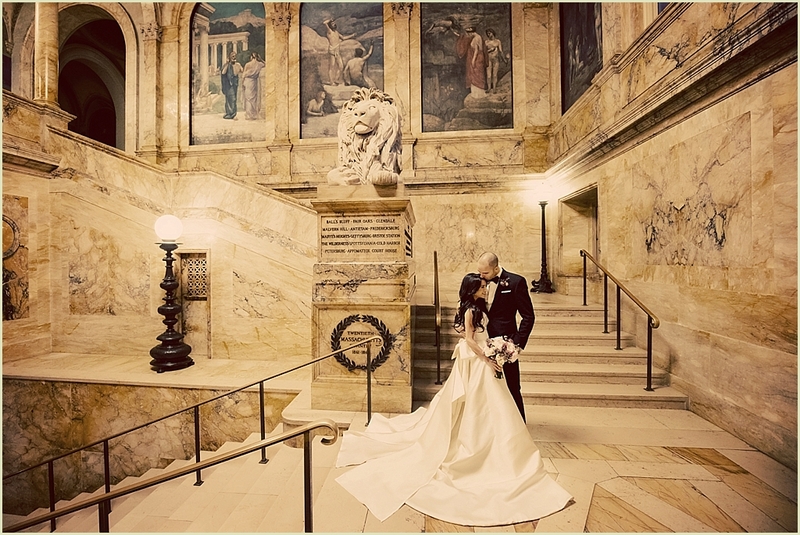 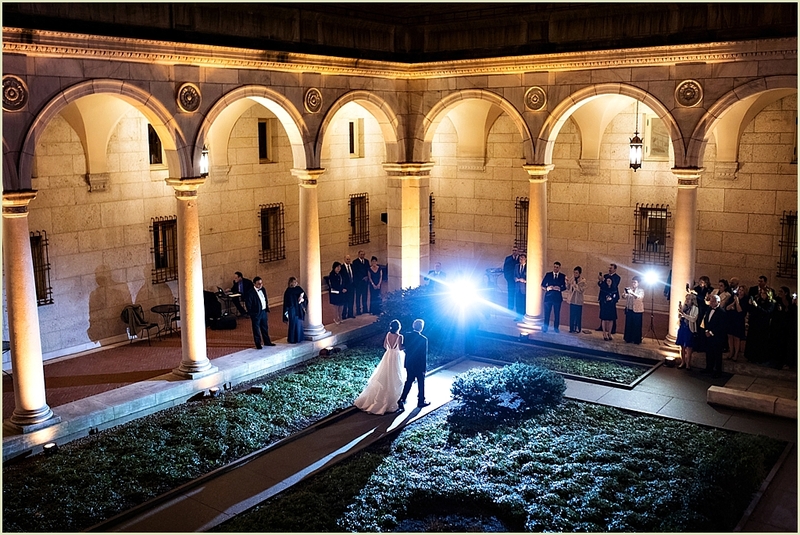 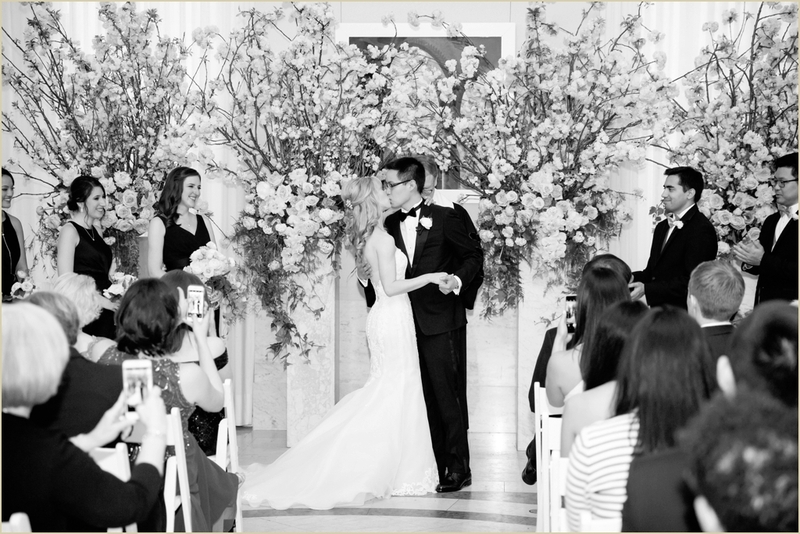 The bride and groom are getting ready to start a new chapter of their lives in Los Angeles next month, so this Boston Public Library wedding was their “last big hurrah” in Boston before making the move! 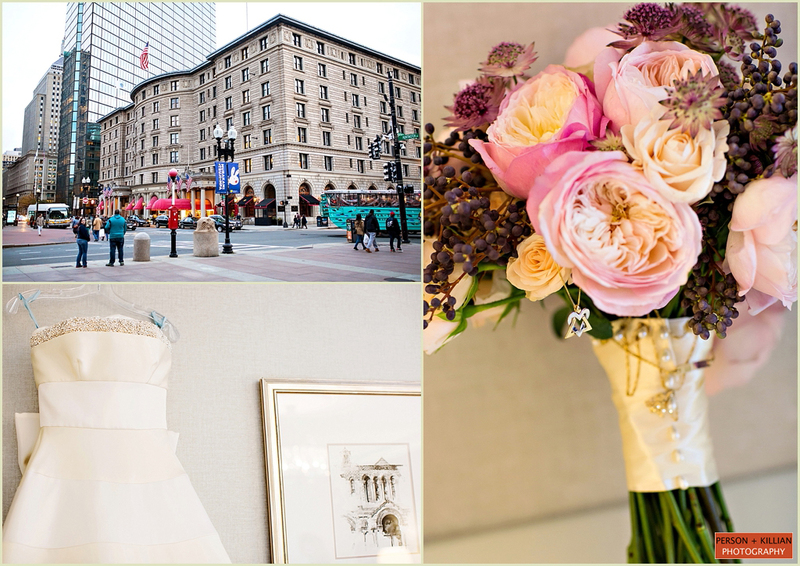 The day started at the Fairmont Copley Plaza, with a champagne toast for the ladies and the bride and groom’s first look in the Fairmont lobby. 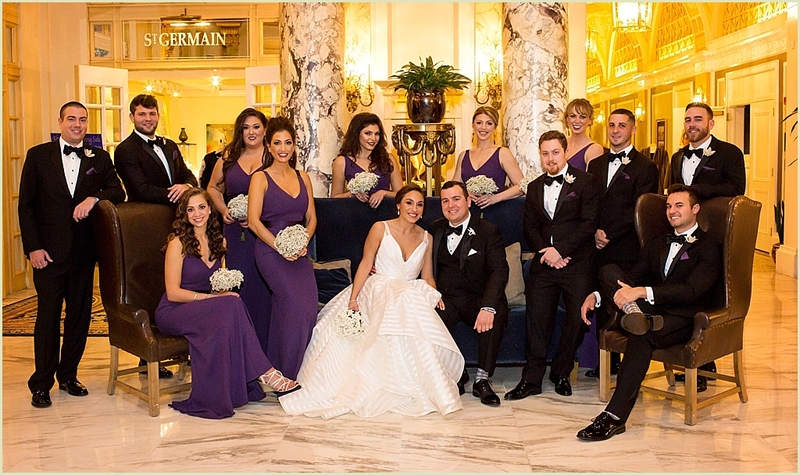 We stayed at the Fairmont for some formal photos with the wedding party before making the quick walk across Copley Square to the Boston Public Library. 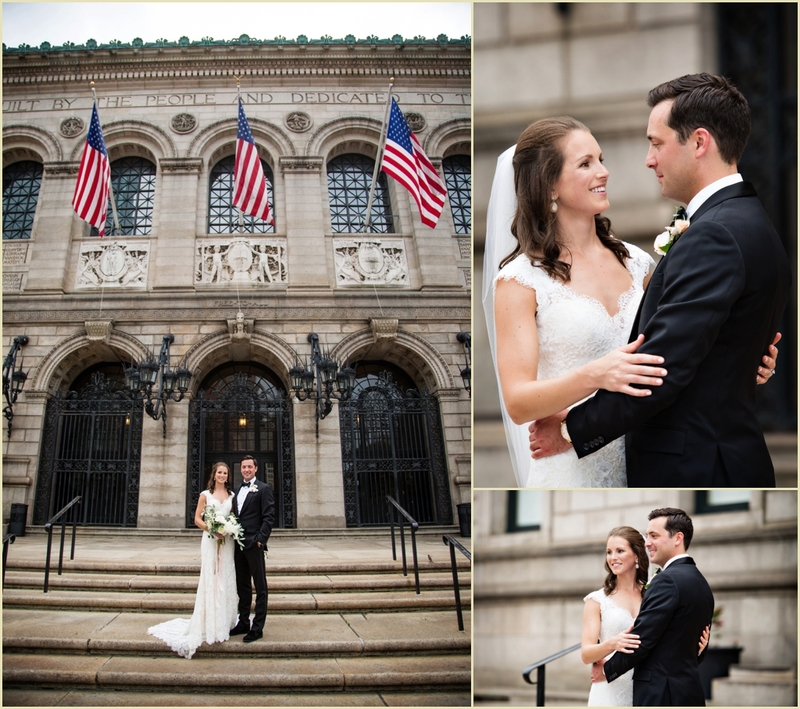 Laura and Mike didn’t even mind the rainy day, with so many gorgeous spaces inside the Fairmont Copley Plaza and the Boston Public Library we could get some beautiful formal photos without getting wet. 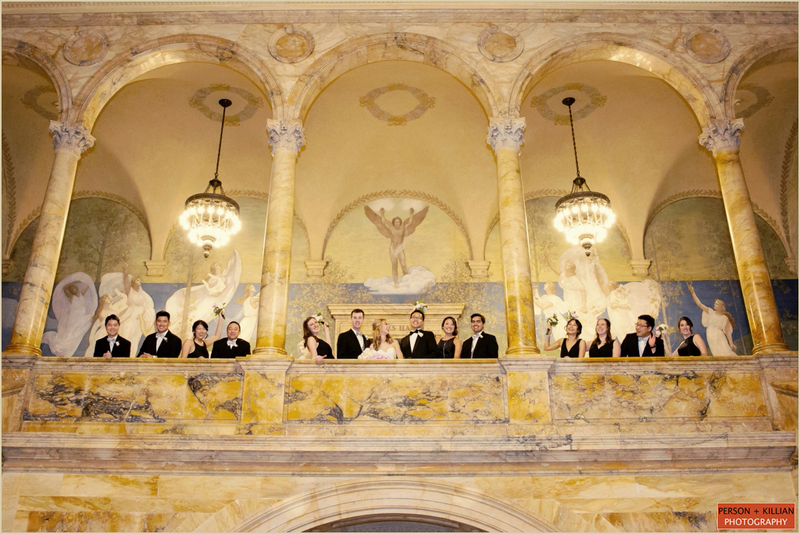 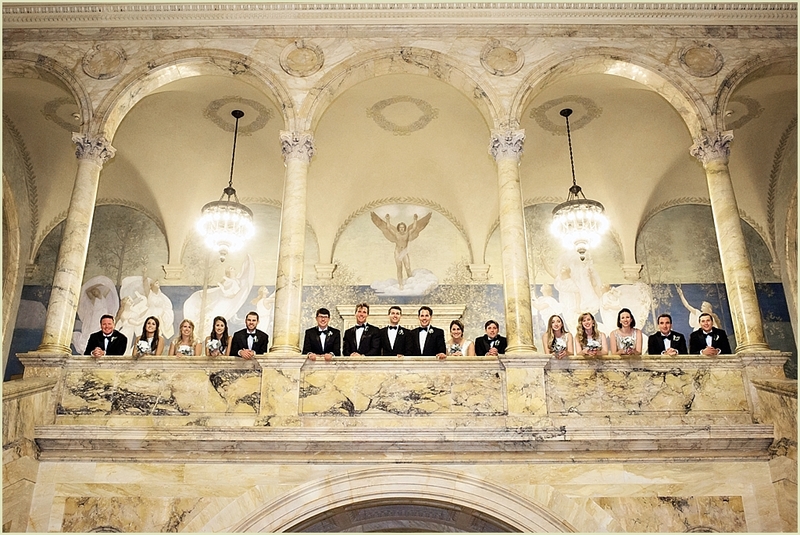 Once inside the BPL, we got photos with the entire wedding party on the grand staircase, on the balcony, and outside the Abbey Room. 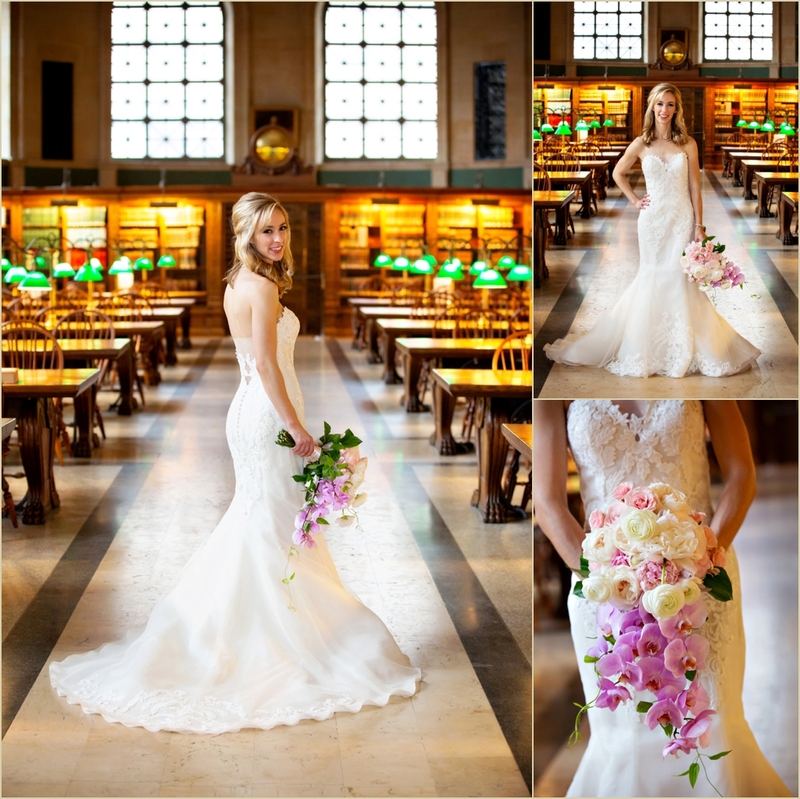 The mix of classic colors from the bride’s white gown, the bridesmaid’s black dresses and the pop of pink and white flowers was just beautiful inside the Library. 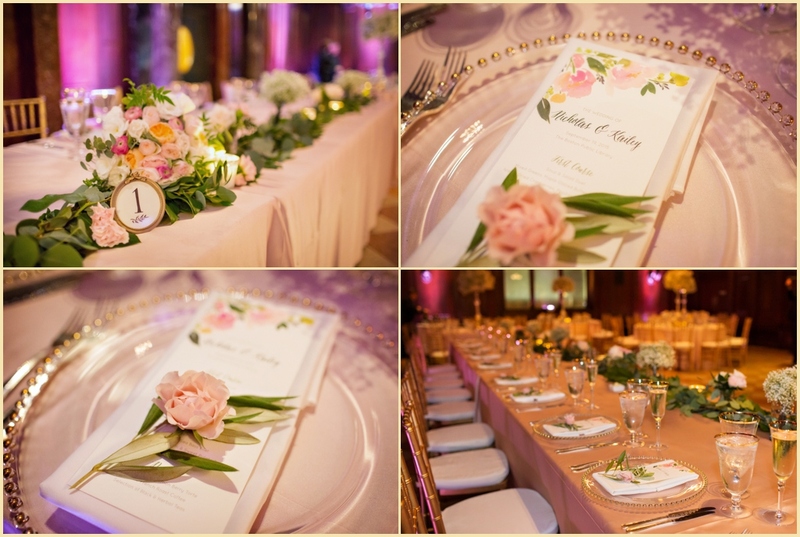 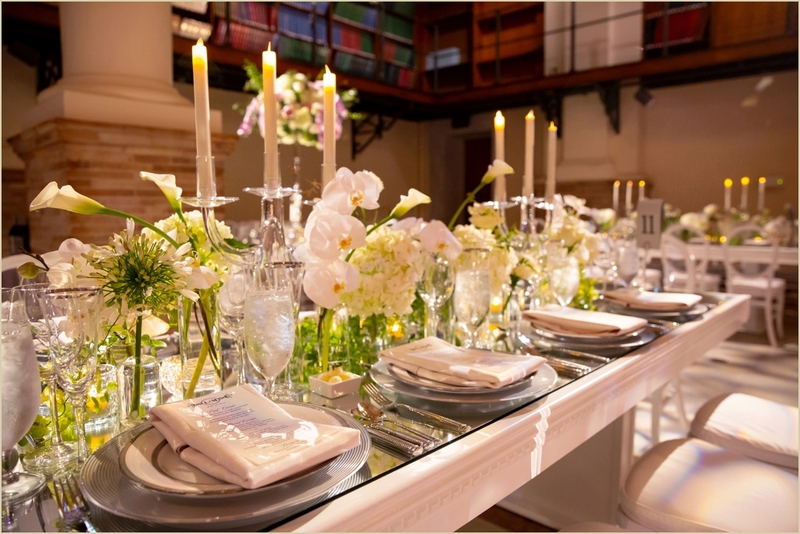 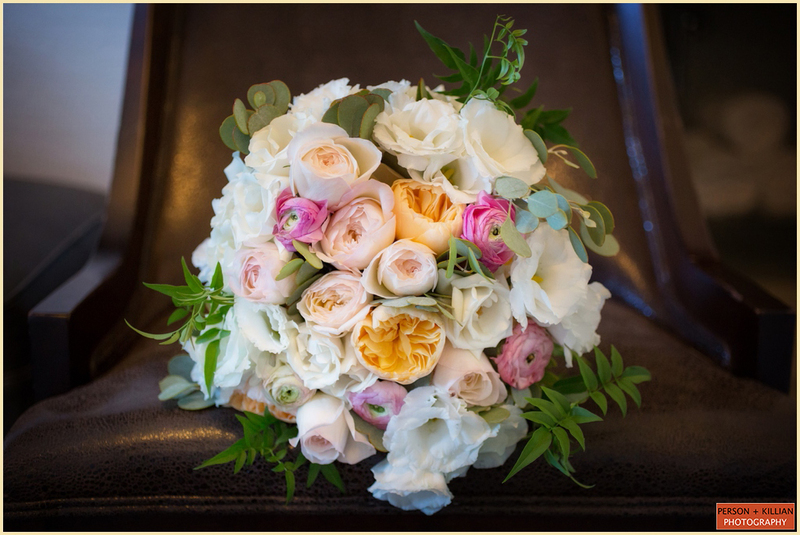 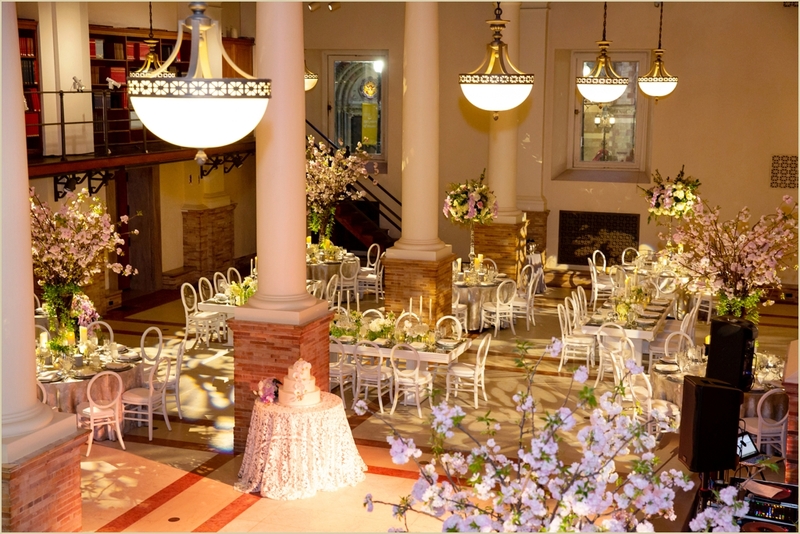 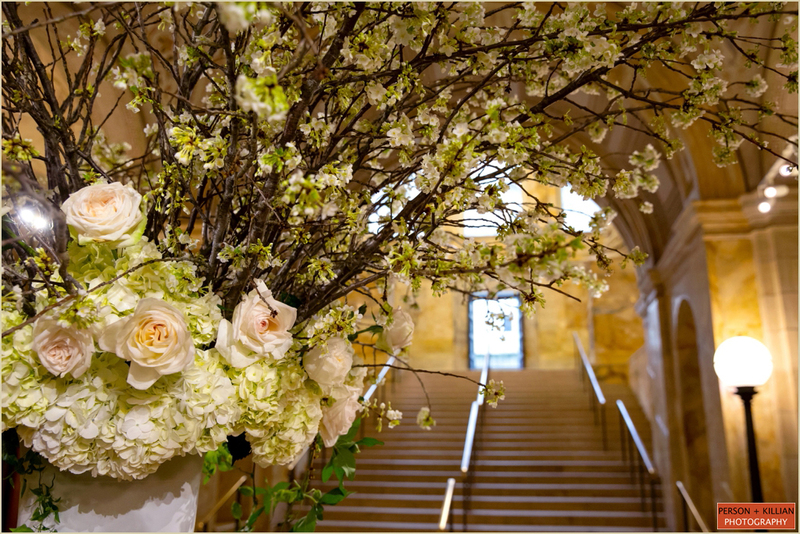 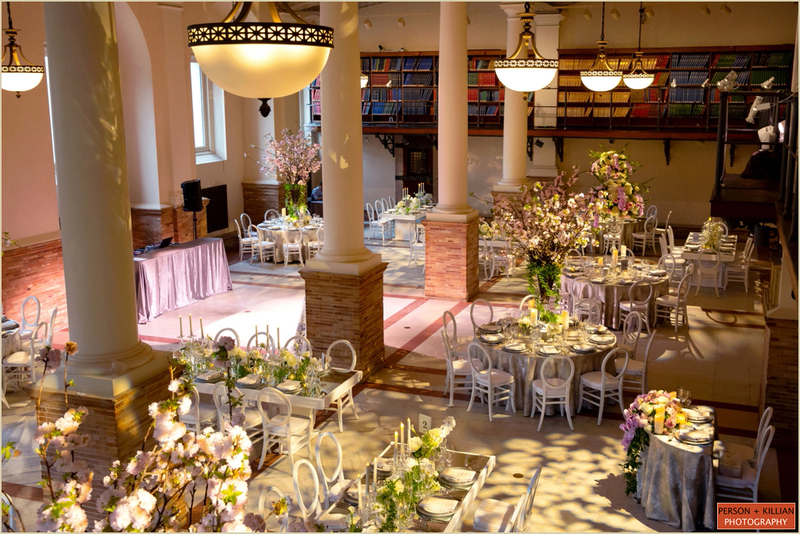 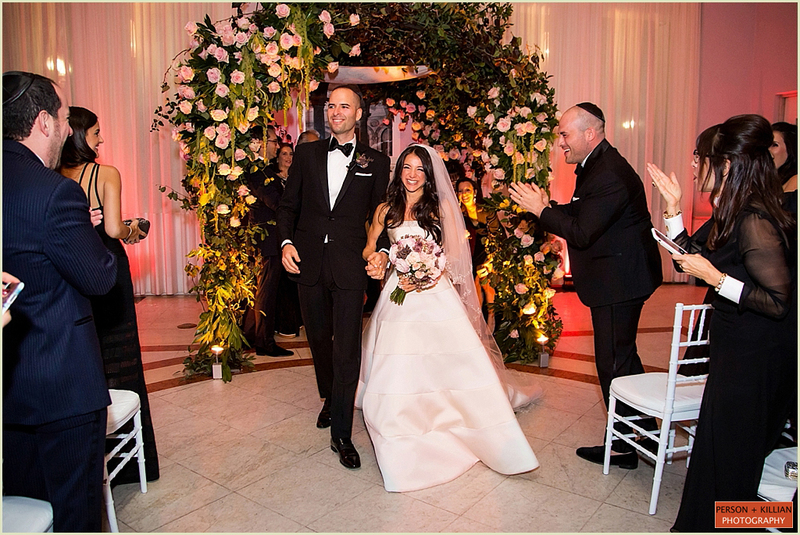 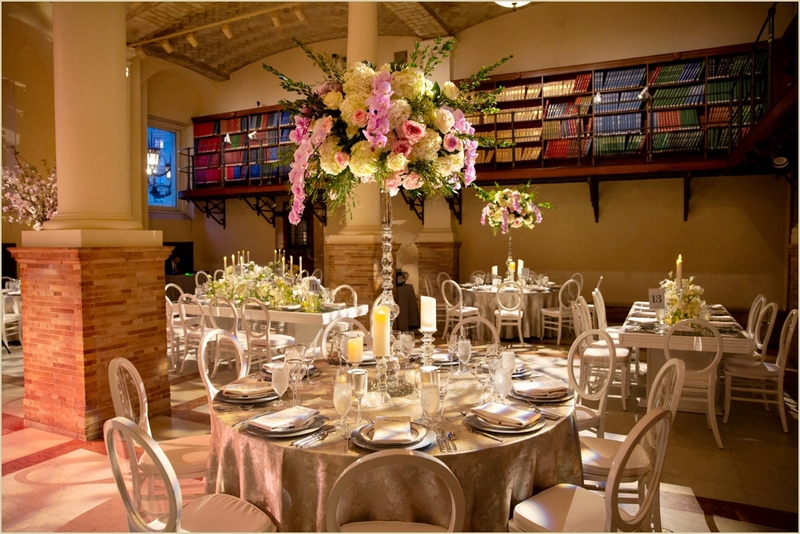 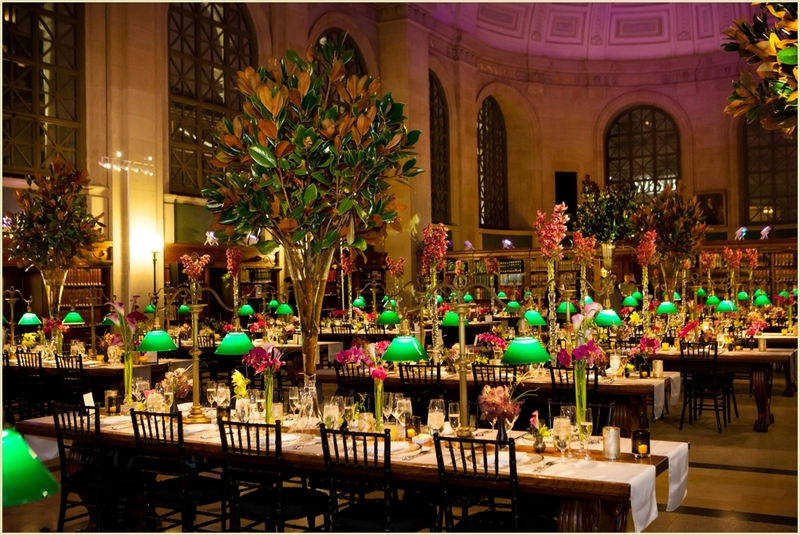 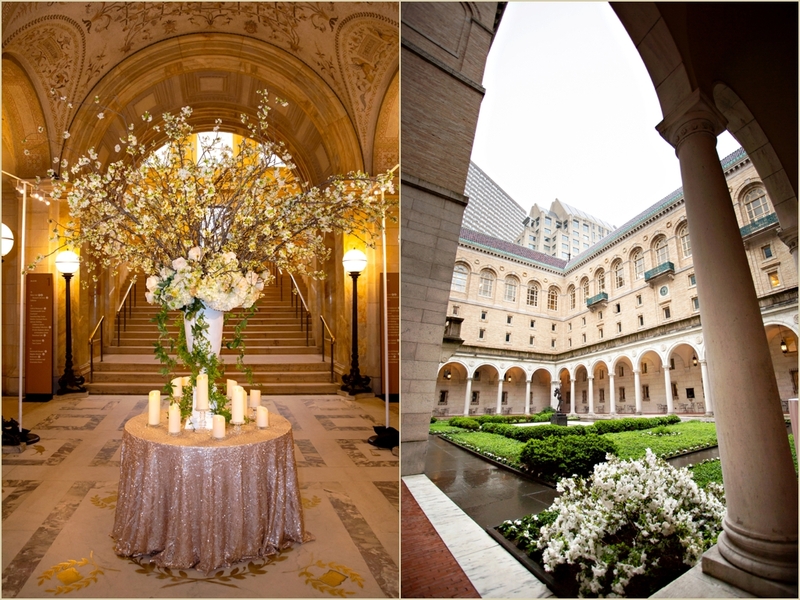 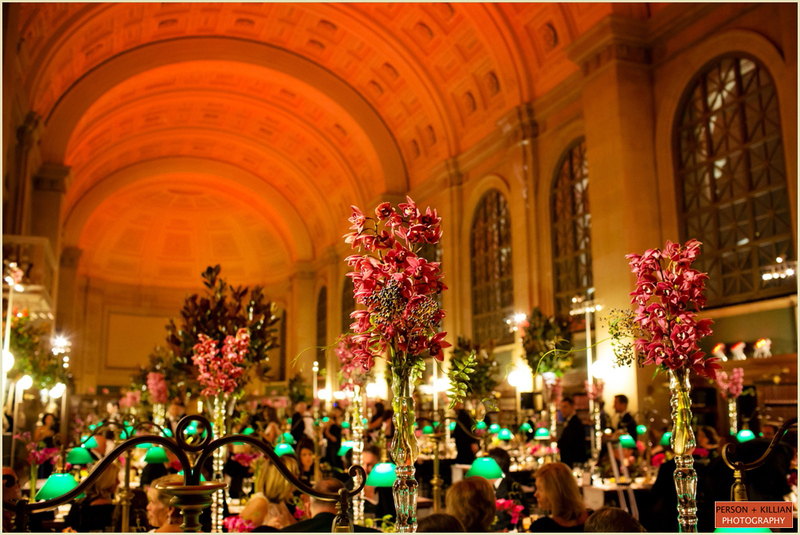 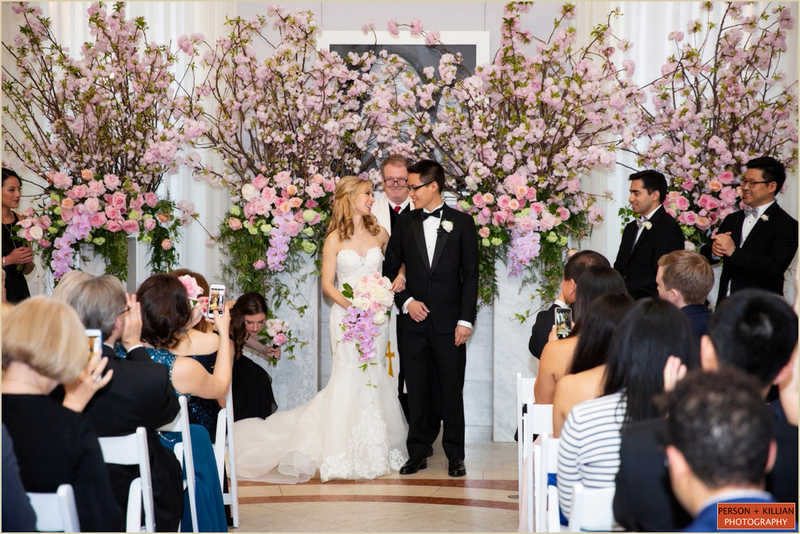 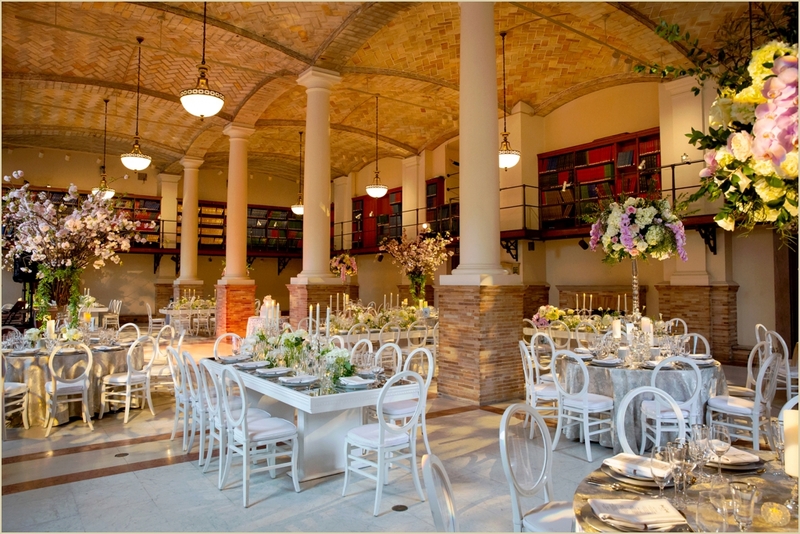 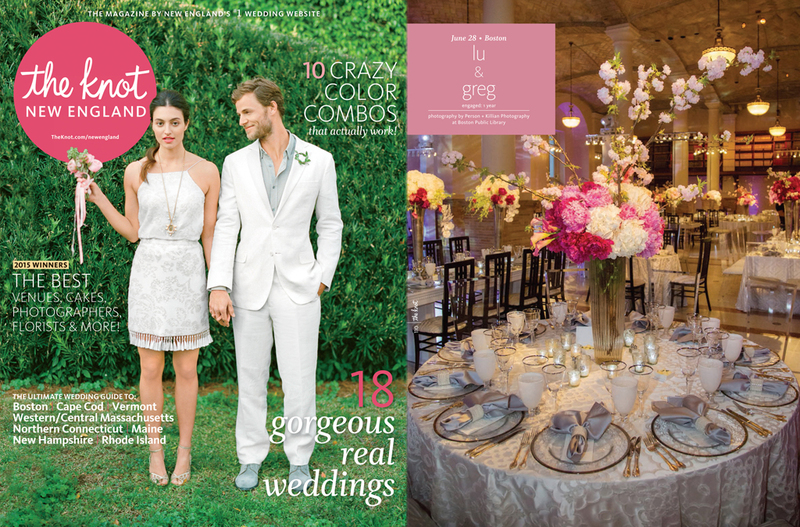 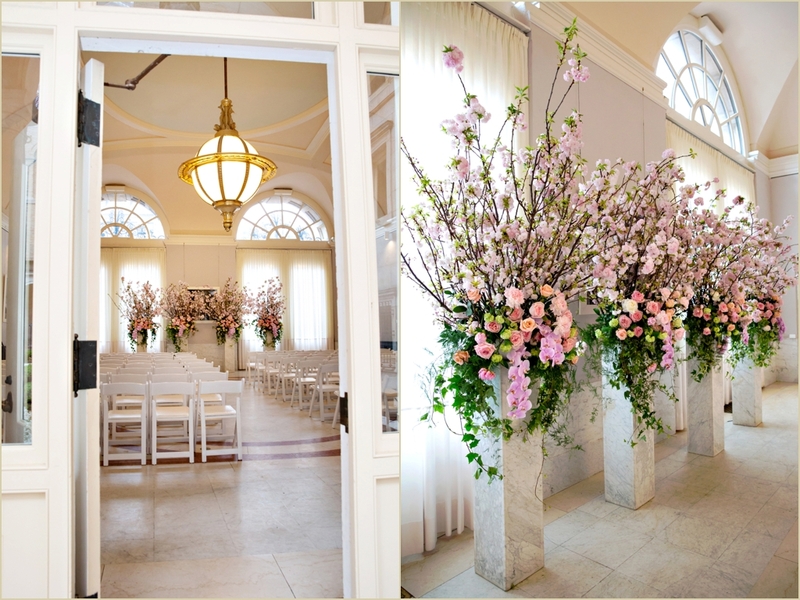 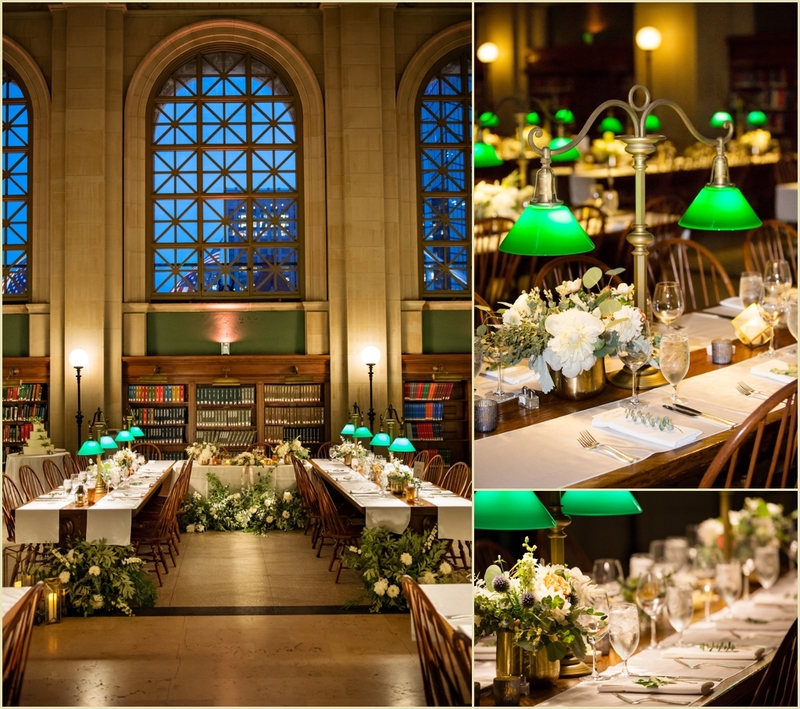 The wedding ceremony was held in the Boston Public Library’s Courtyard Restaurant, which featured four towering floral arrangements of white, pink, and green. 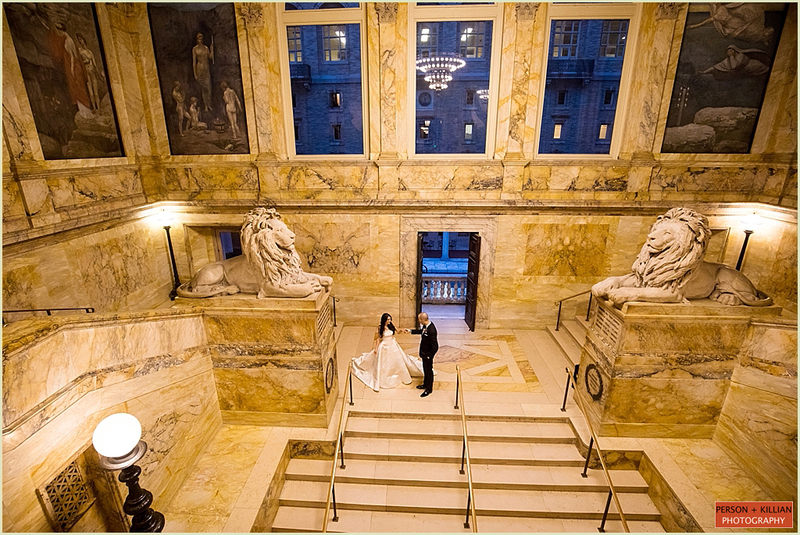 Following the “I do”s, guests moved to the Map Room Cafe for cocktails while we took the newlyweds around the Boston Public Library for some evening portraits of just the two of them. 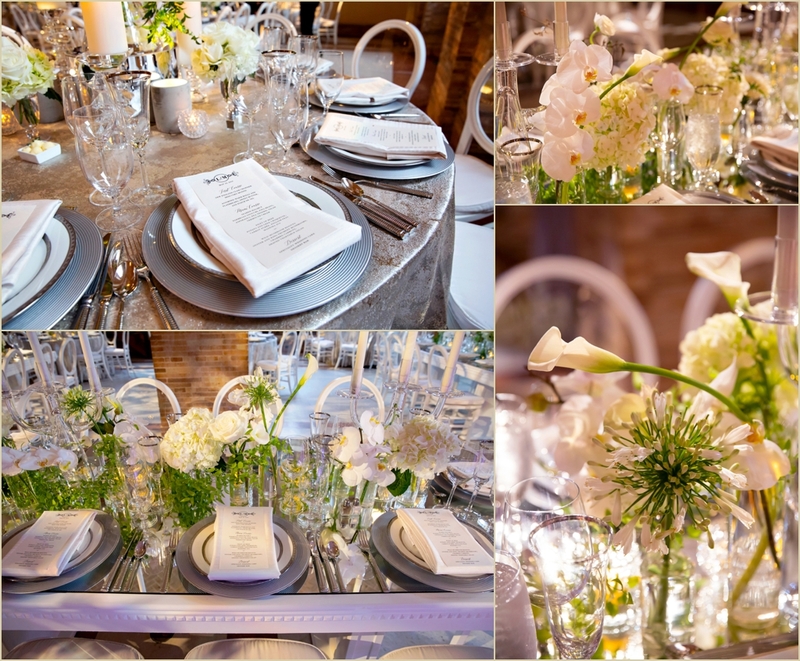 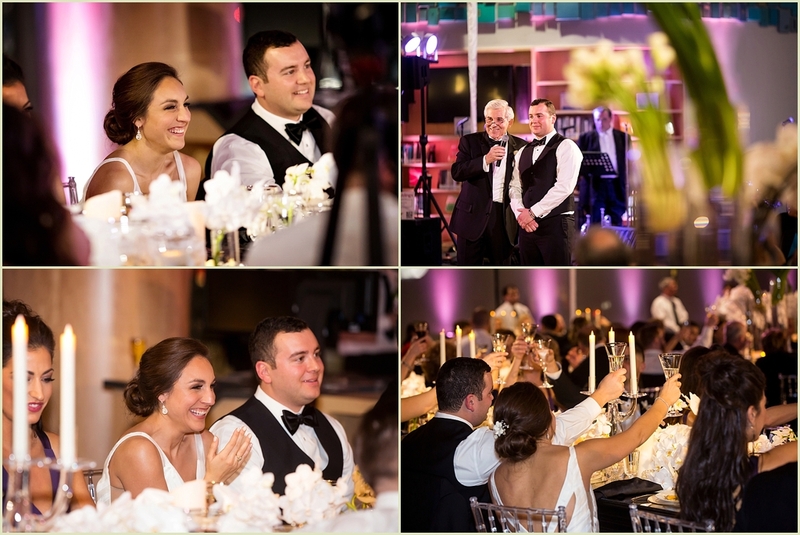 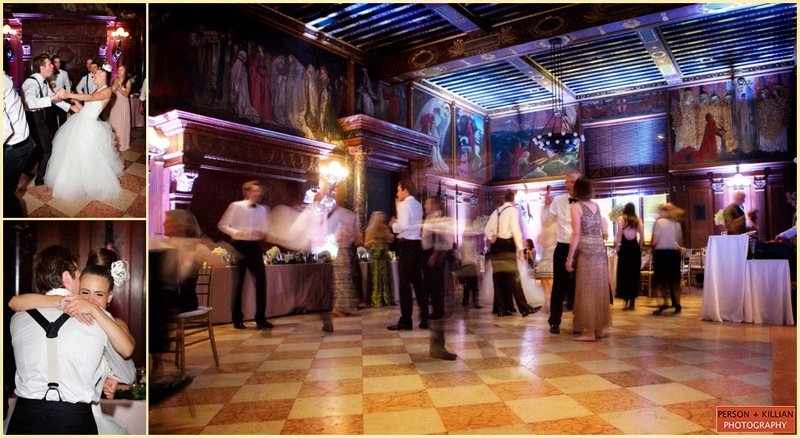 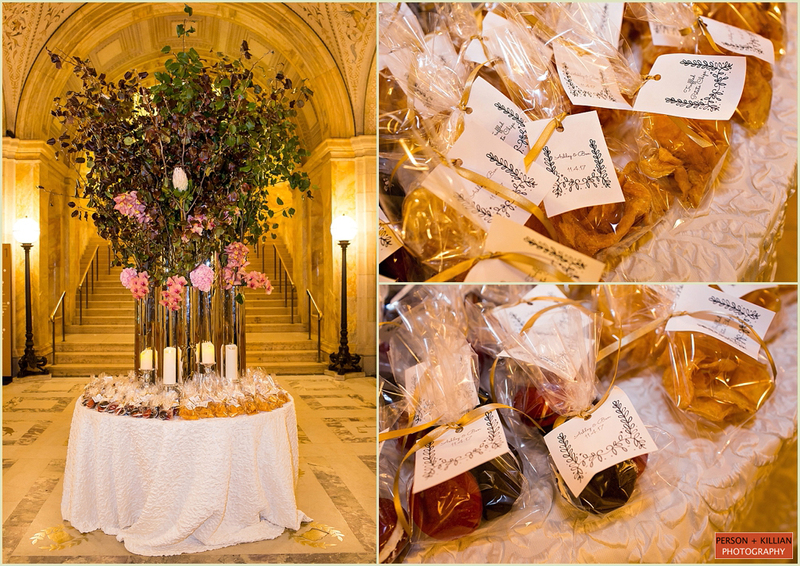 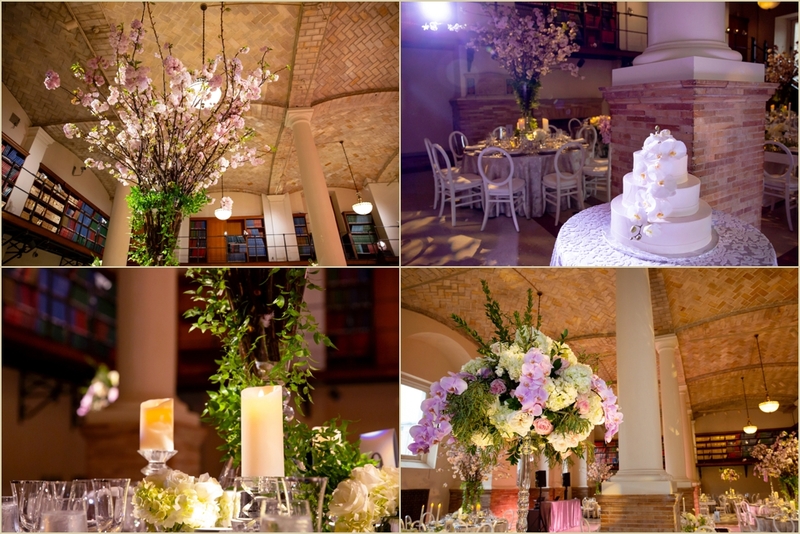 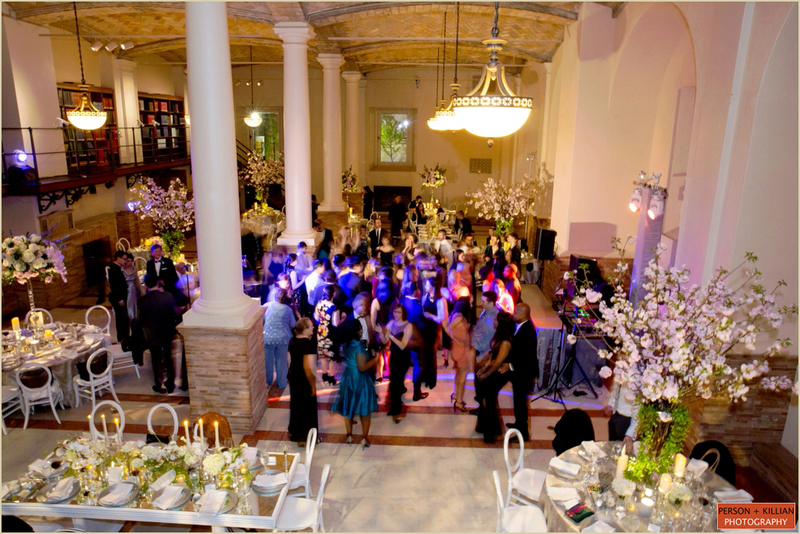 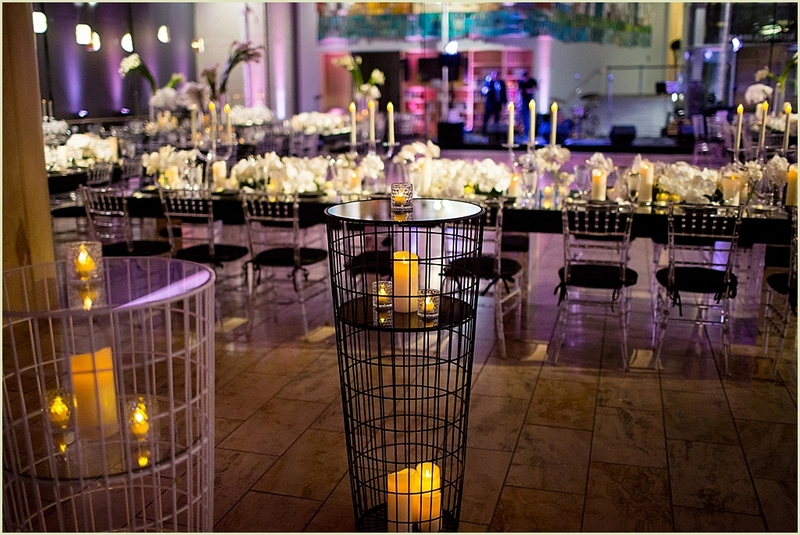 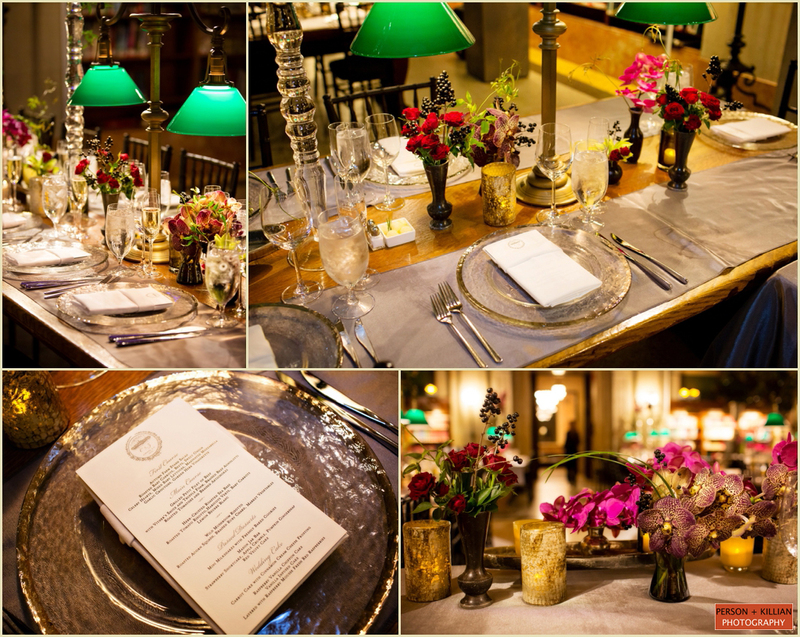 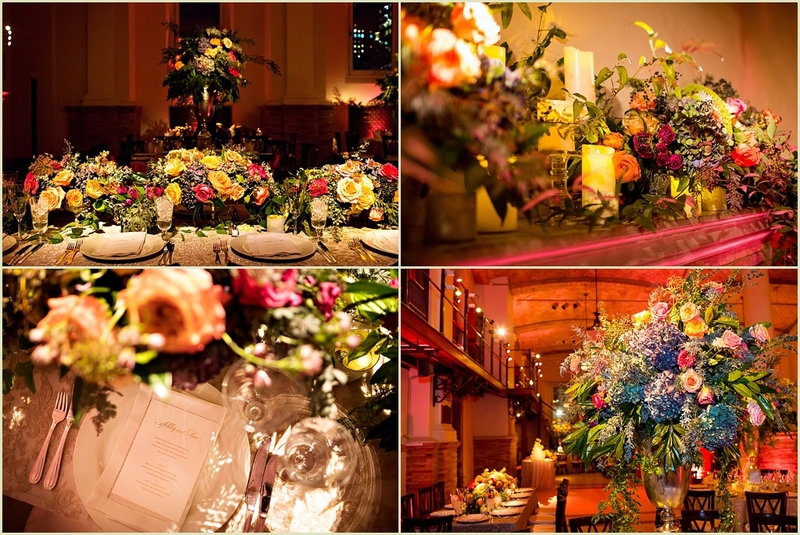 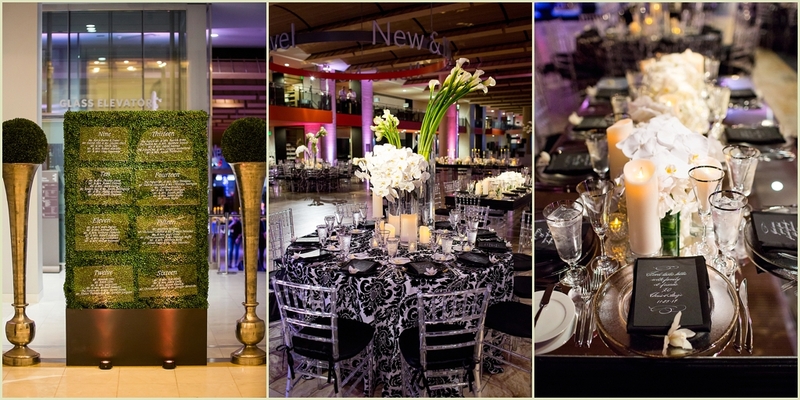 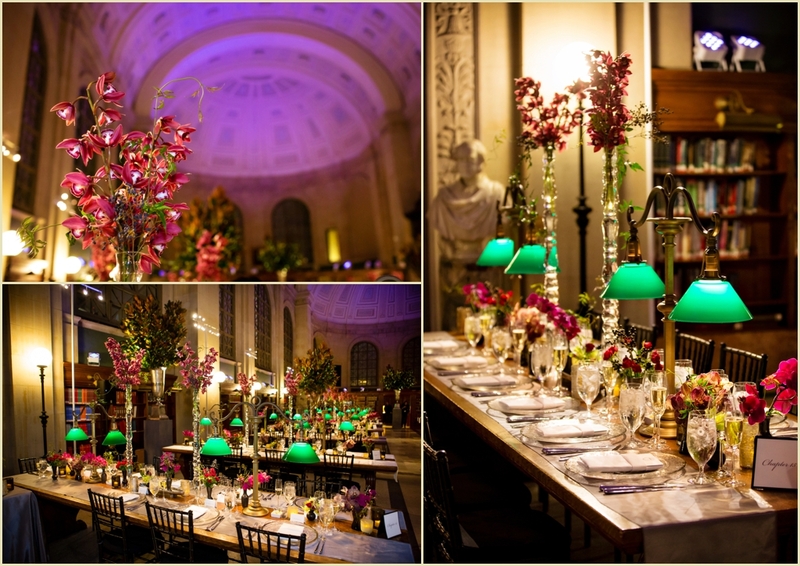 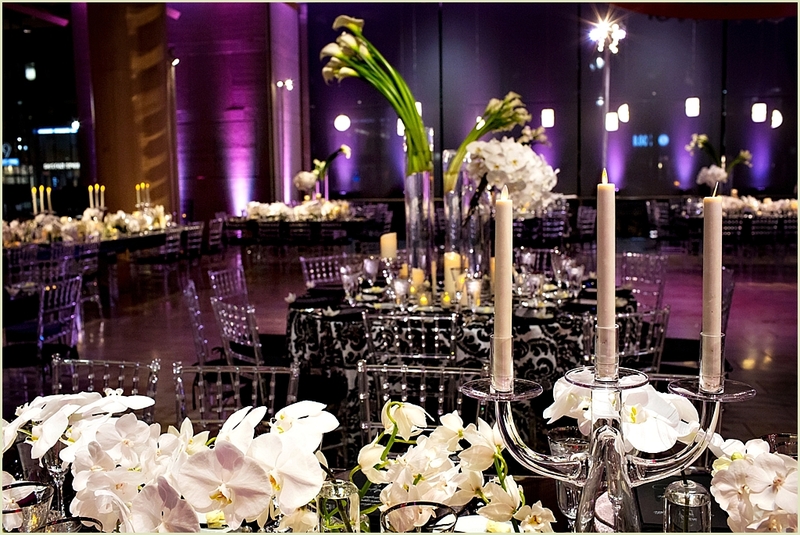 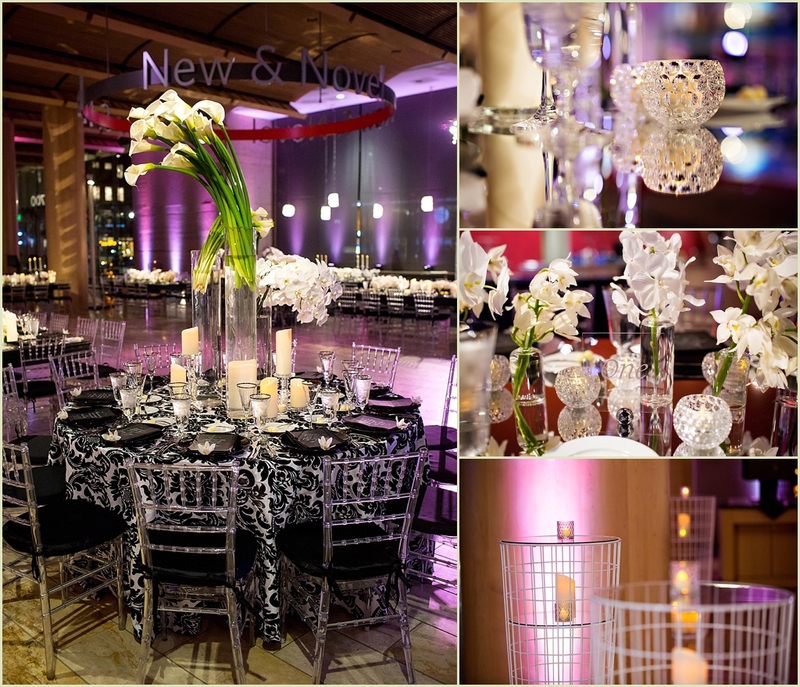 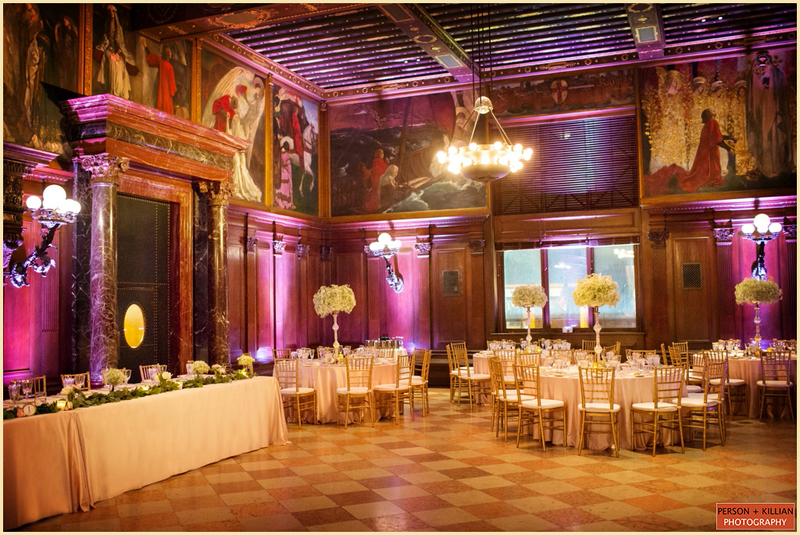 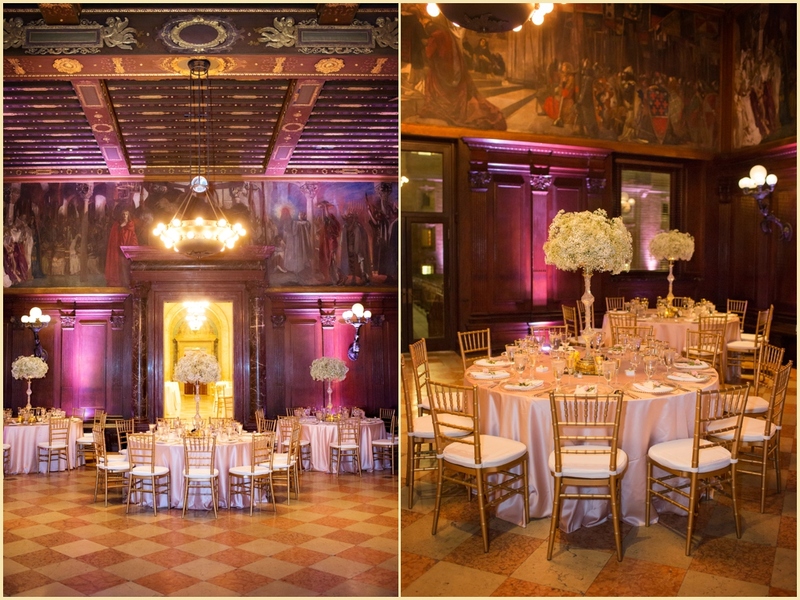 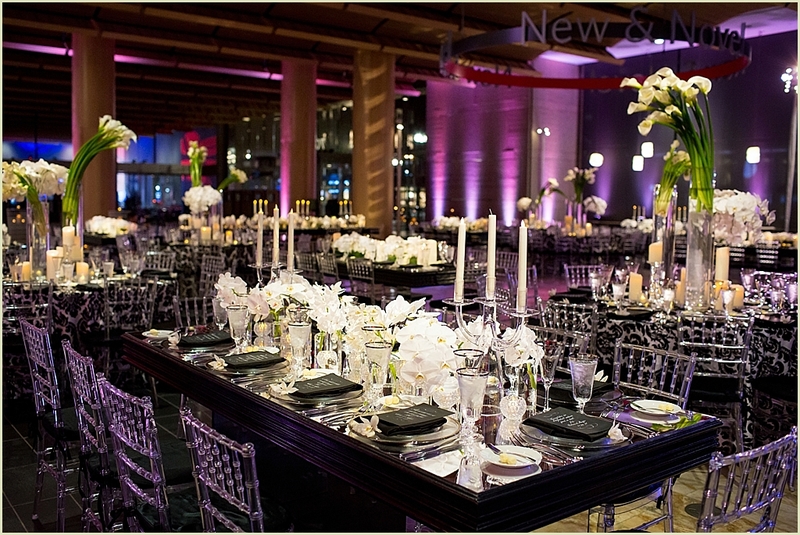 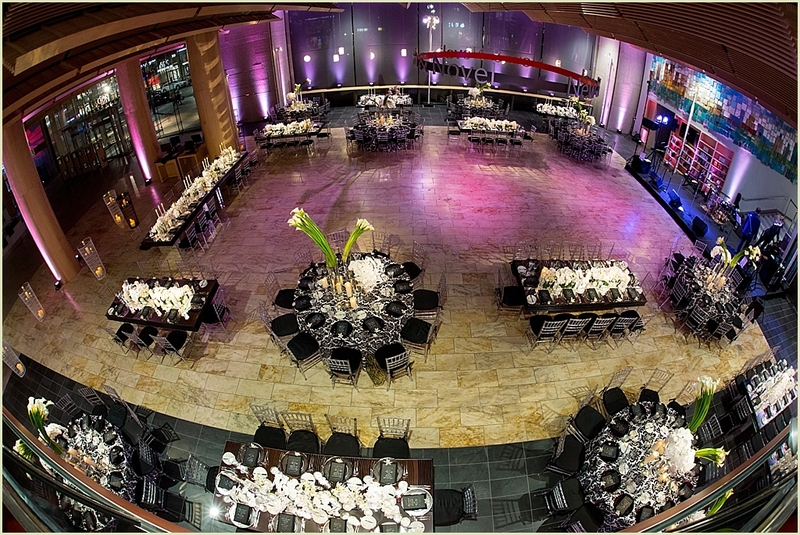 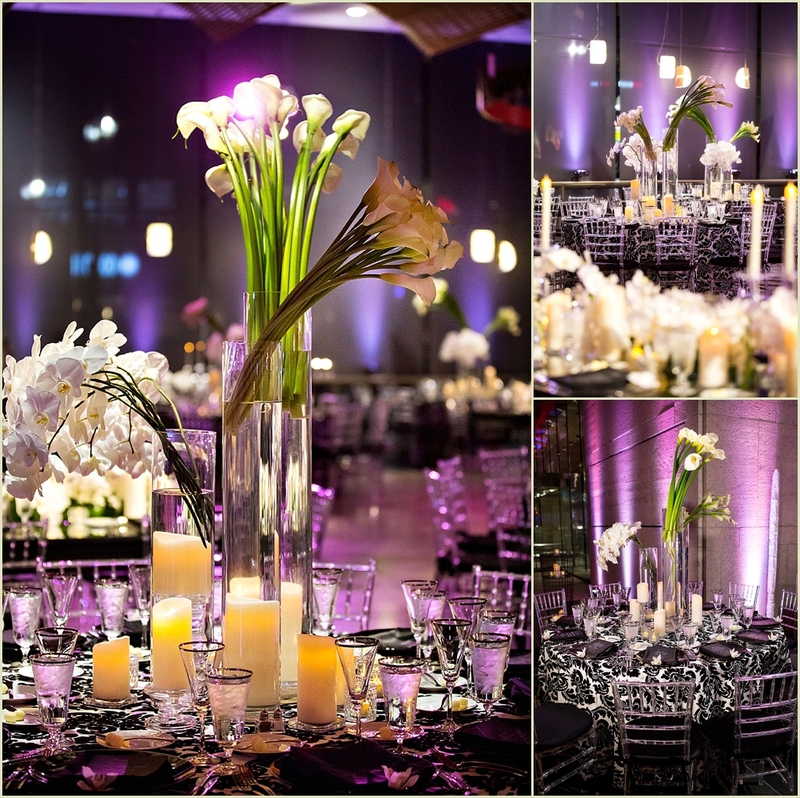 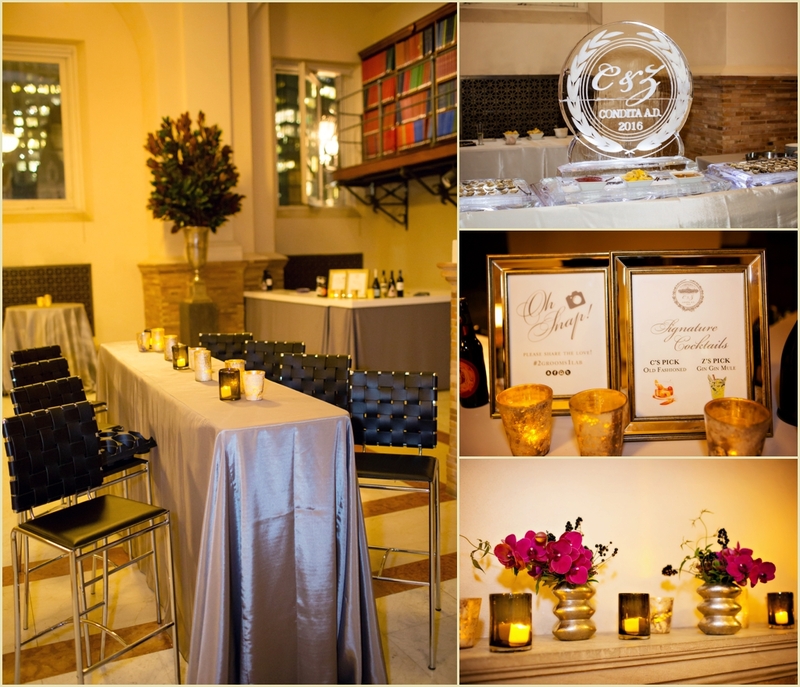 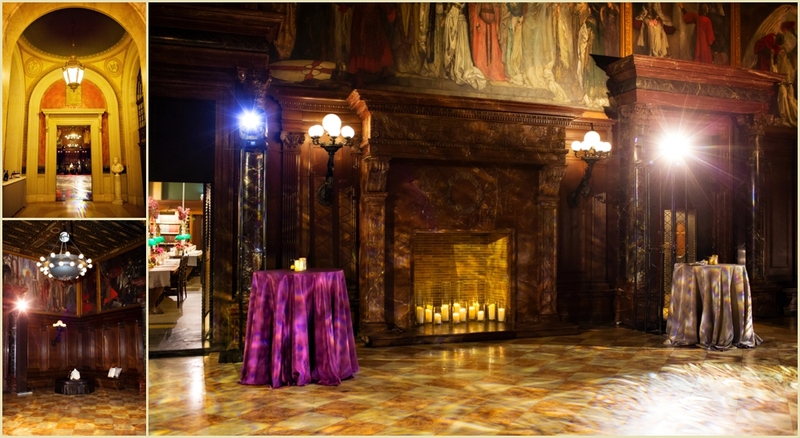 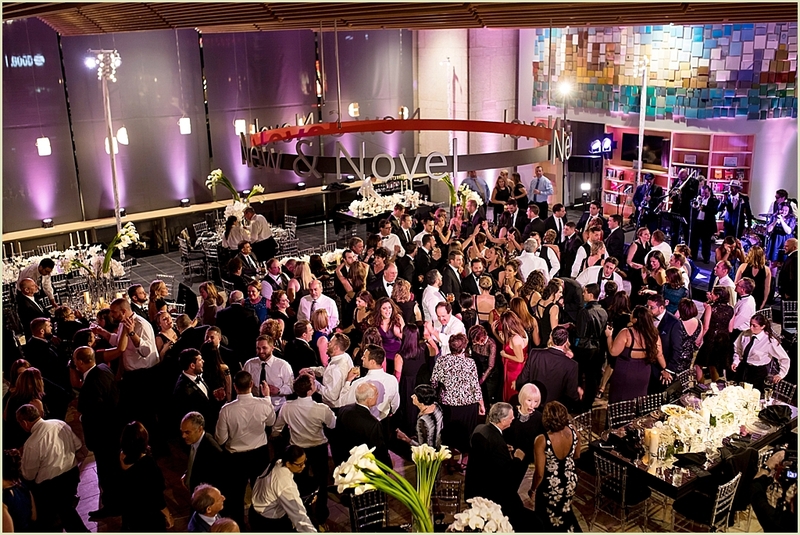 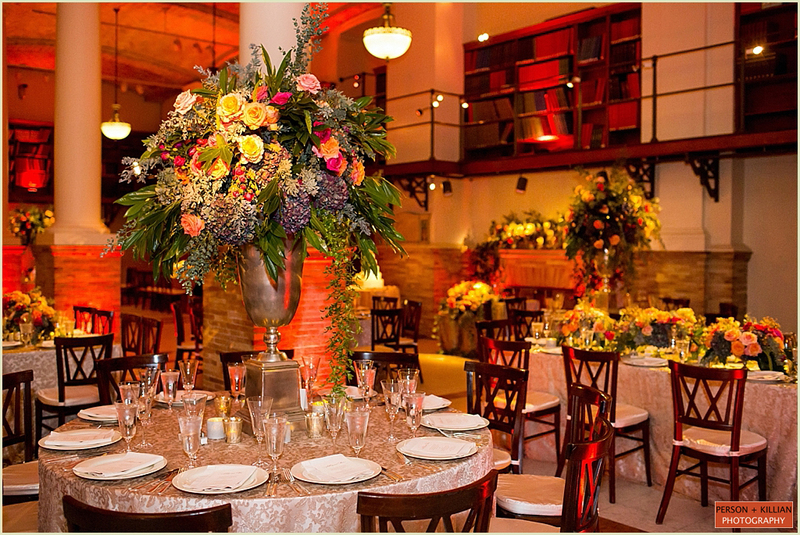 The Guastavino Room was transformed with a very modern flare for the evening celebration. 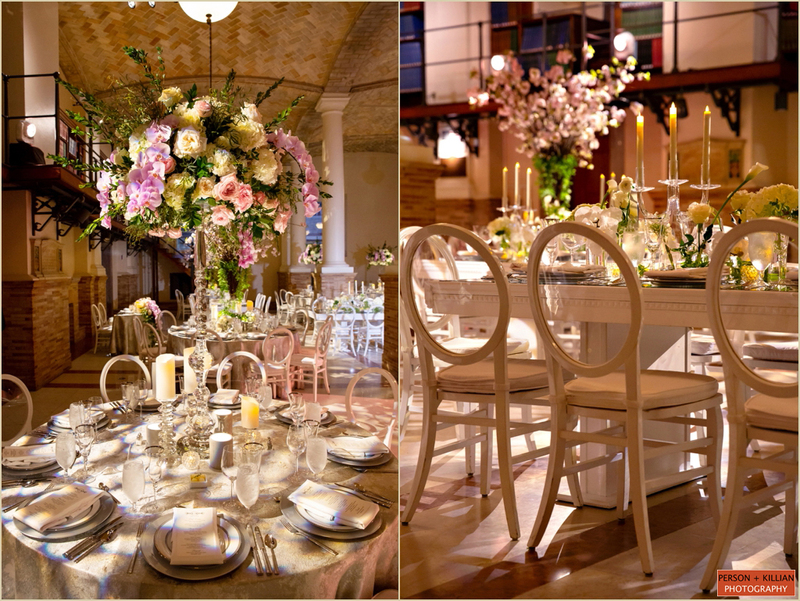 Metallic silver linens, mirror-top tables, gorgeous white chairs, and classic green, white, and pink floral arrangements filled this already beautiful space — the mix of modern decor with the classic old books and exposed brick of the Guastavino Room was just gorgeous. 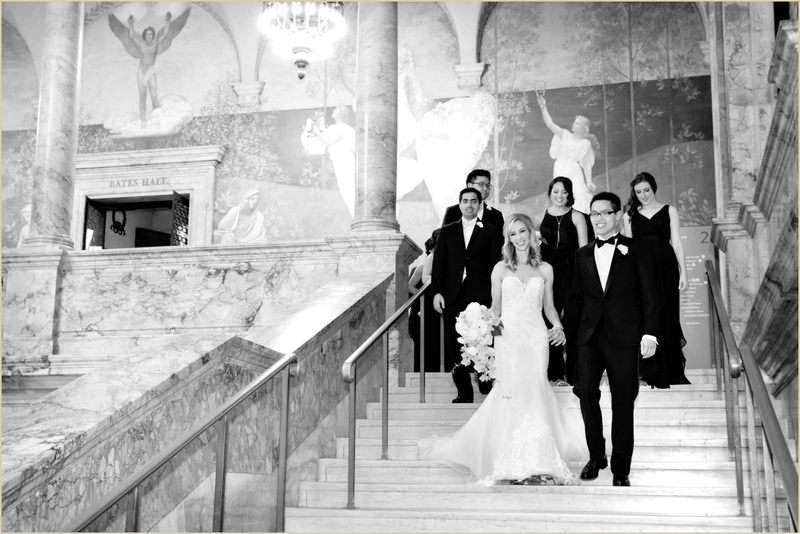 We were so happy to be a part of this wedding day — Laura and Mike could not have been sweeter and we wish them all the best in their next step on the West Coast! 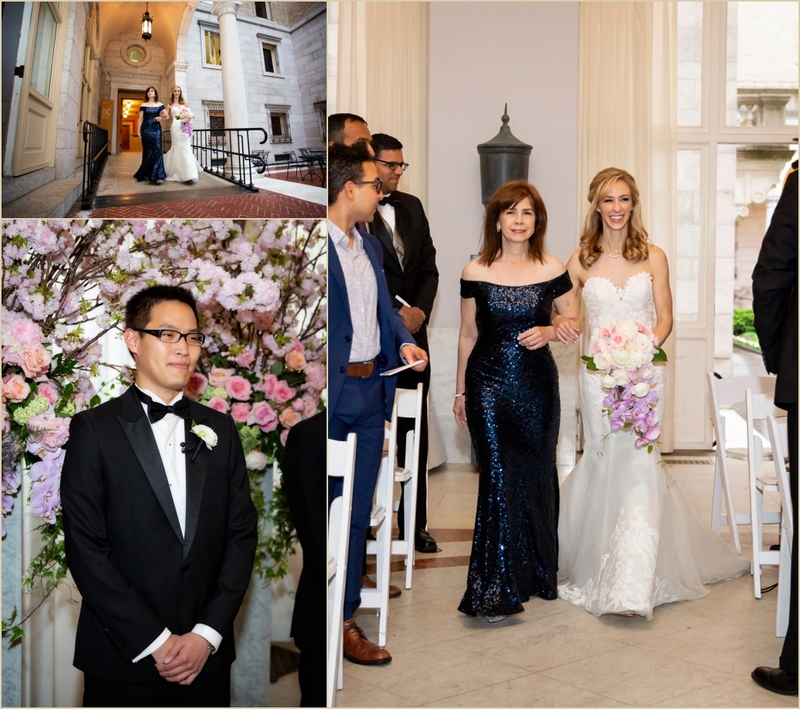 Special thanks to Alice Fay and the team at the Fairmont for giving us beautiful spaces for formal photos outside of the rain, and to Faith and The Catered Affair team at the Boston Public Library. 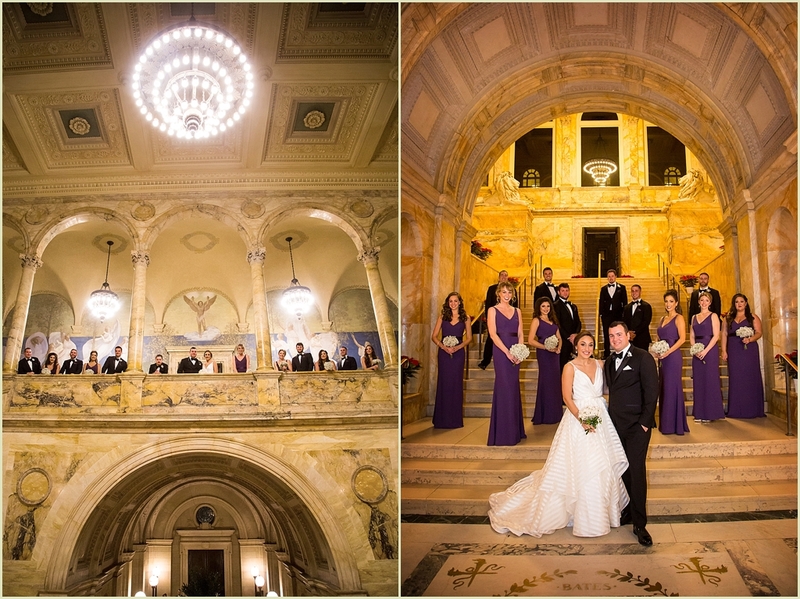 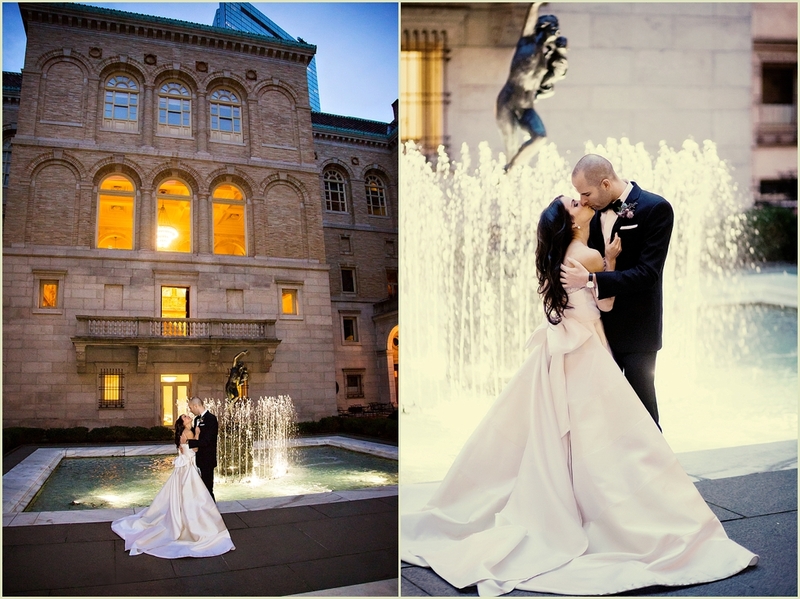 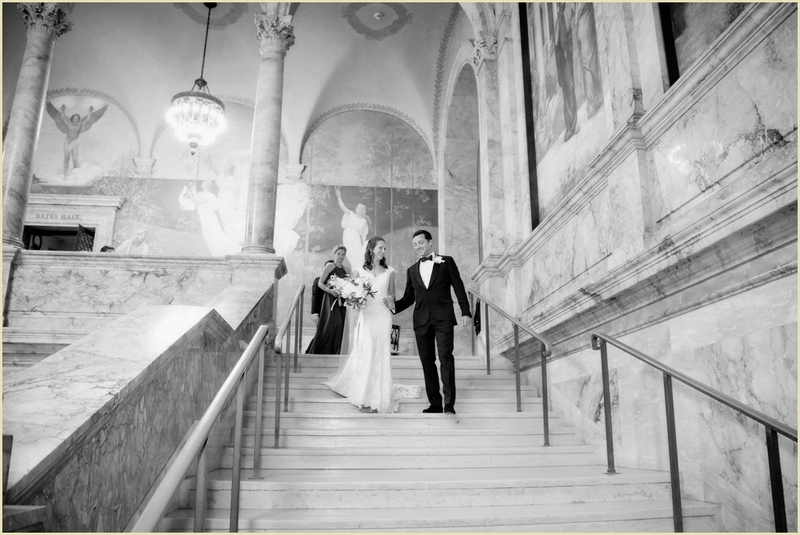 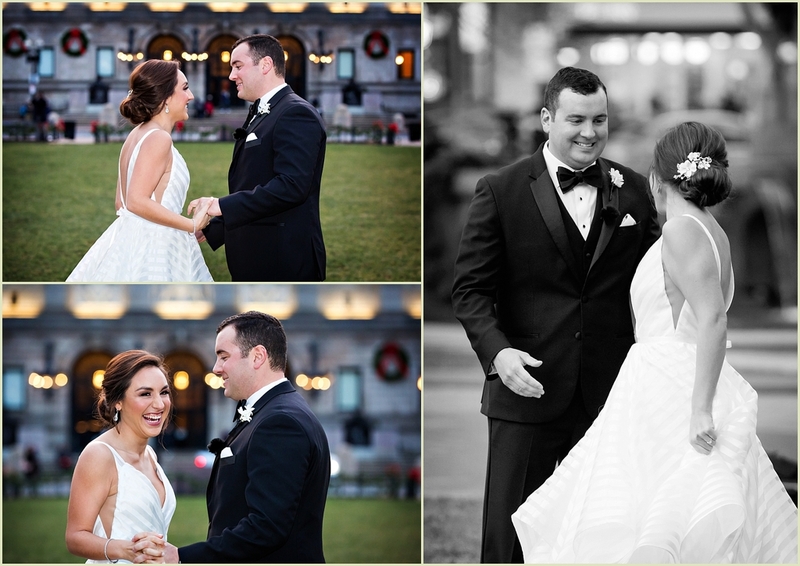 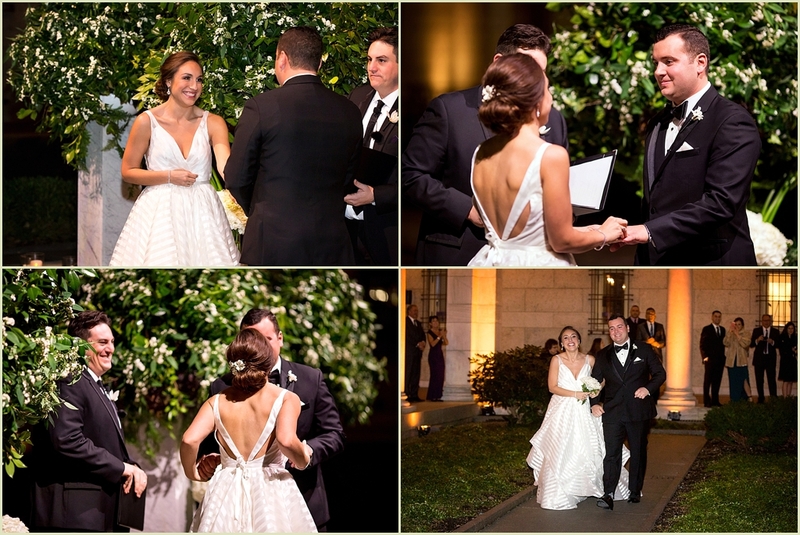 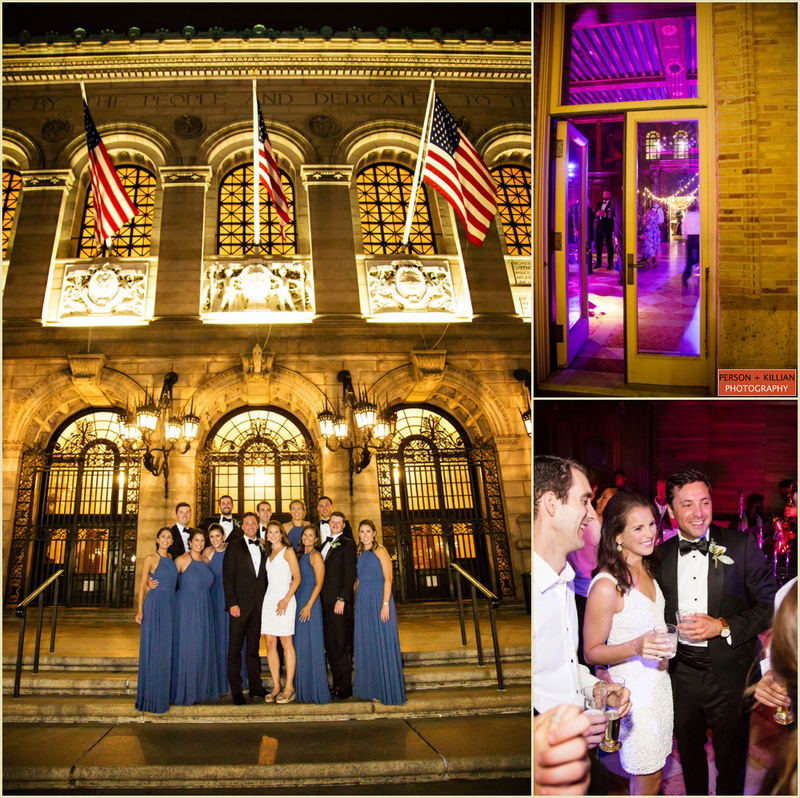 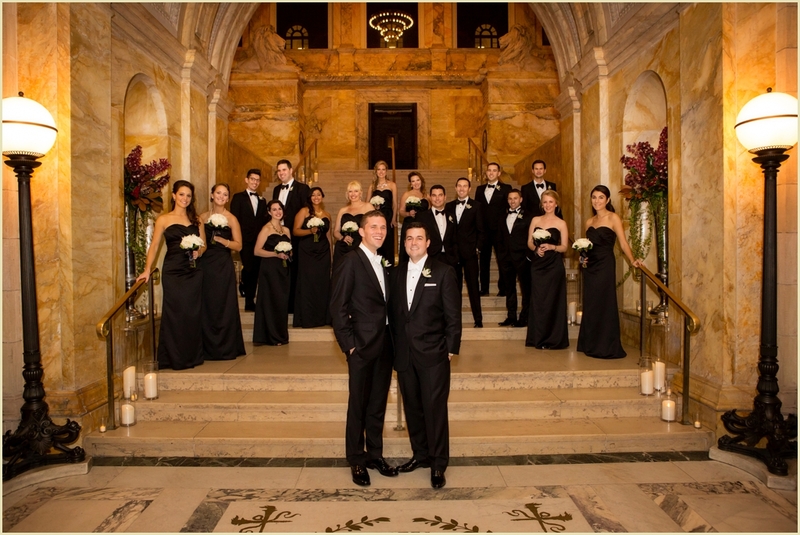 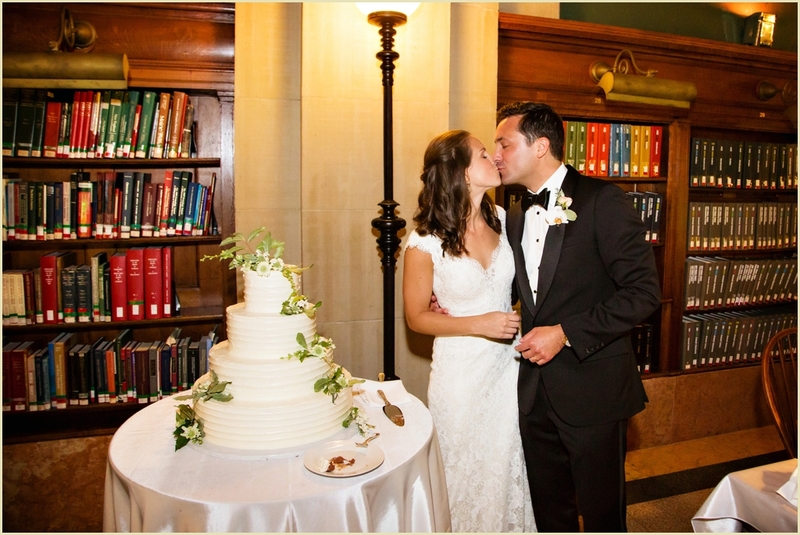 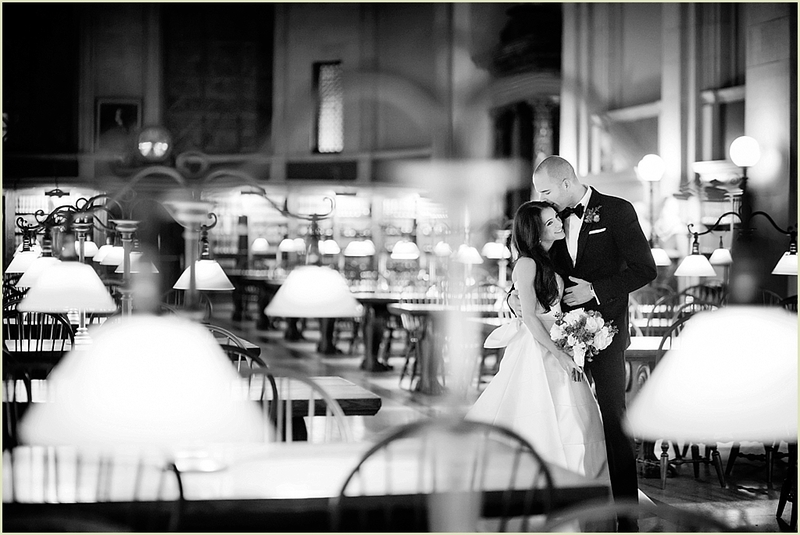 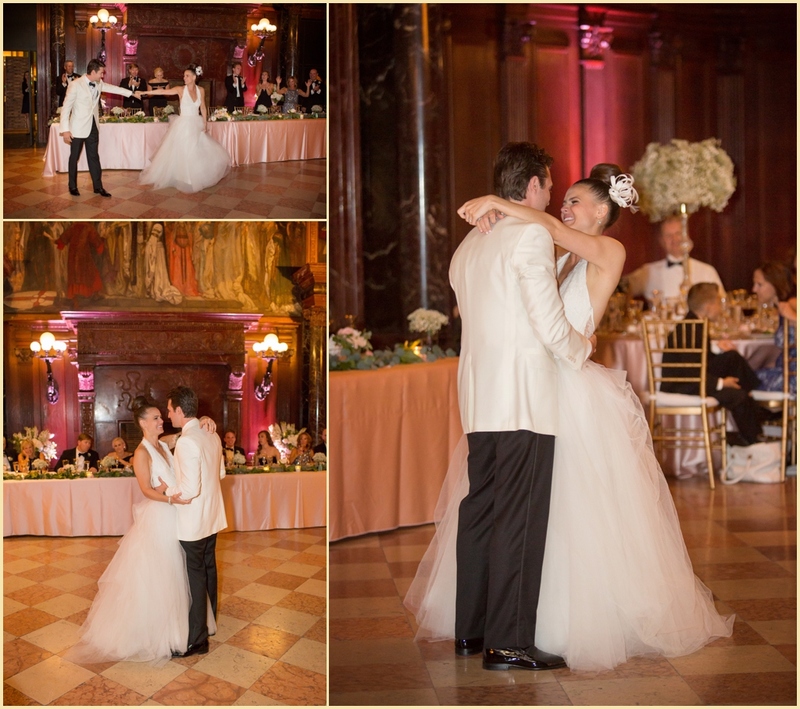 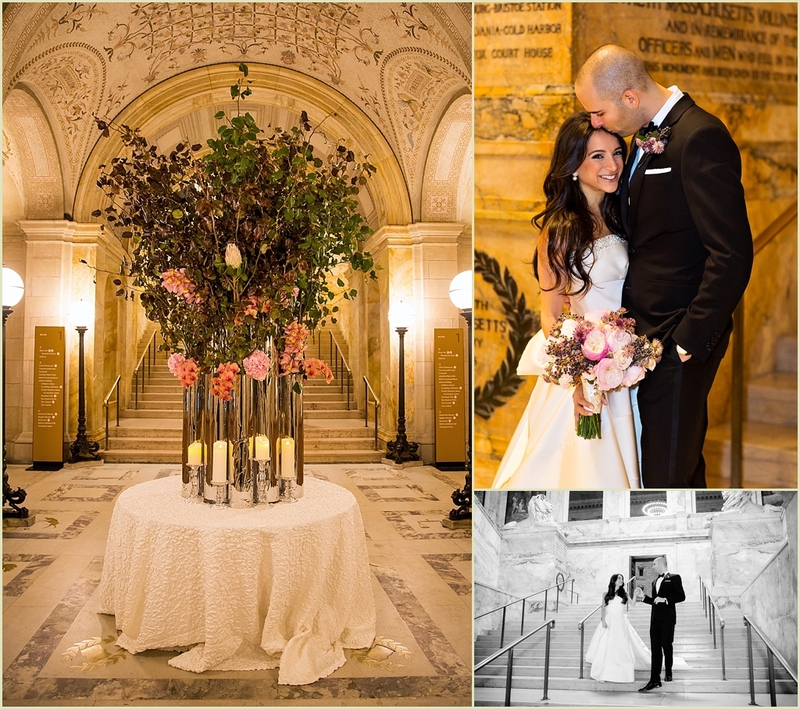 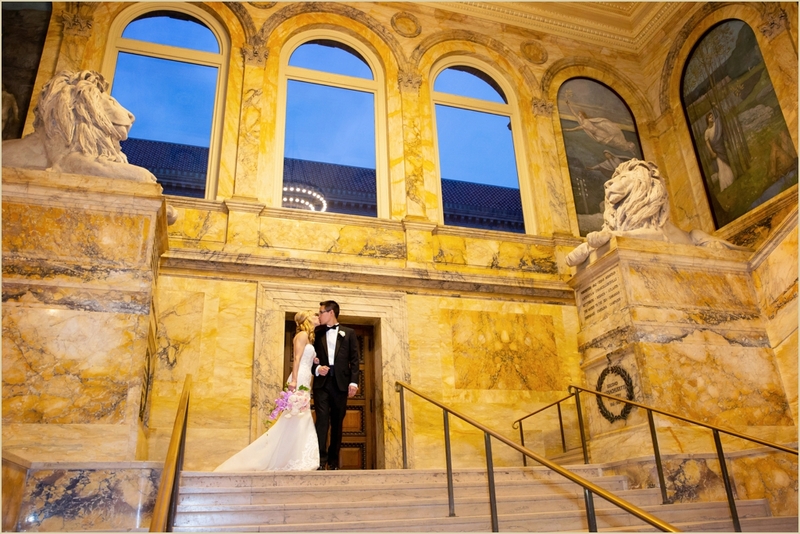 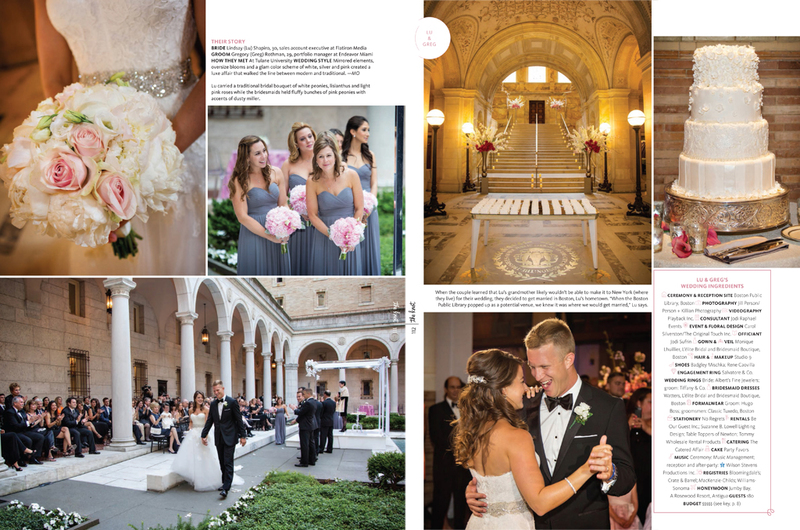 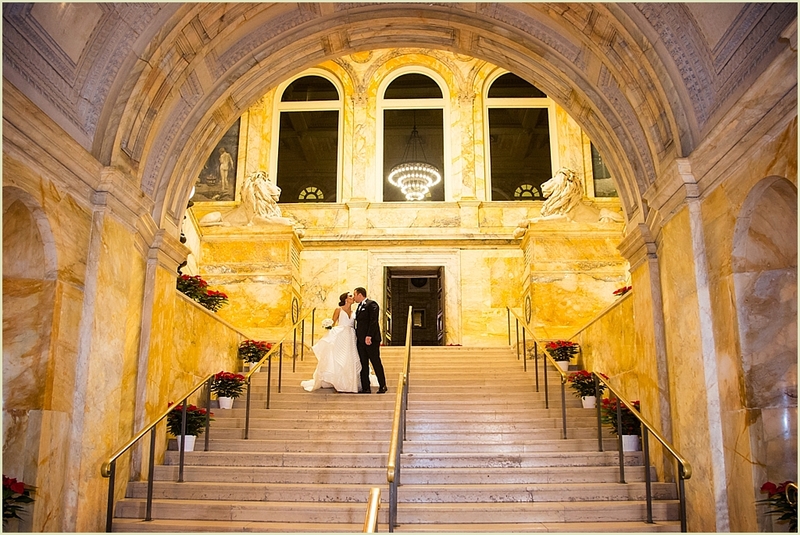 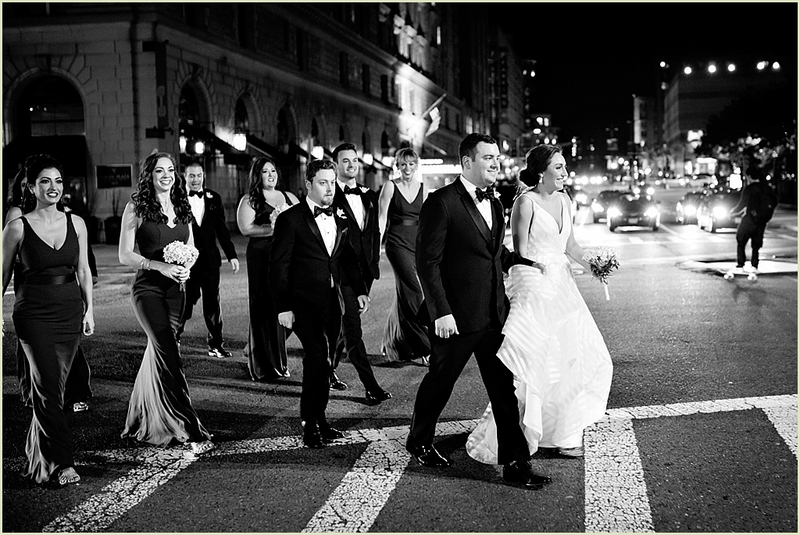 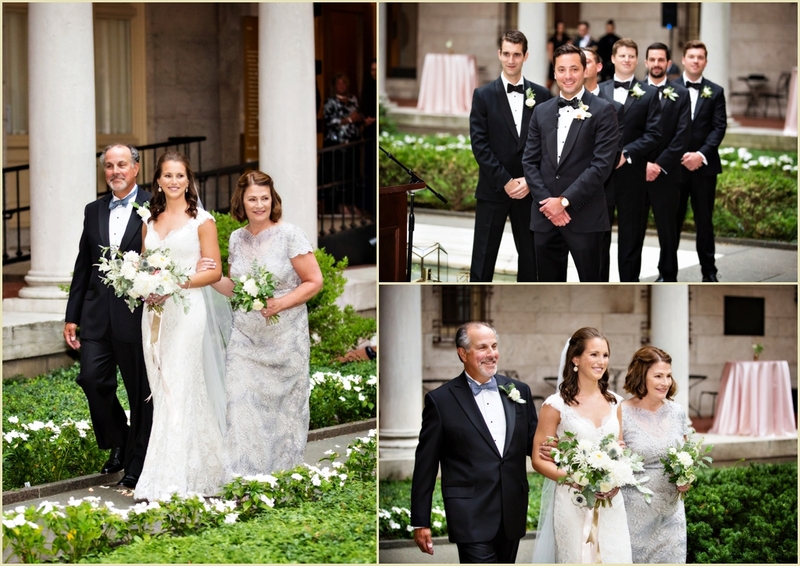 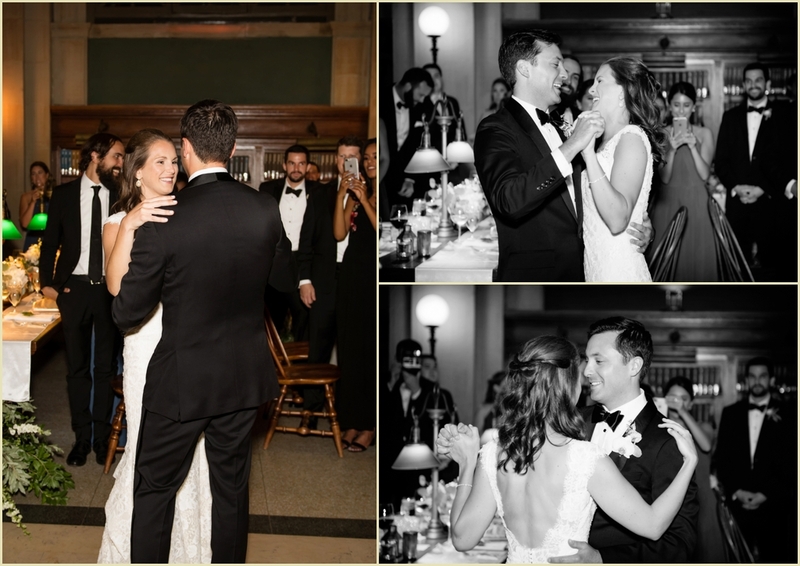 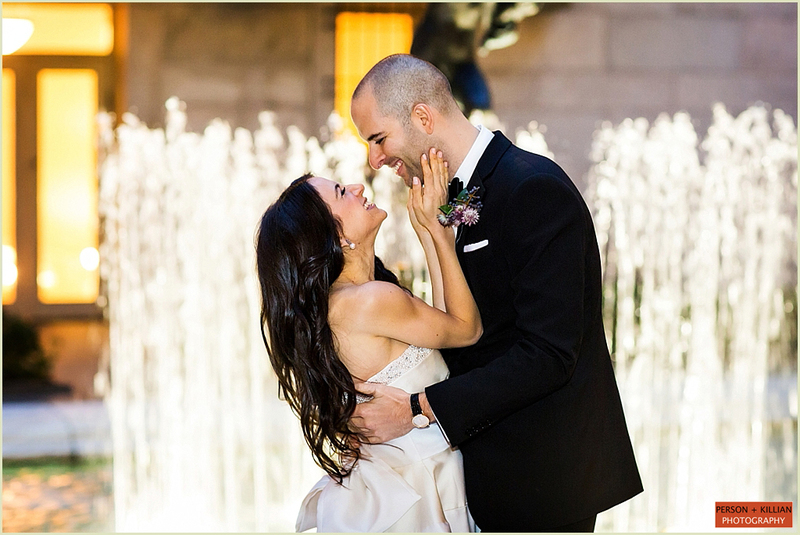 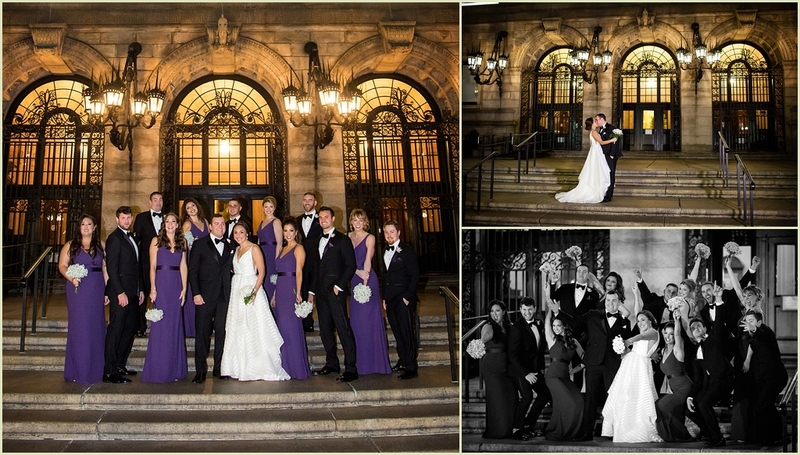 It was destination Boston for New York couple Ashley and Ben for their Boston Public Library wedding. 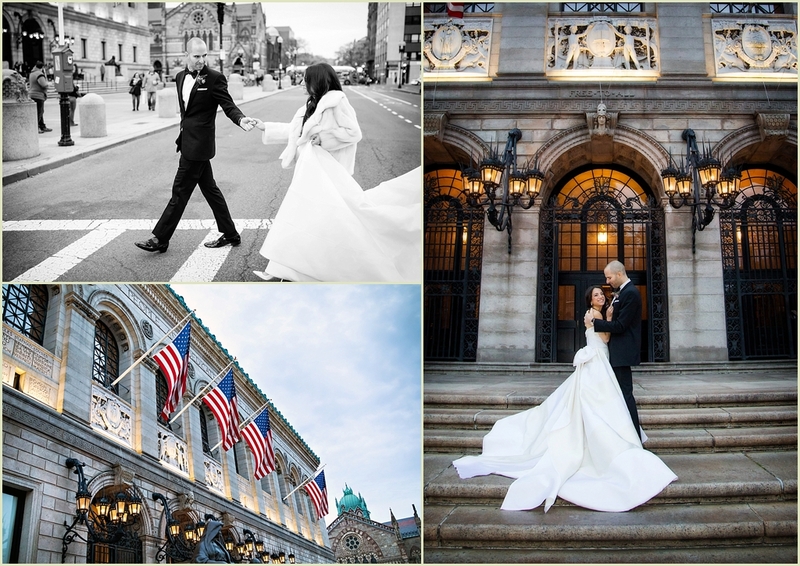 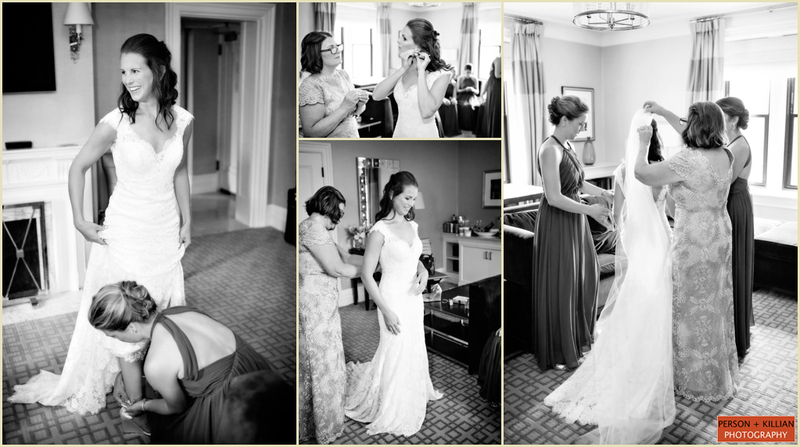 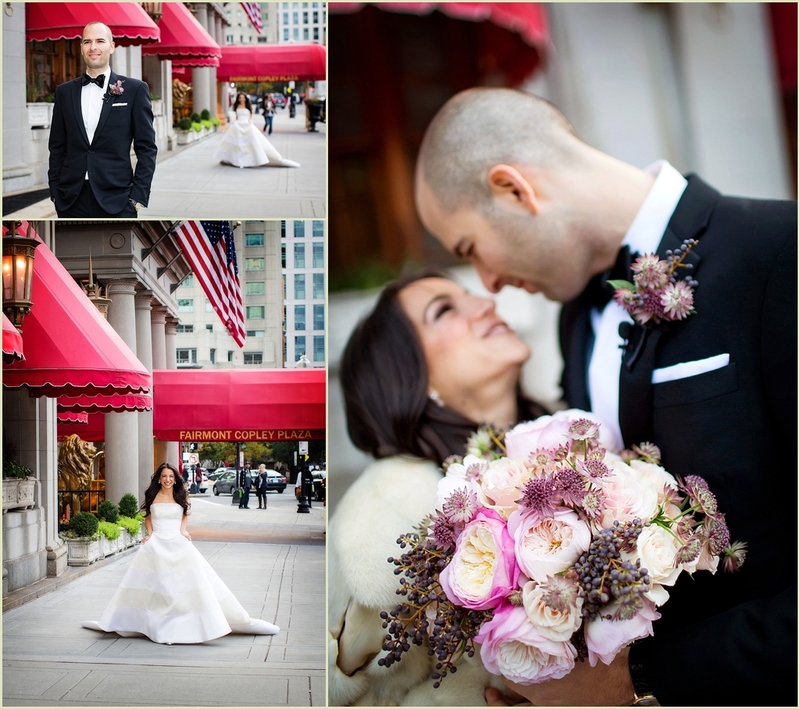 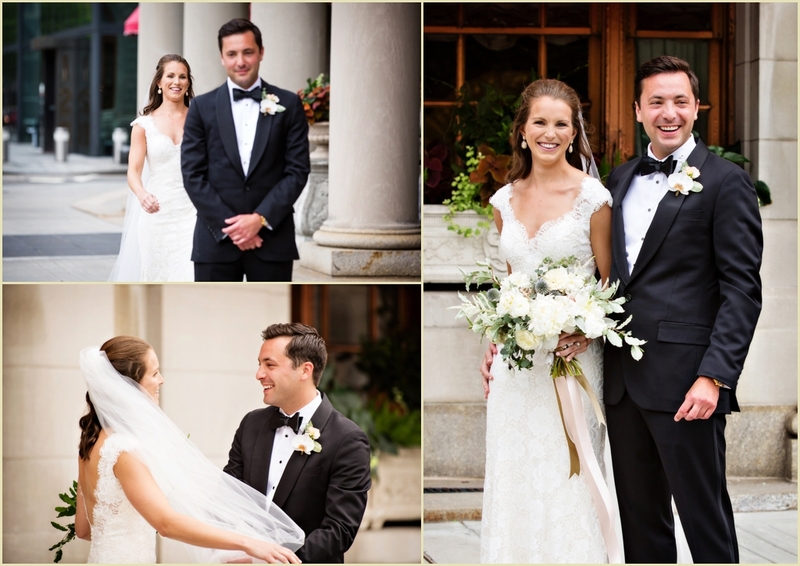 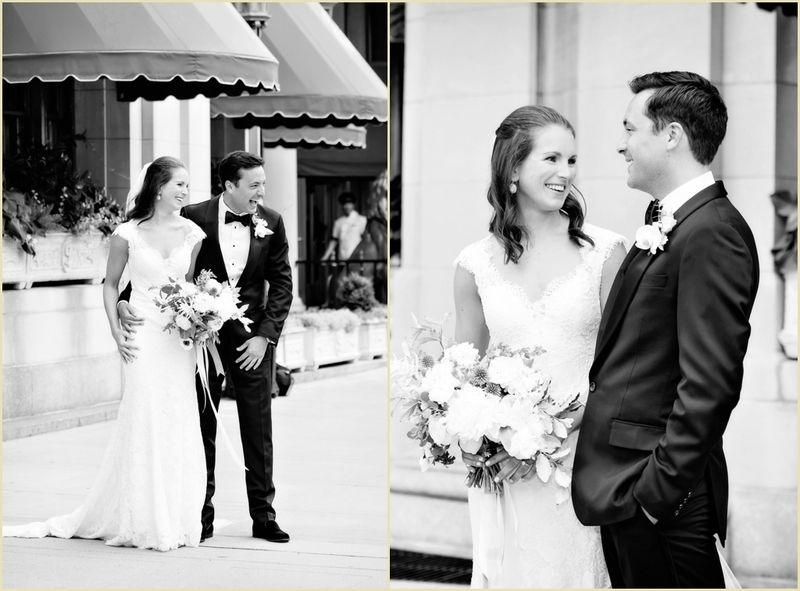 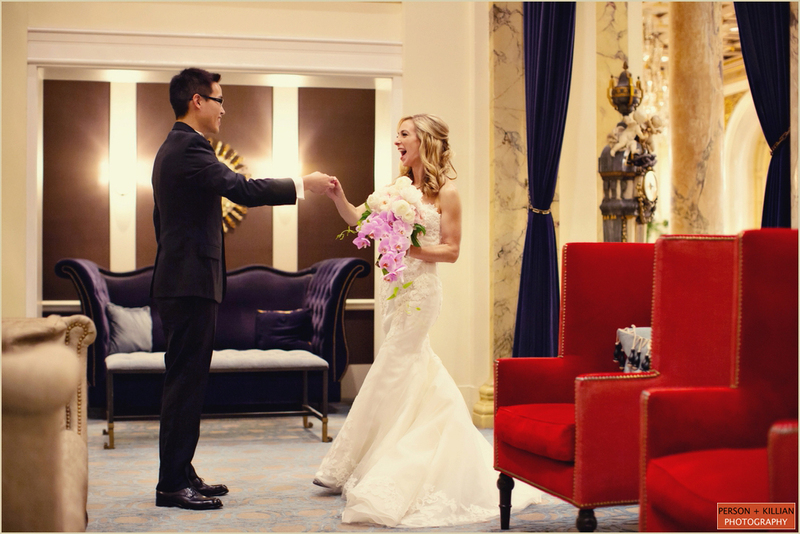 Everything about their day from getting ready and the first look at the picturesque Fairmont Copley Plaza to their ceremony and reception at the library was picture perfect and we are so happy to have been chosen to capture the day for this great couple. 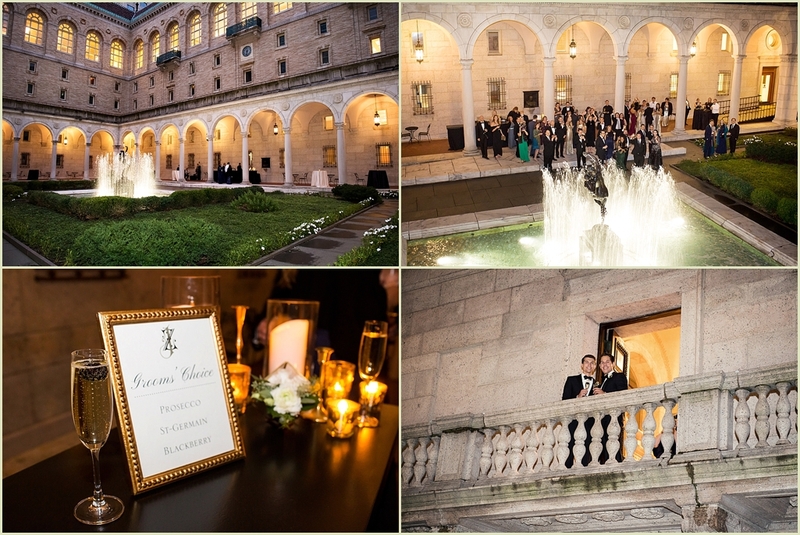 A big thank you to Bryanne, Erica and their team at The Catered Affair at the Boston Public Library and congratulations Ashley and Ben! 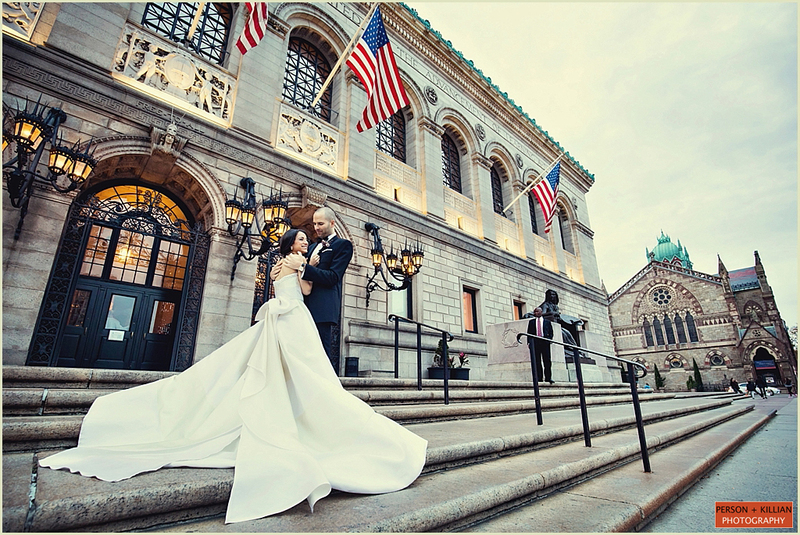 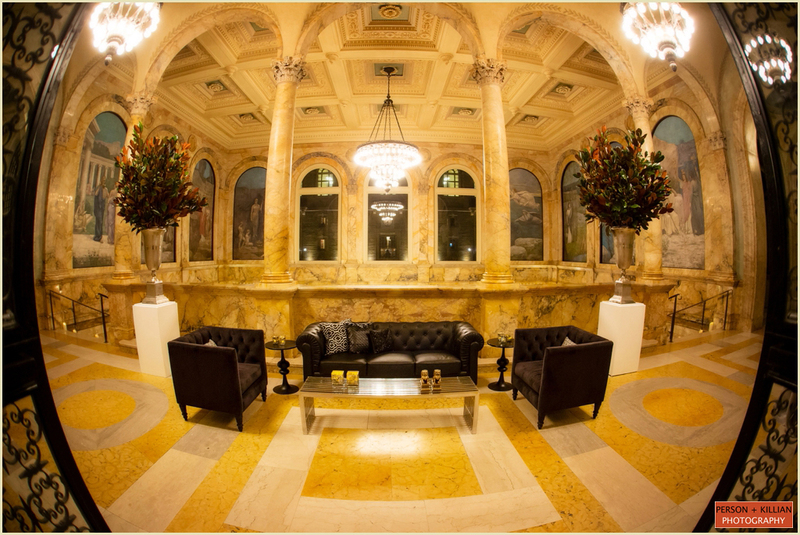 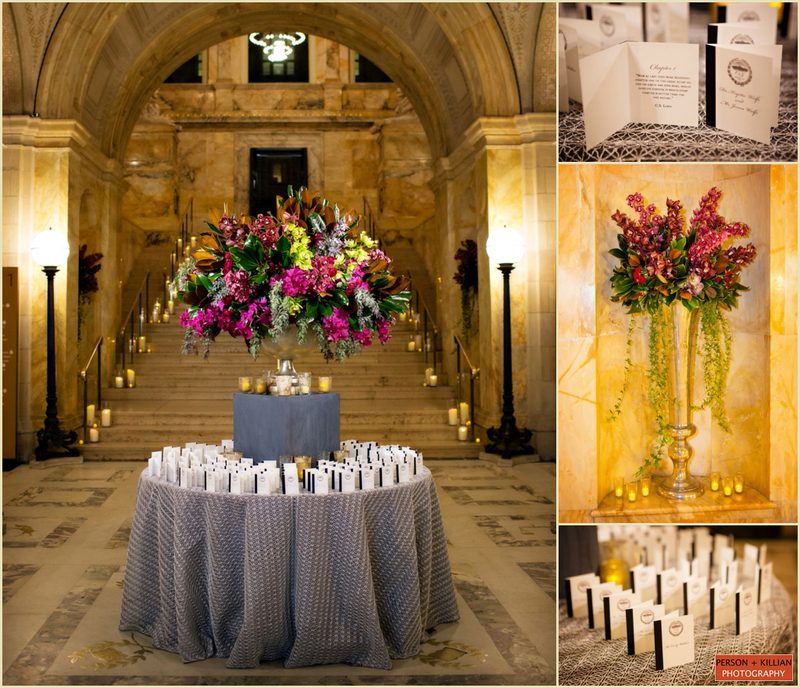 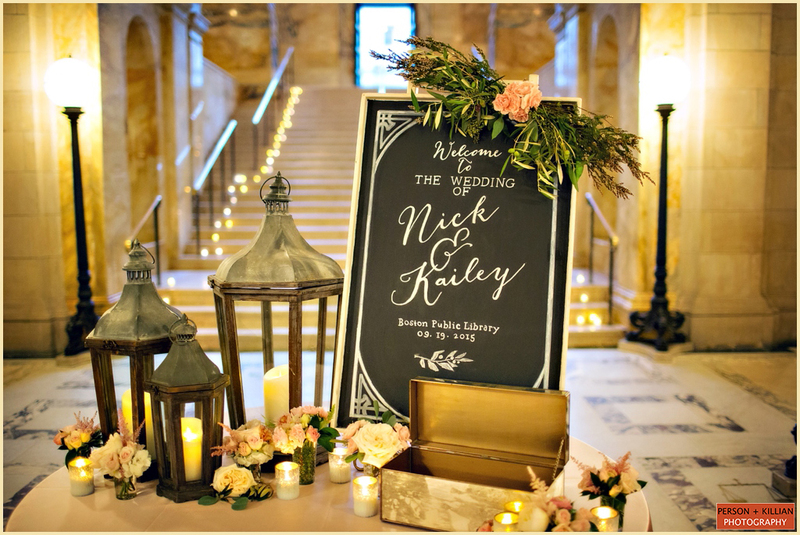 This beautiful Boston Public Library wedding in Copley Square was a true tribute to all things “Boston”. 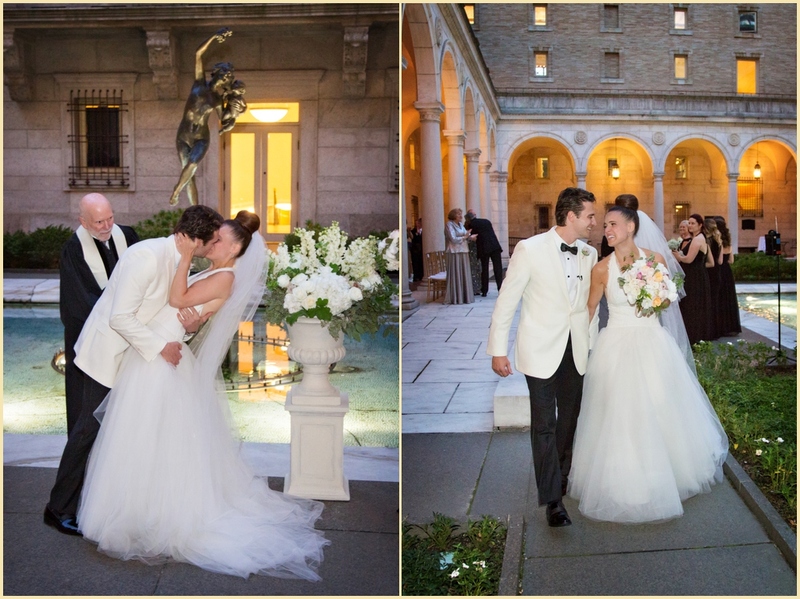 Joc and Zac first met while both attending Harvard University (Joc was on the swim team while Zac was on the diving team), and their Fall wedding day incorporated both a tribute to Boston’s rich history as well as a modern nod to the city’s bright future. 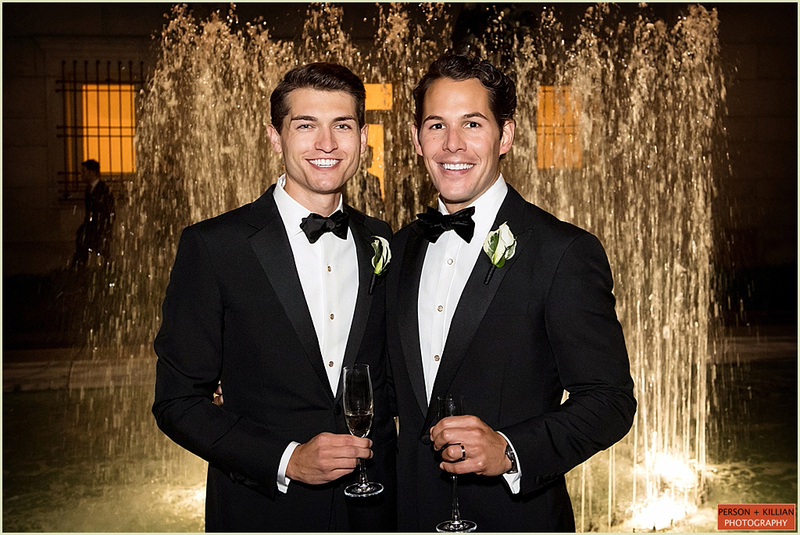 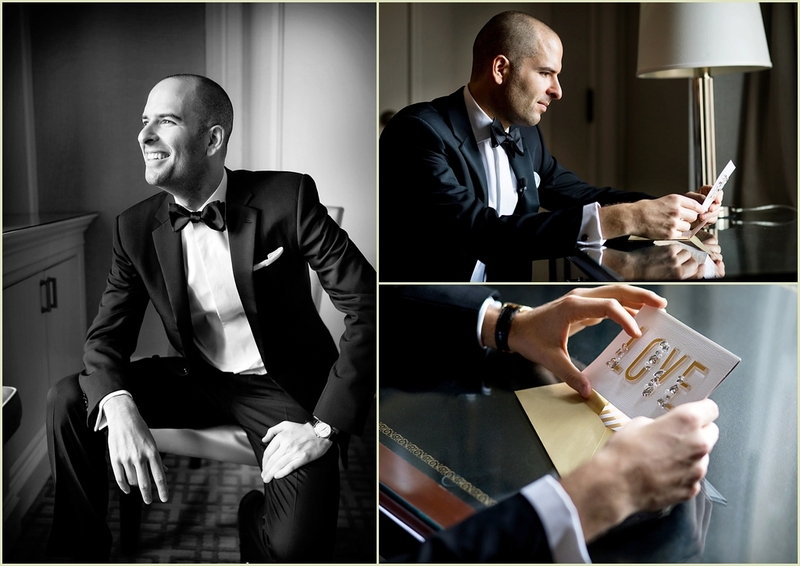 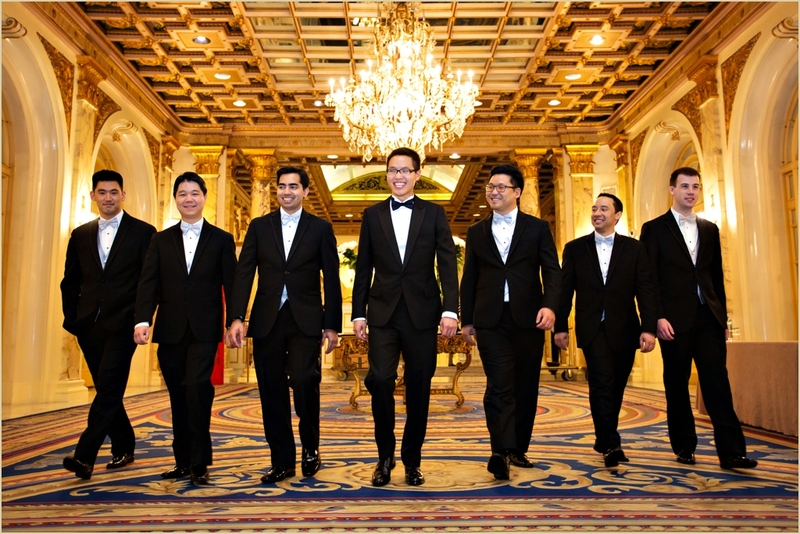 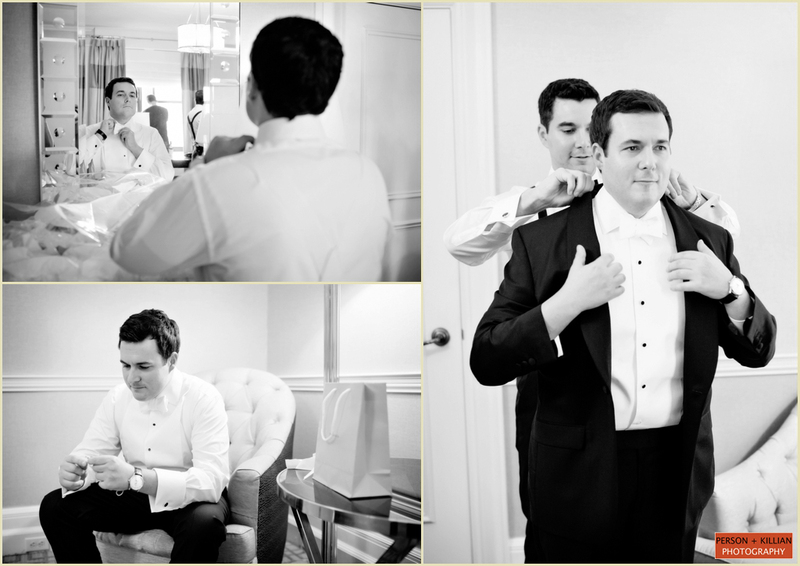 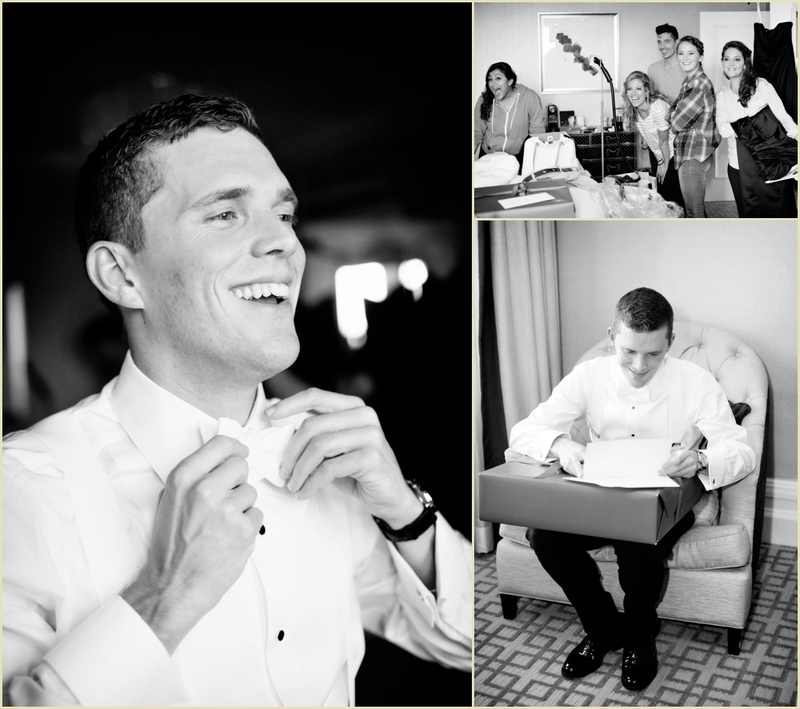 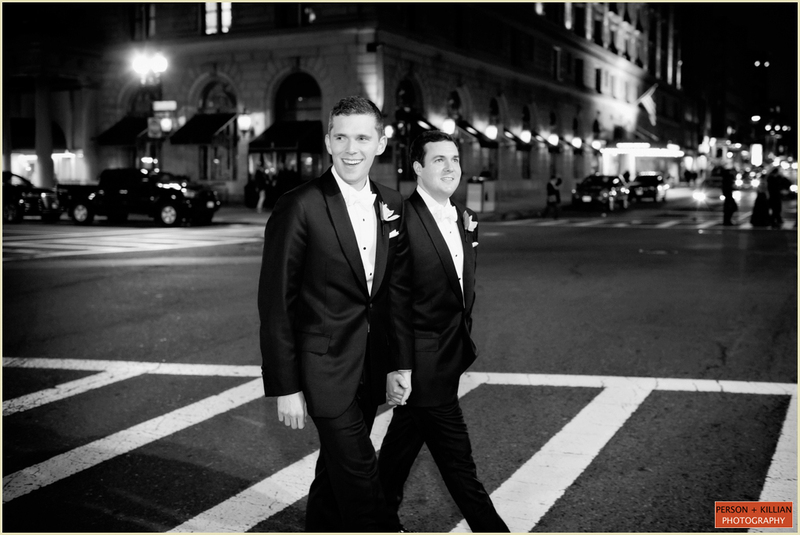 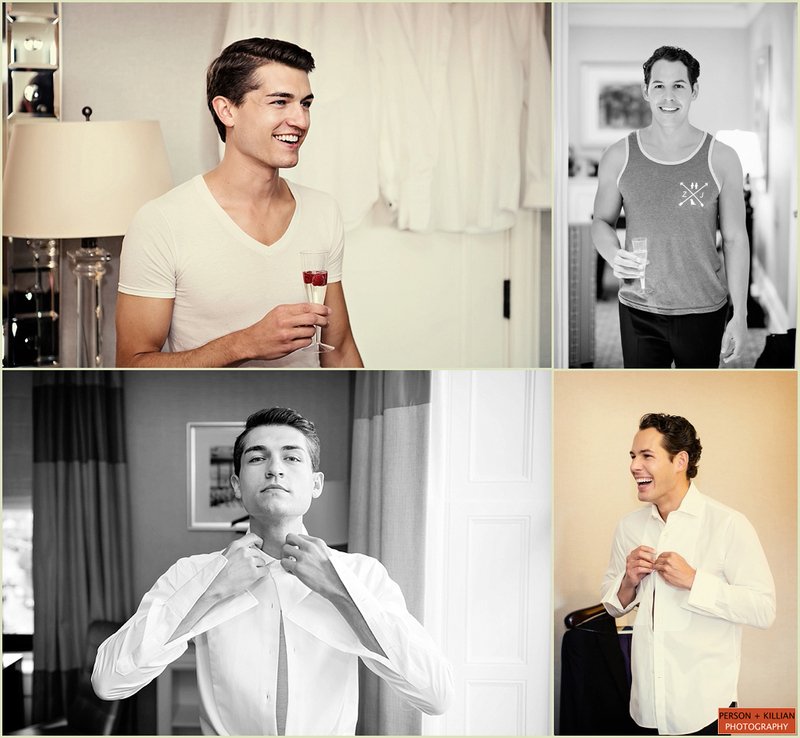 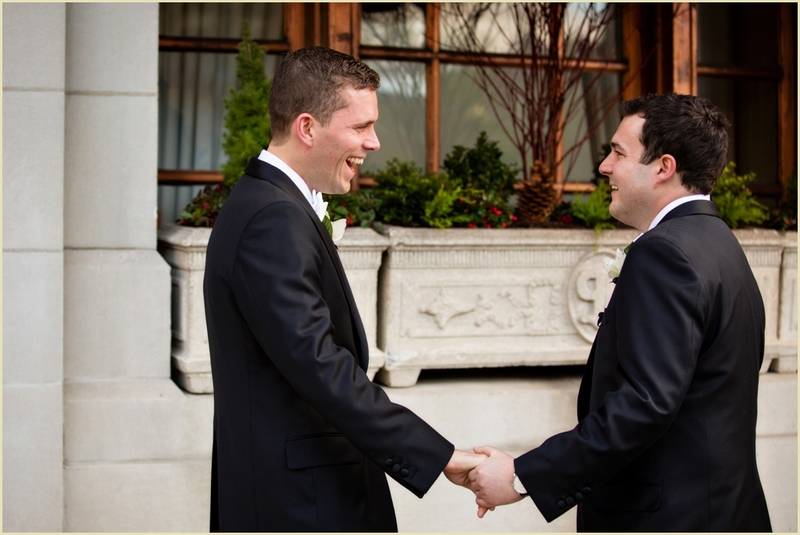 The entire wedding celebration took place in Boston’s Copley Square, starting with both grooms getting ready at the Fairmont Copley Boston. 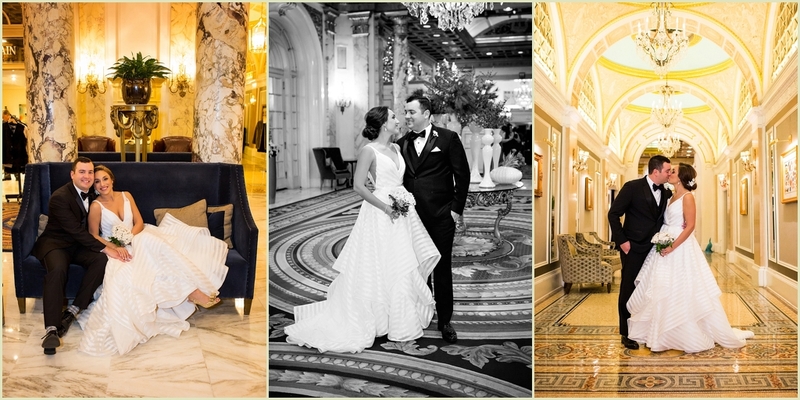 They had their first look inside the hotel, before heading outside for some formal photos. 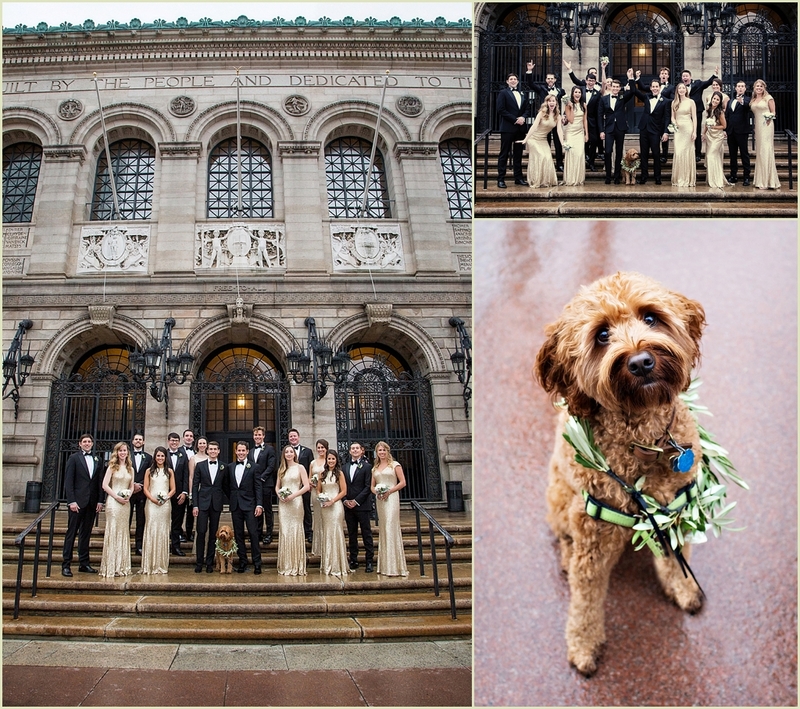 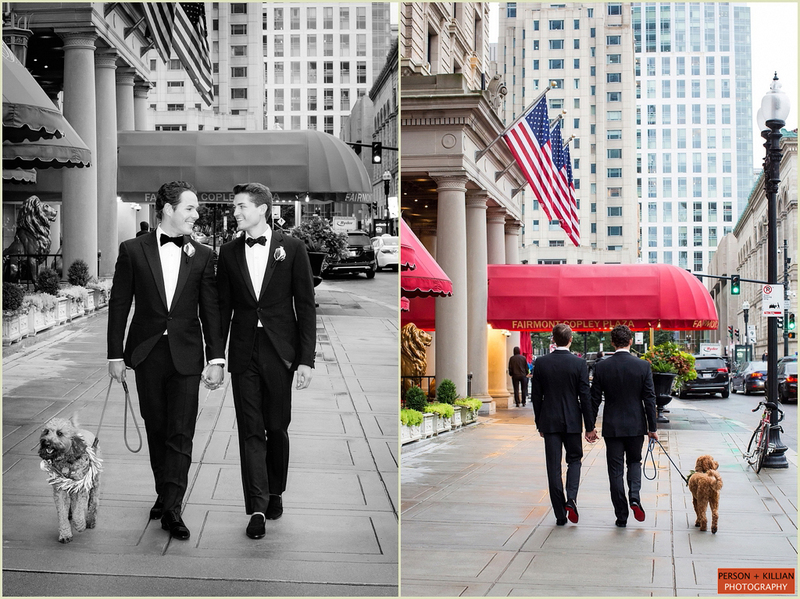 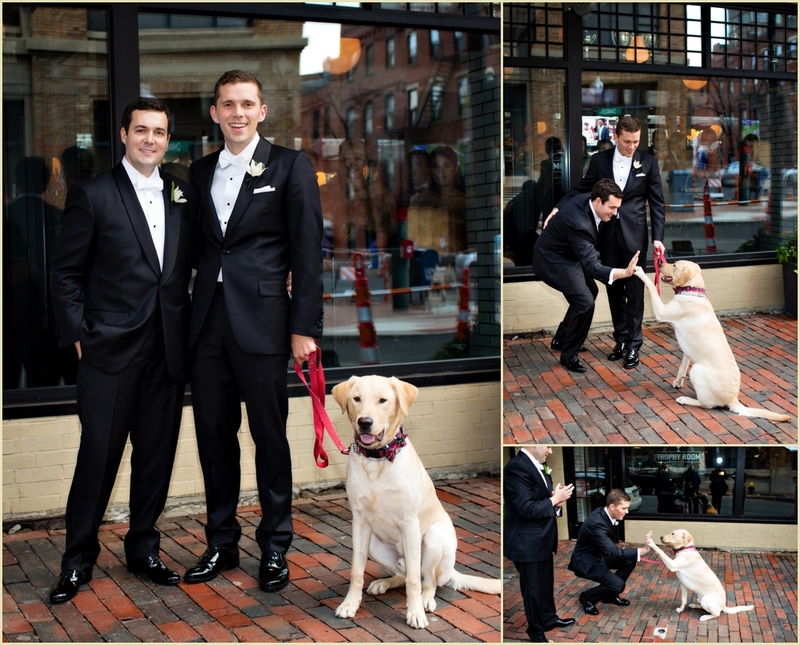 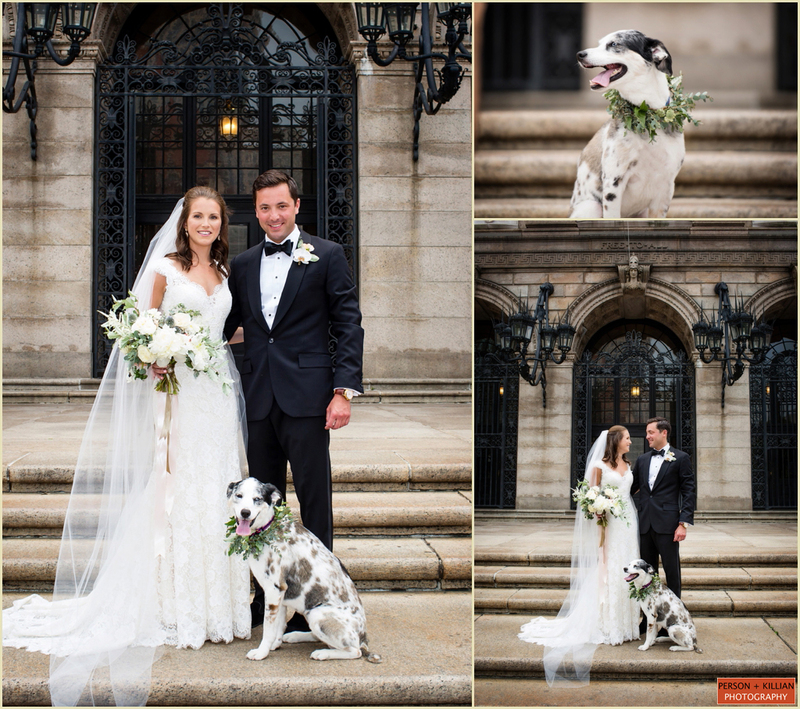 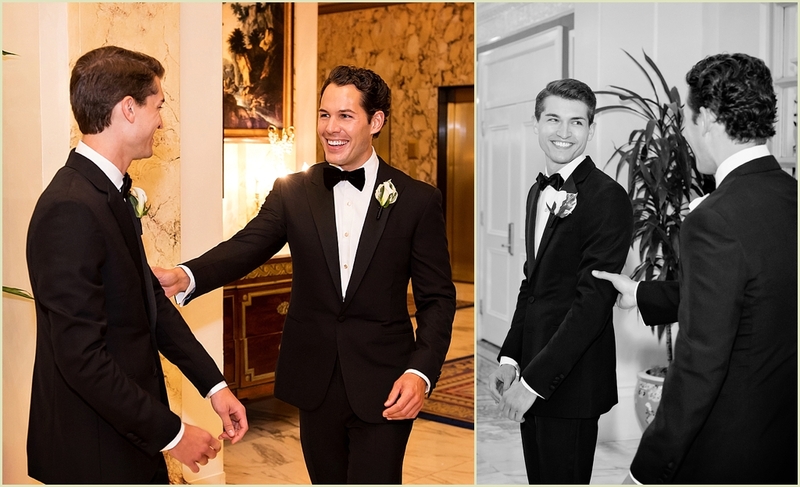 The couple was joined by their handsome labradoodle Winston (who also made an appearance in Joc and Zac engagement photos last Fall) as well as their wedding party for photos around Copley Square and inside the Boston Public Library. 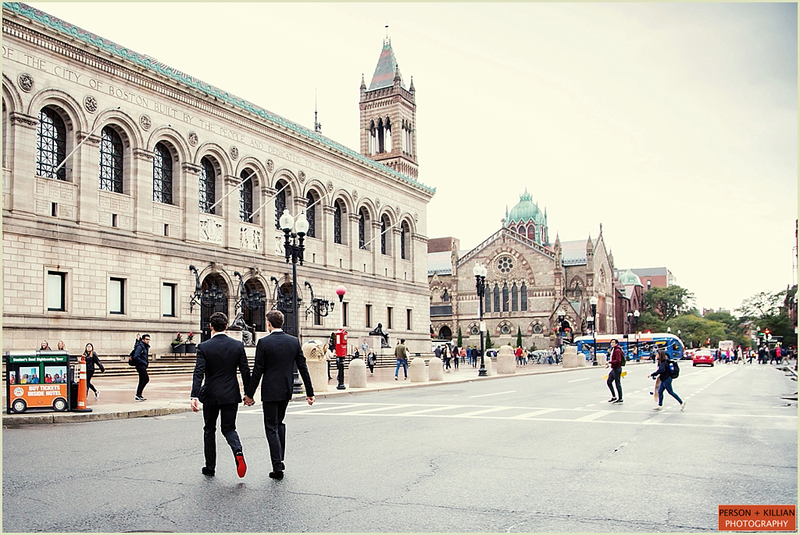 The wedding ceremony was held inside Boston’s Old South Church, a significant site in Boston’s history, and included a reading from the 2004 legalization of gay marriage in the state of Massachusetts. 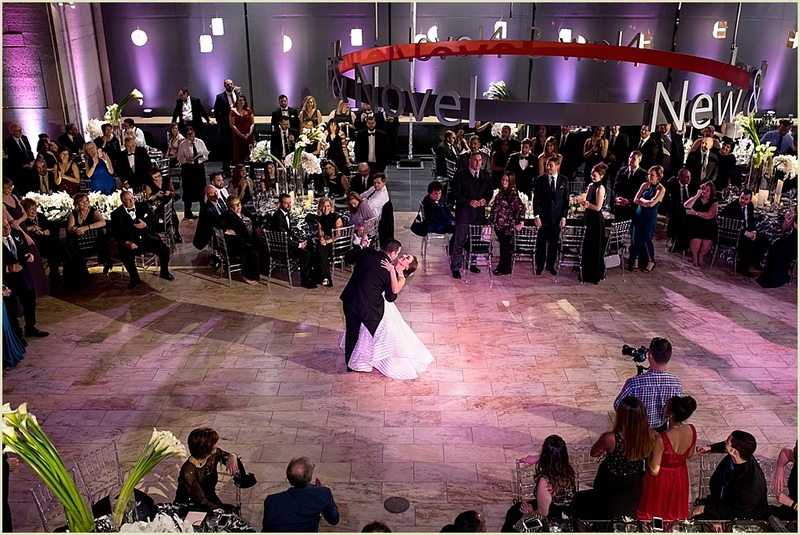 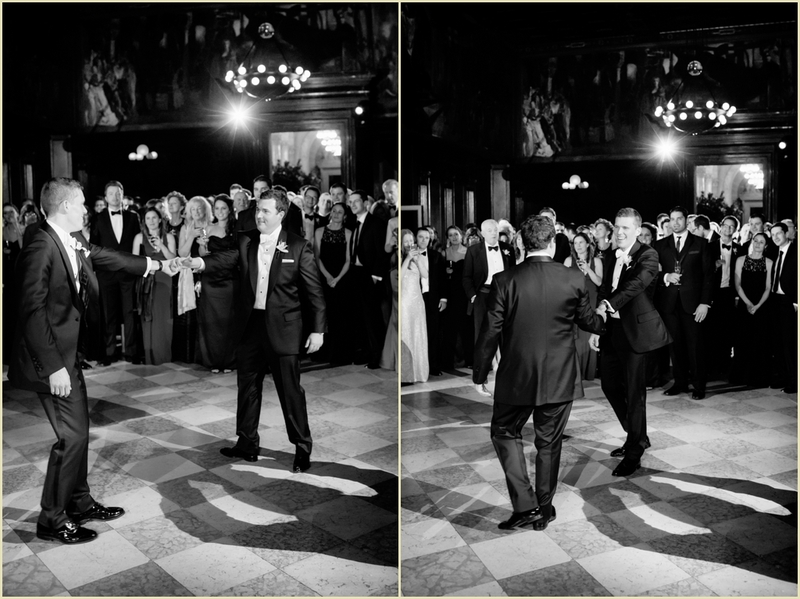 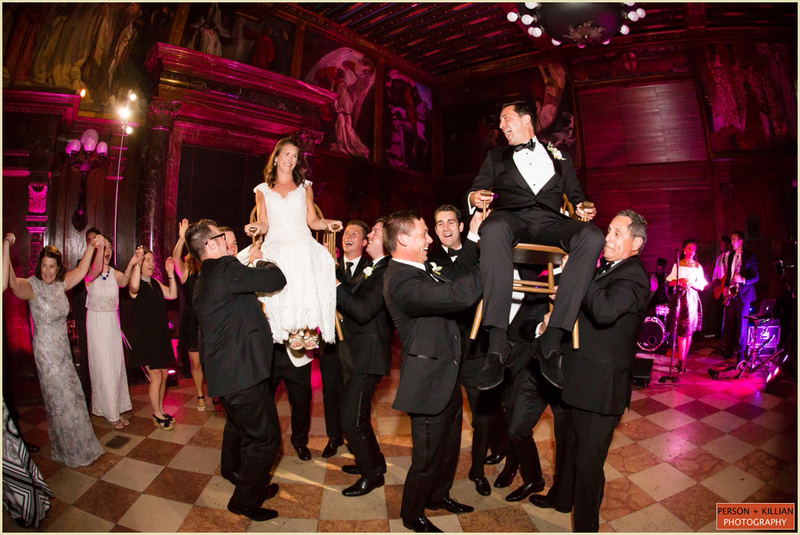 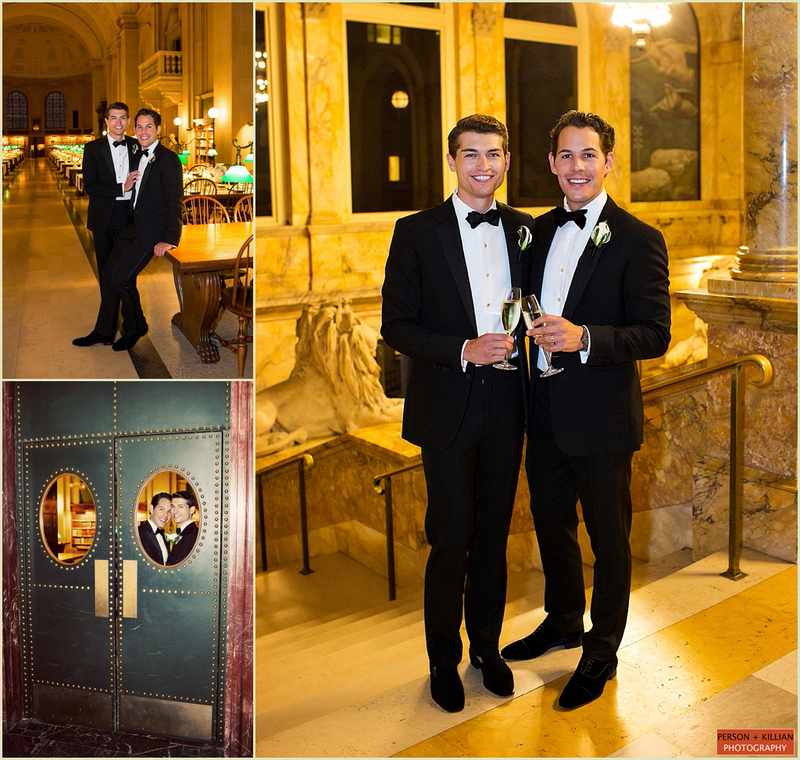 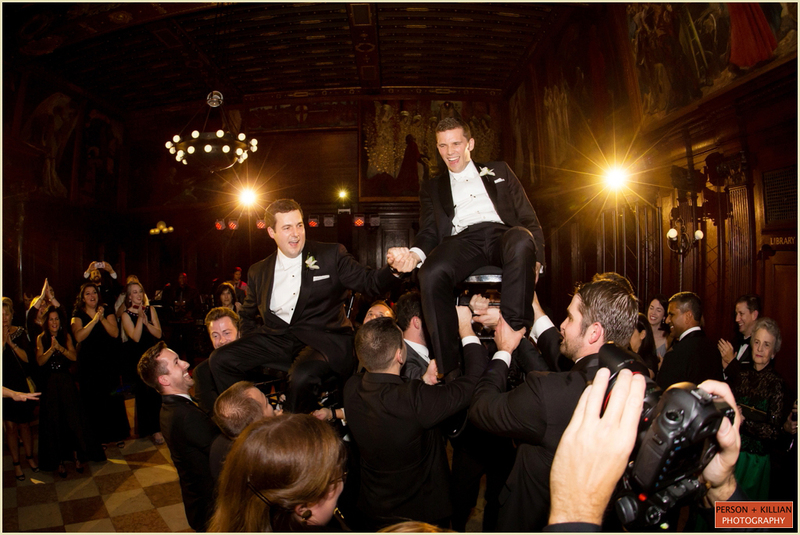 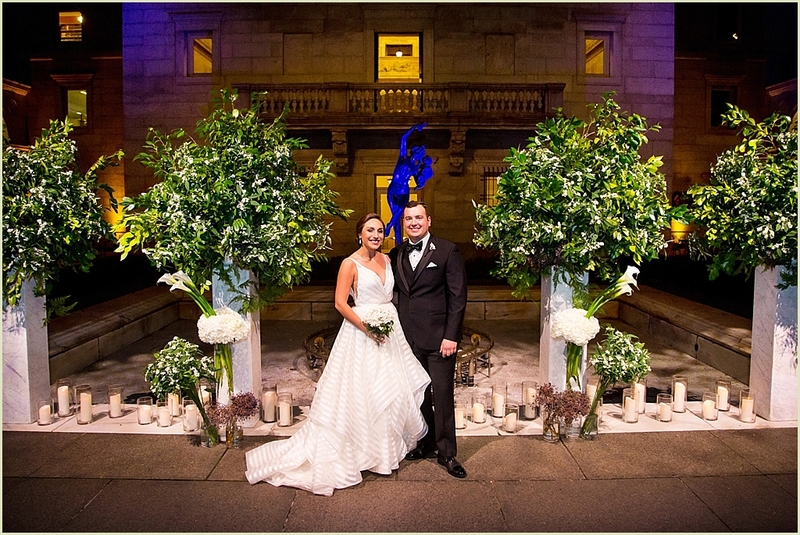 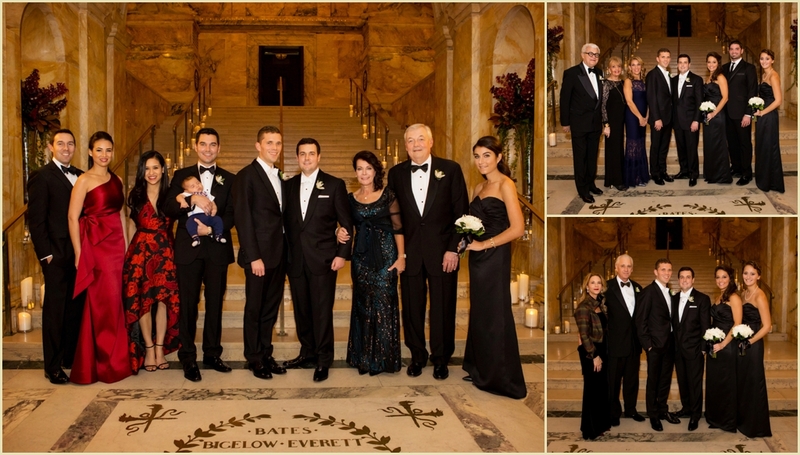 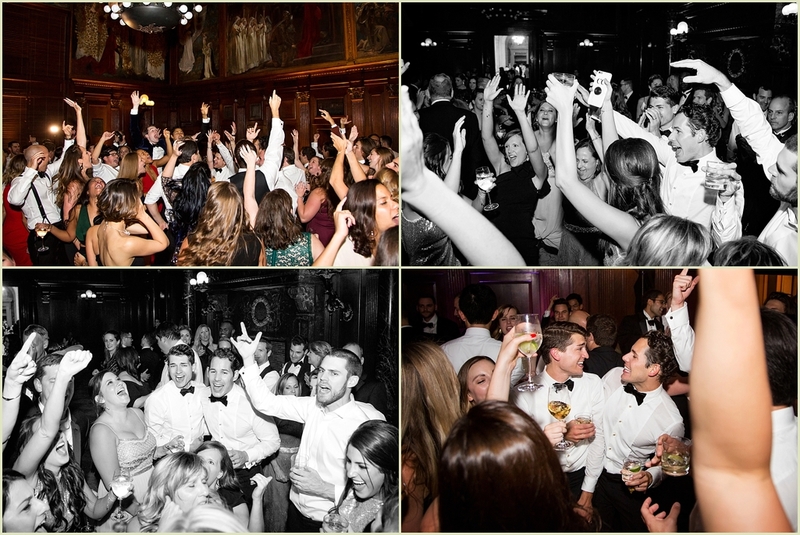 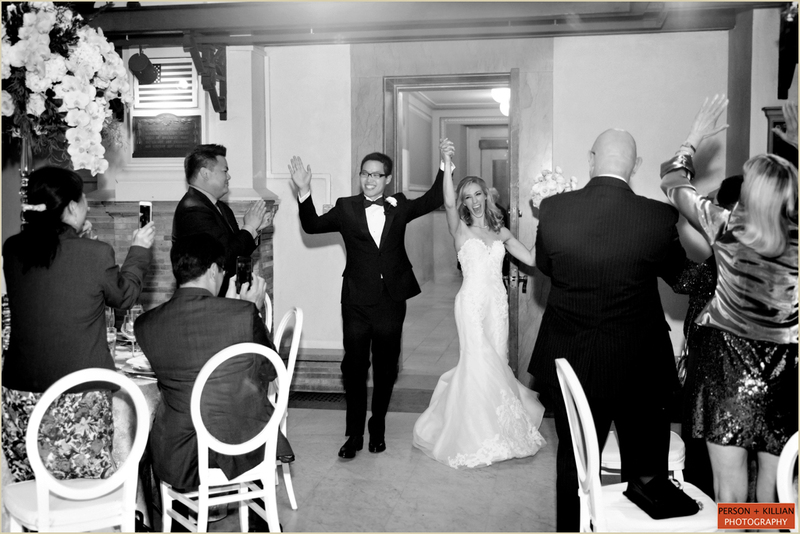 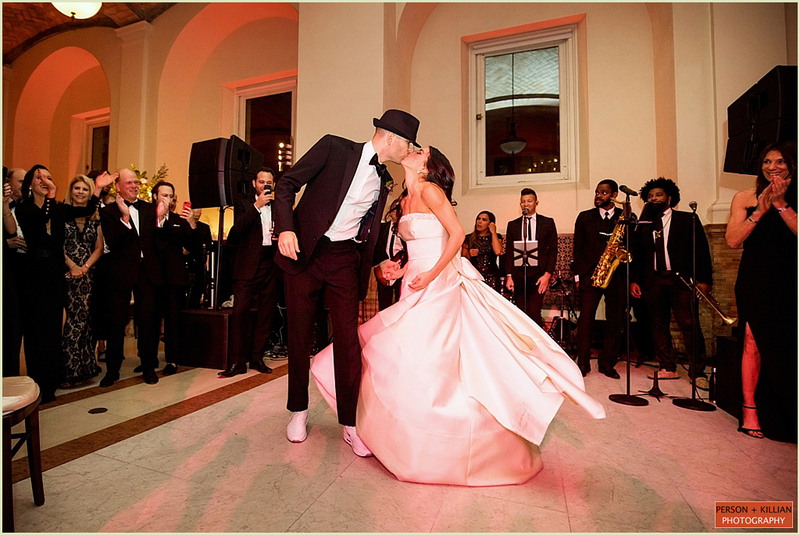 Joc and Zac said their “I do”s surrounded by friends, family, and loved ones — then it was back to the Boston Public Library to get the party started! 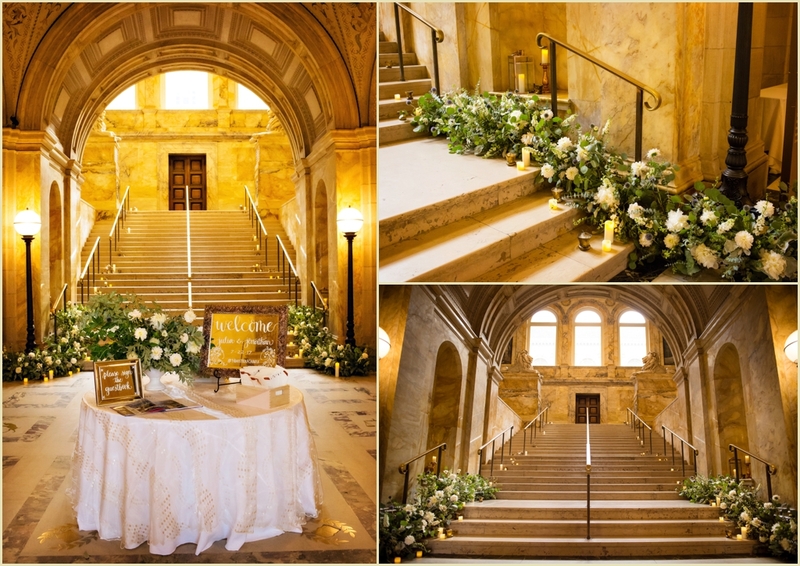 The couple was drawn to the Boston Public Library for its deep historical roots in Boston (it was founded back in 1848), but also wanted to elevate the space with a modern color palette and unique personal touches. 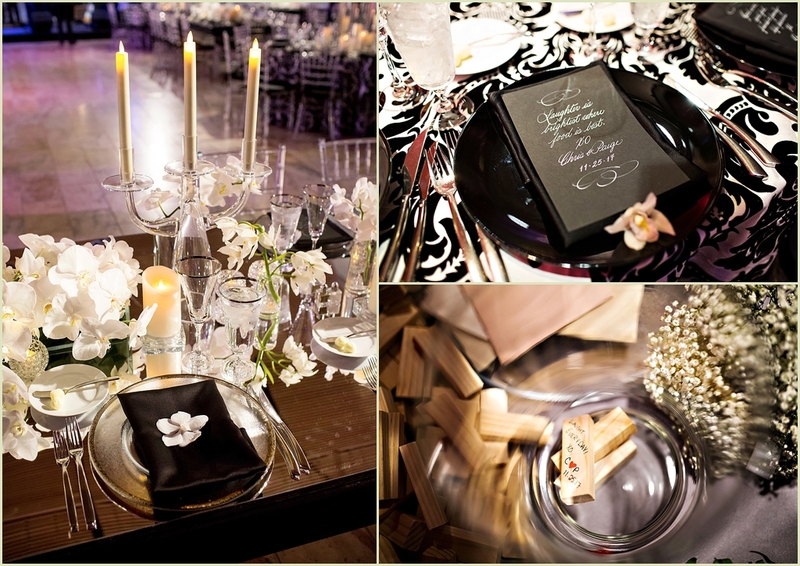 The white table runners for the reception in Bates Hall were accented by gold-vased floral arrangements and black and gold accents on each tabletop. 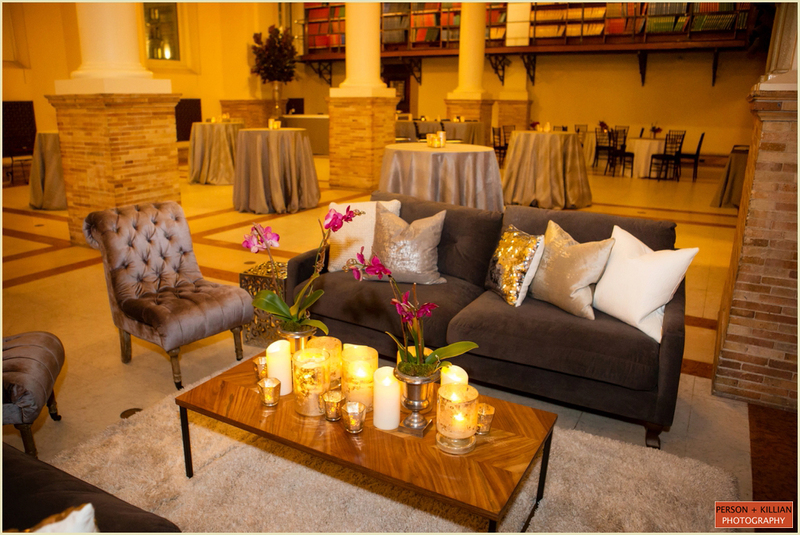 The Abbey Room next door was set up for a night of dancing, with gold and black high-top cocktail tables and a decadent dessert bar for everyone to enjoy. 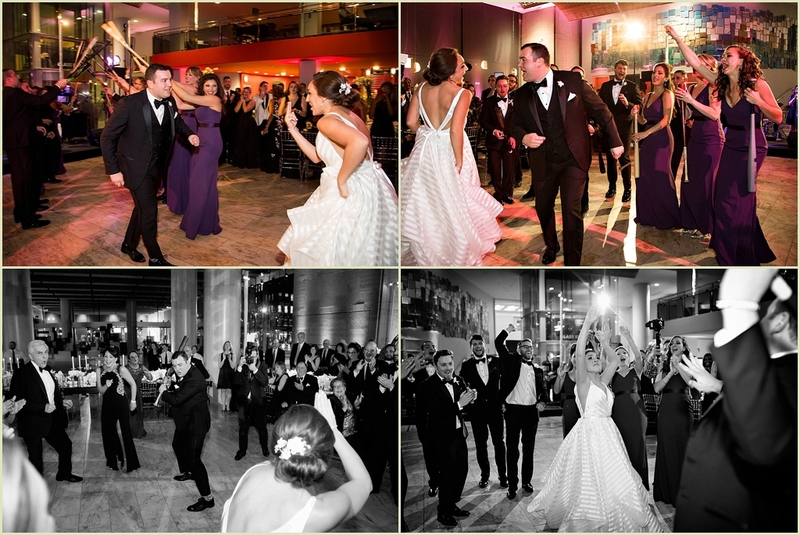 The grooms made a special request for 90’s pop tunes for dancing, and it was clear everyone was thrilled to be there to celebrate with this wonderful couple. 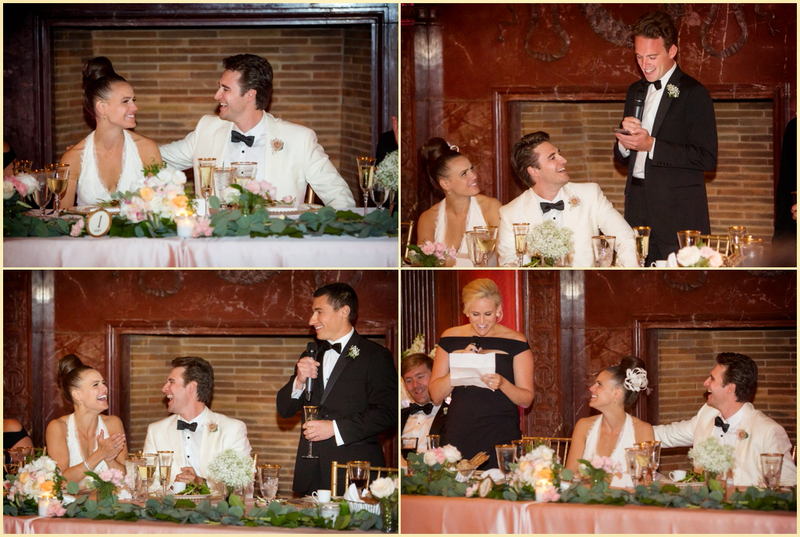 We were so happy to be able to share this wedding day with Joc and Zac. 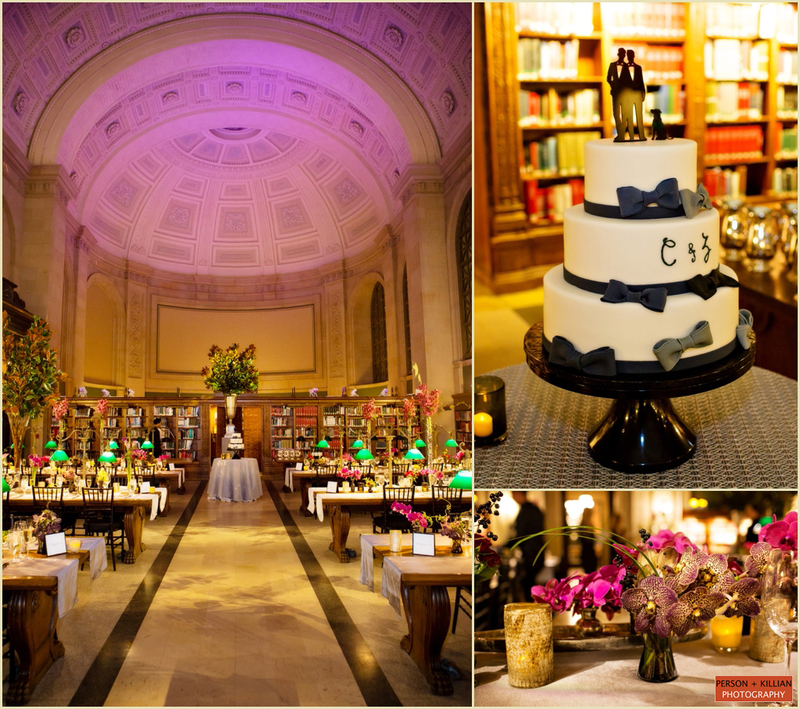 Special thanks to the couple, as well as the entire team at The Catered Affair and the Boston Public Library for a spectacular event. 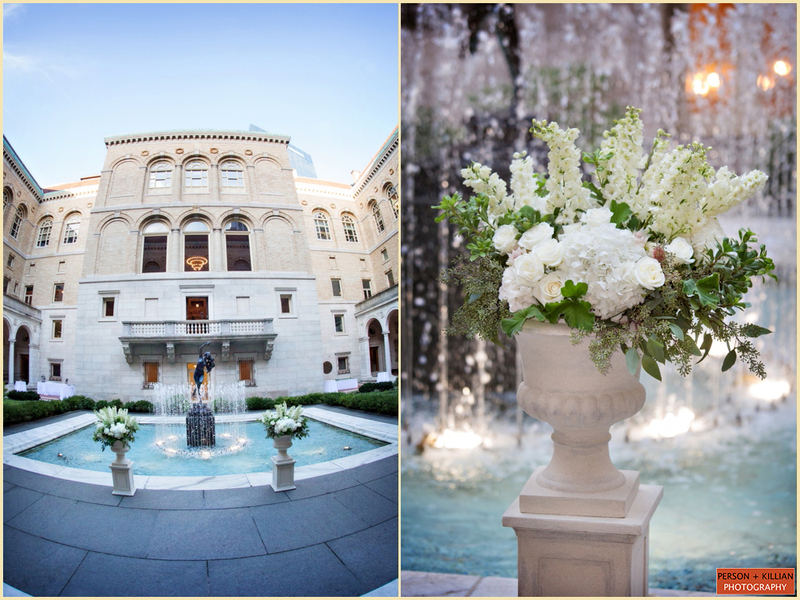 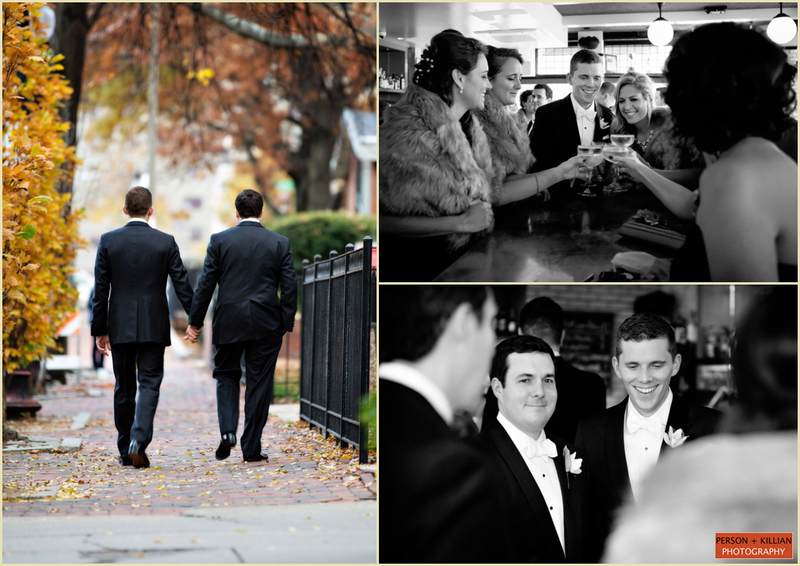 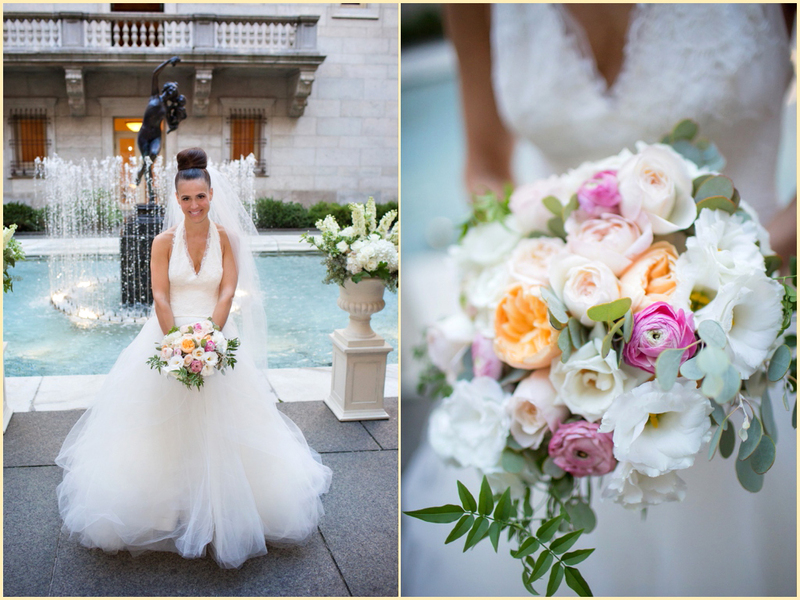 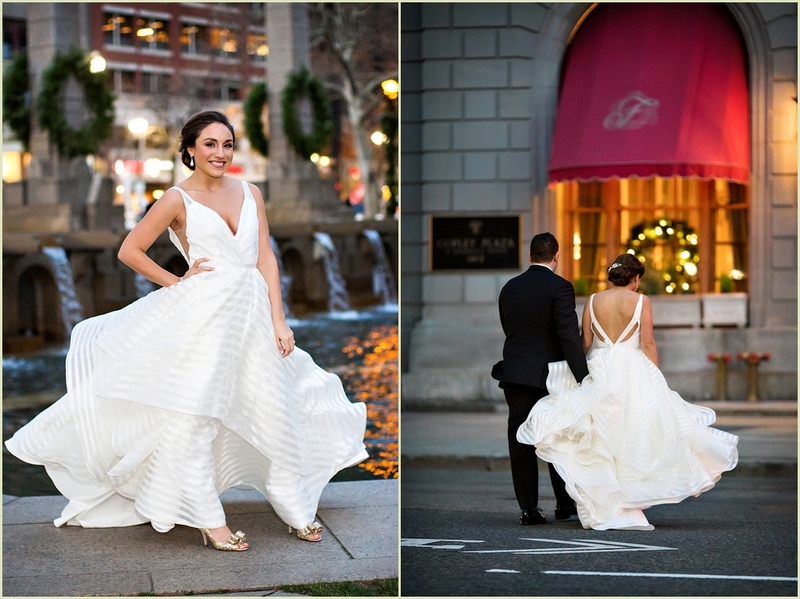 A beautiful summer day, a classic Boston wedding venue, and a wonderful fun-loving couple — what more could we ask for! 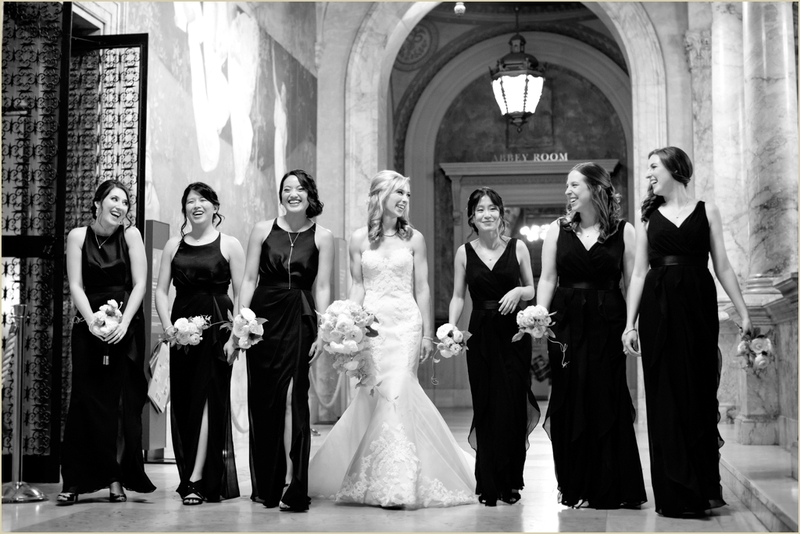 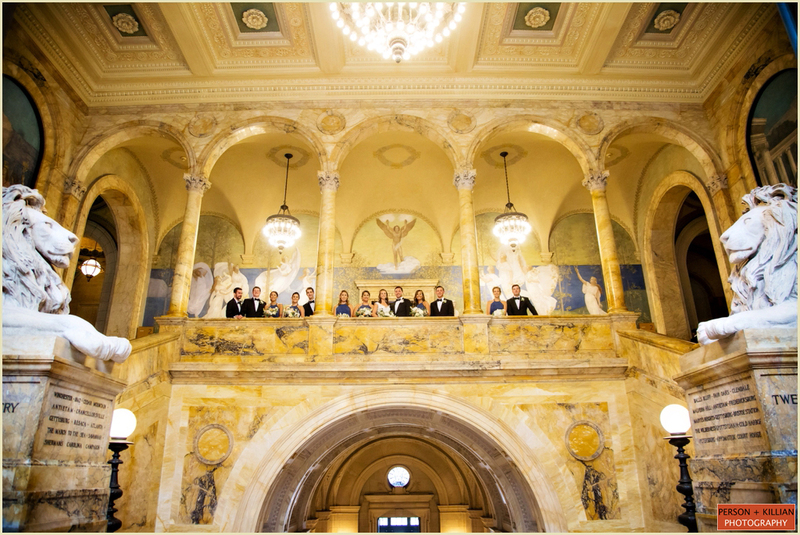 This Boston Public Library wedding began in Boston’s Back Bay neighborhood, where bride Alexandra and her bridesmaids got ready for the day at her parent’s home. 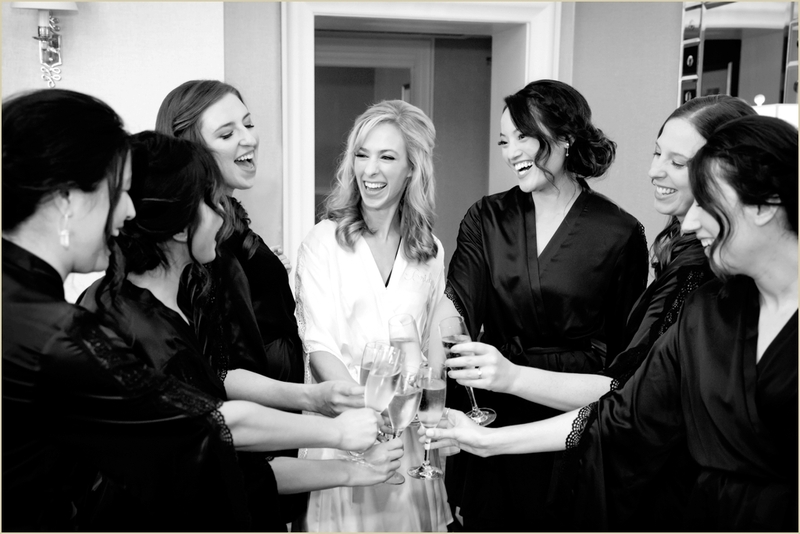 The ladies enjoyed a champagne toast and a few photos on the rooftop while groom Daniel and his groomsmen spent the morning a the nearby Westin Copley. 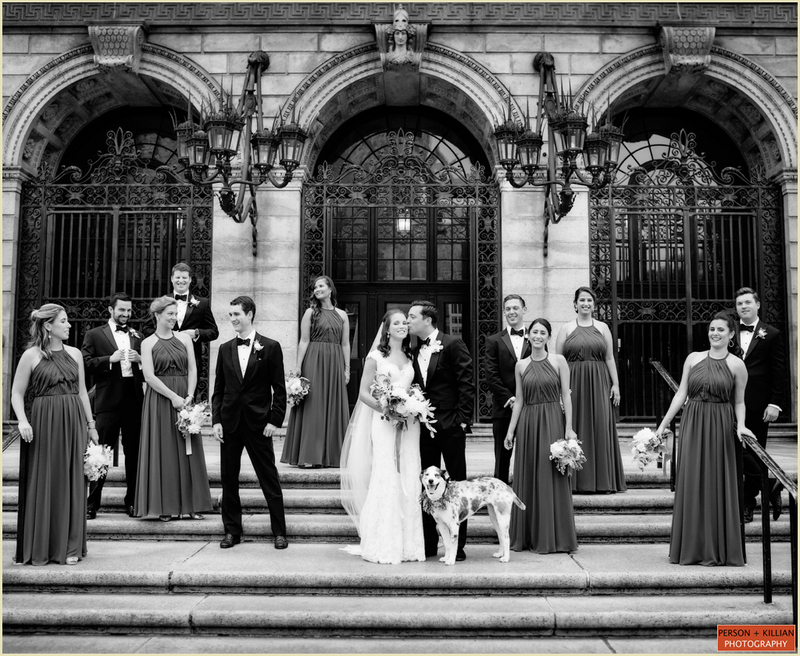 One of the things we love about the Back Bay is how close by everything is — once Alexandra and Daniel were dressed and ready, it was a short walk to the Boston Public Gardens for the couple’s first look. 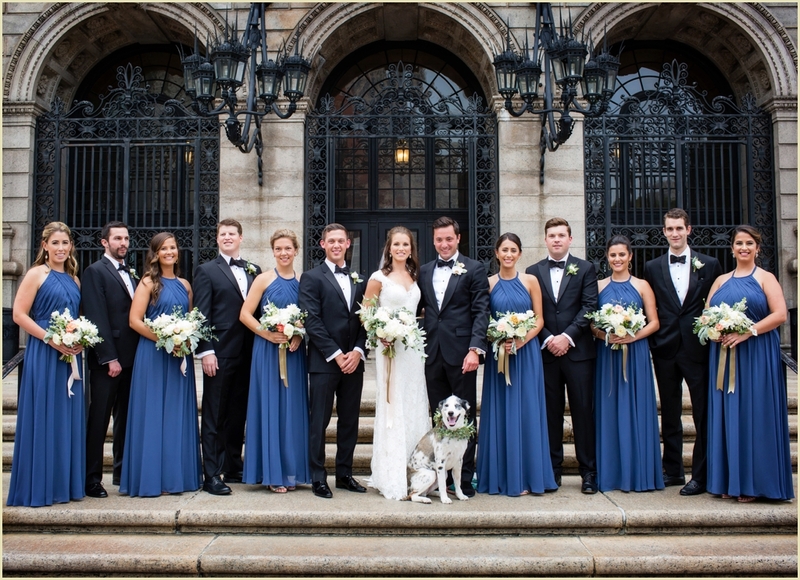 After a few formal photos with just the bride and groom, we were joined by the entire wedding party for some group and family photos. 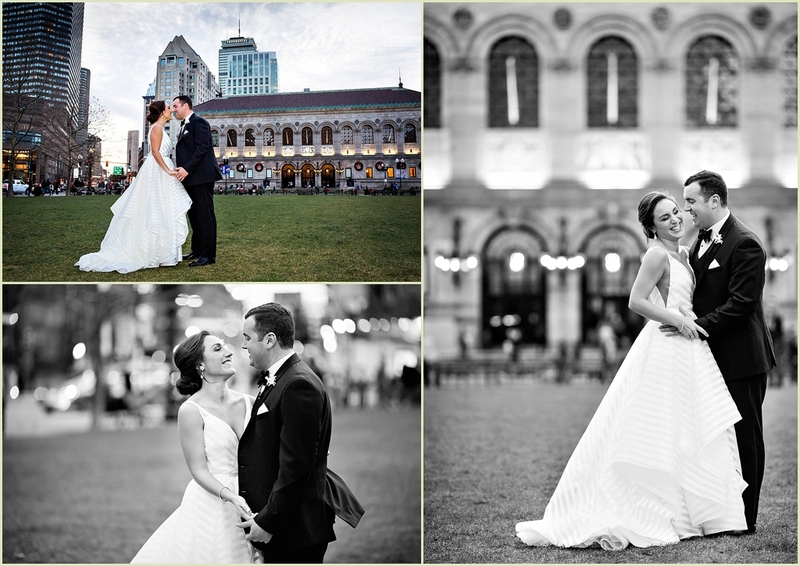 It was a perfect summer day in Boston, and everyone enjoyed being out in the sunshine. 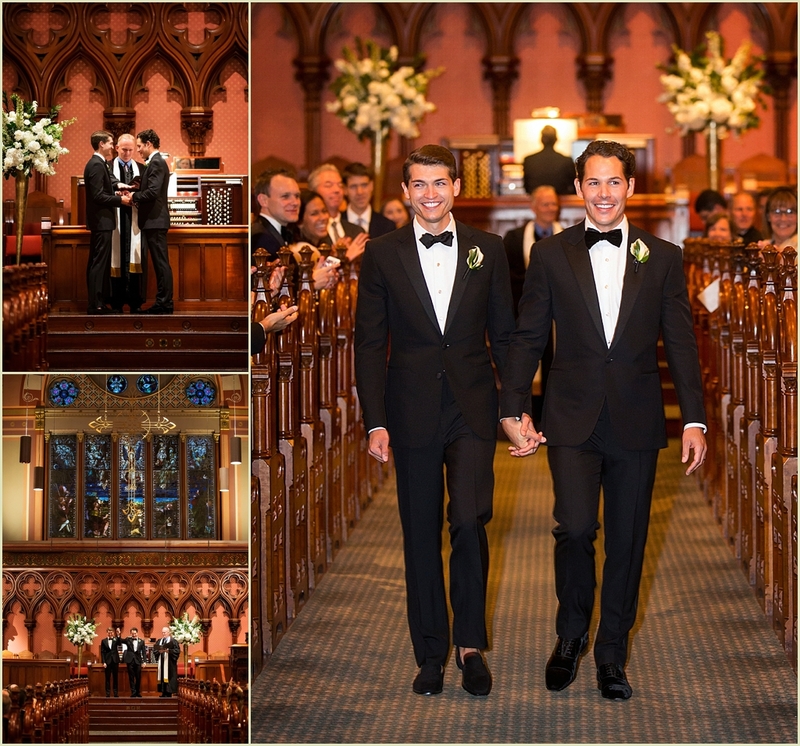 Before too long it was time for the ceremony, which took place at the Harvard Memorial Church. 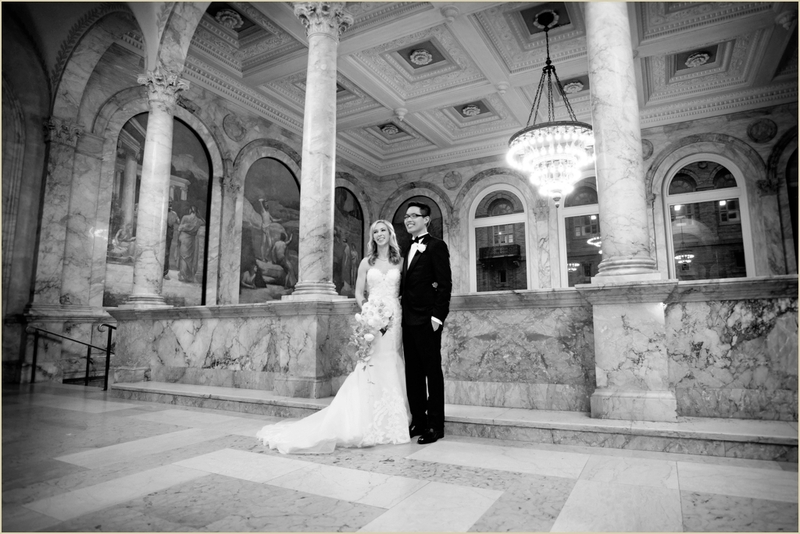 This was a special place for both Alexandra and Daniel as this is where they both went to school! 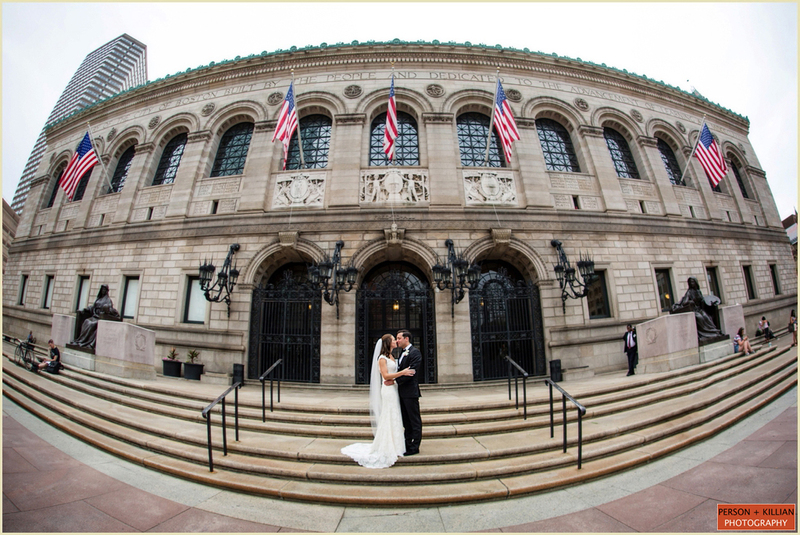 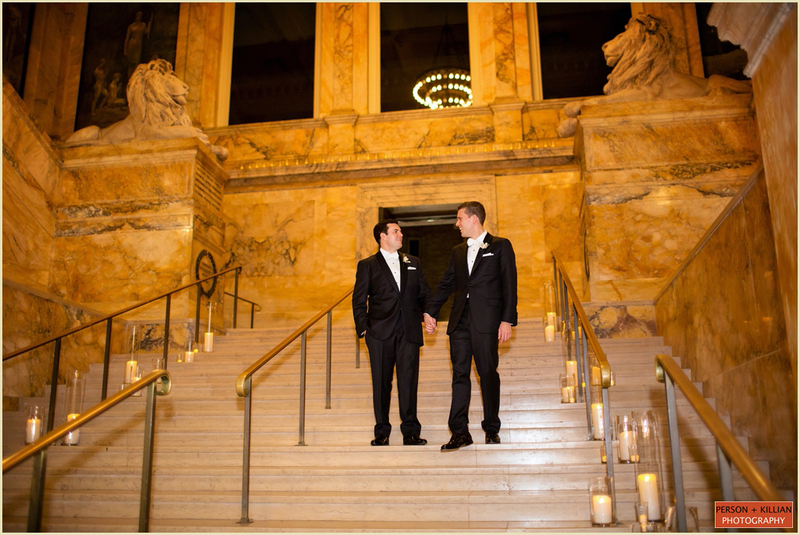 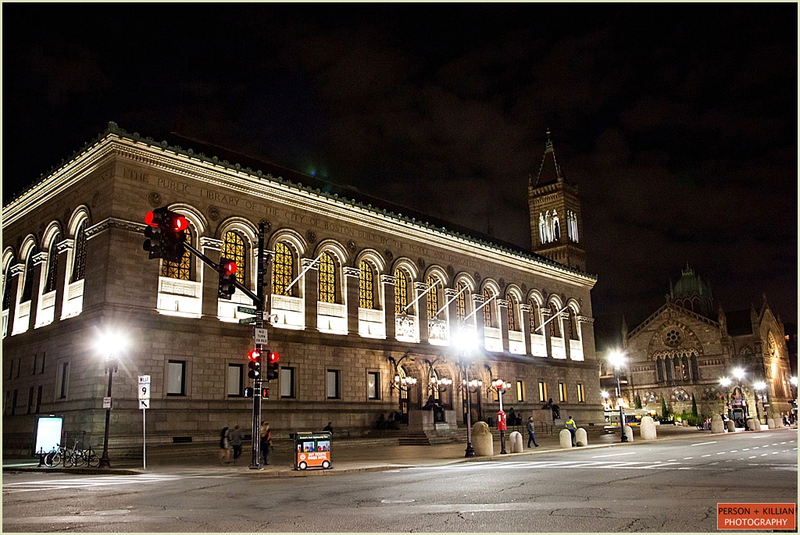 After the “I do”s it was back to Back Bay and the Boston Public Library to start the celebration. 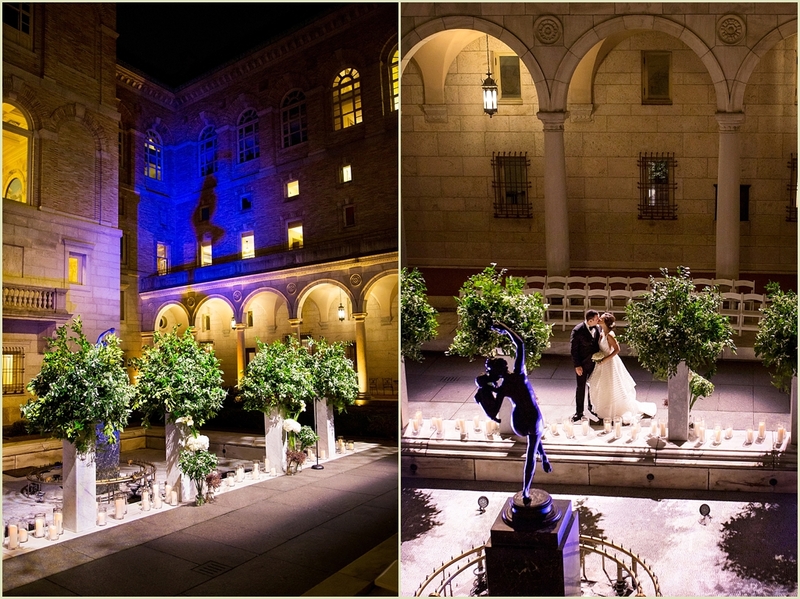 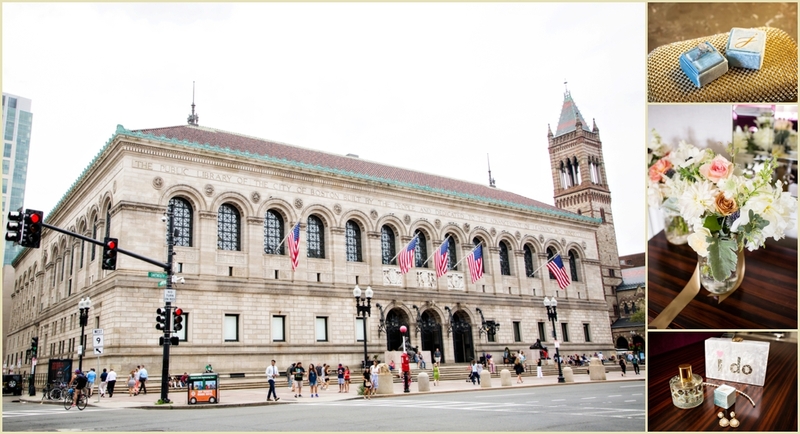 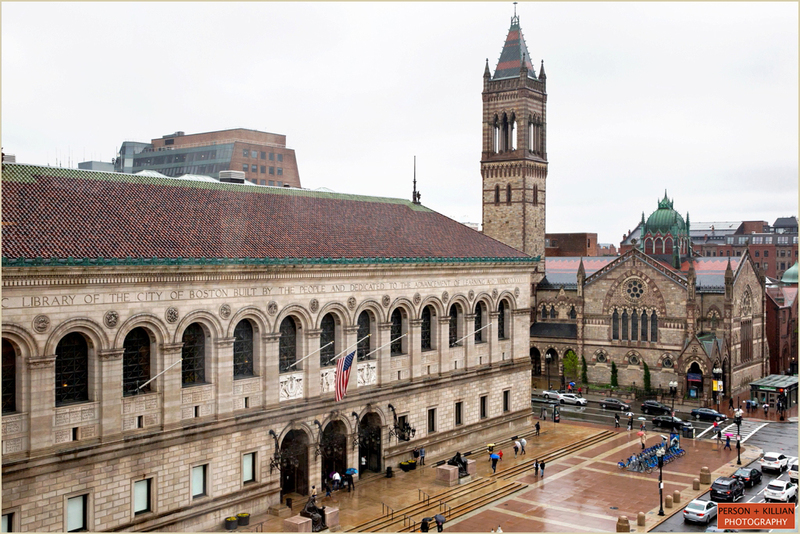 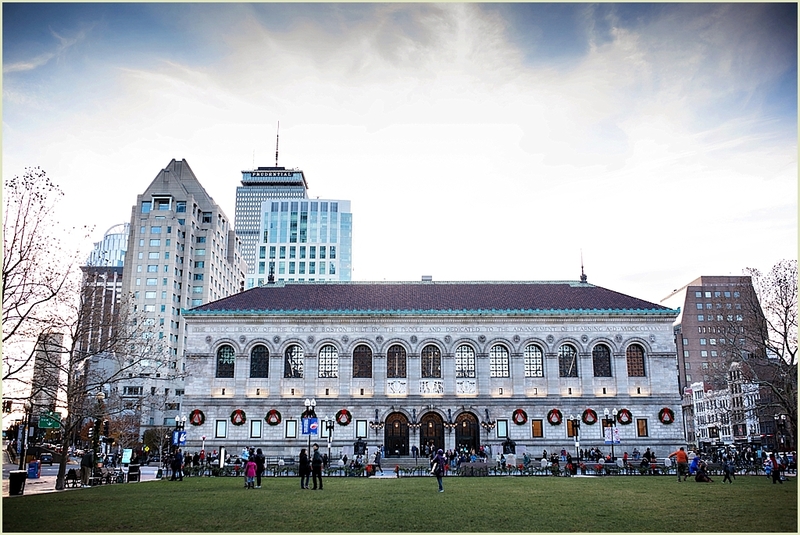 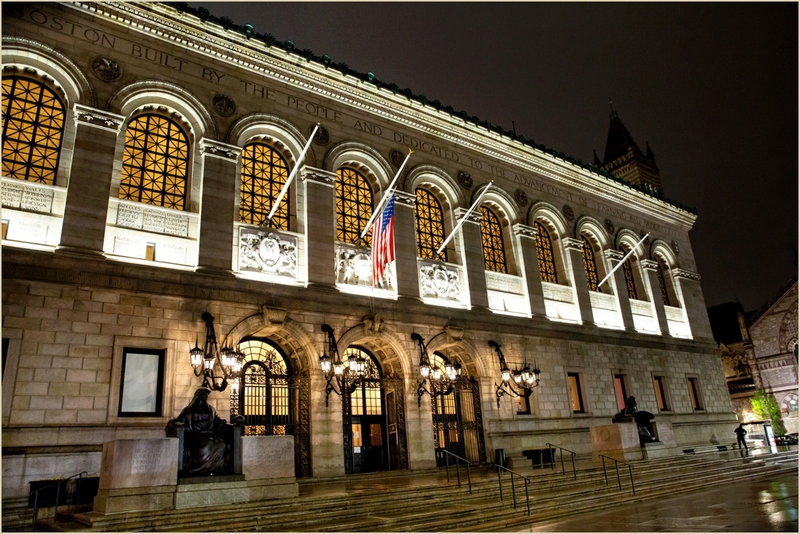 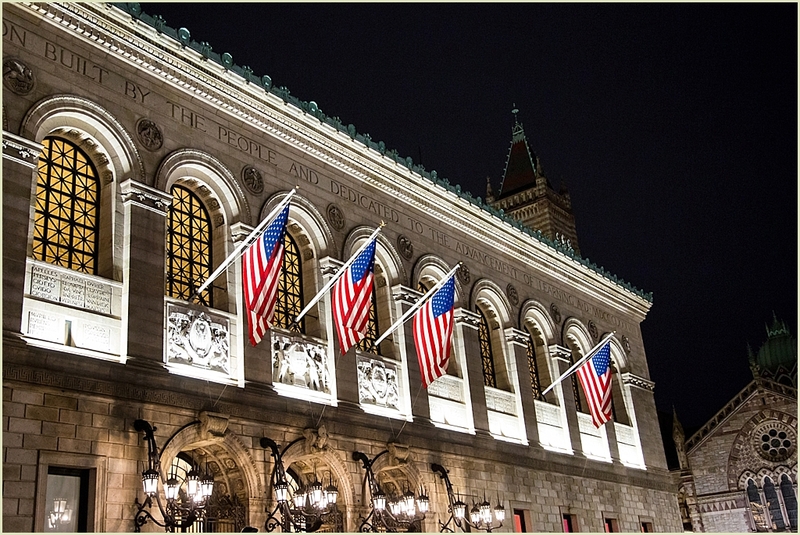 The Boston Public Library sits in the heart of Copley Square and features a gorgeous outdoor courtyard, classic old Boston architecture, and a series of beautiful event spaces. 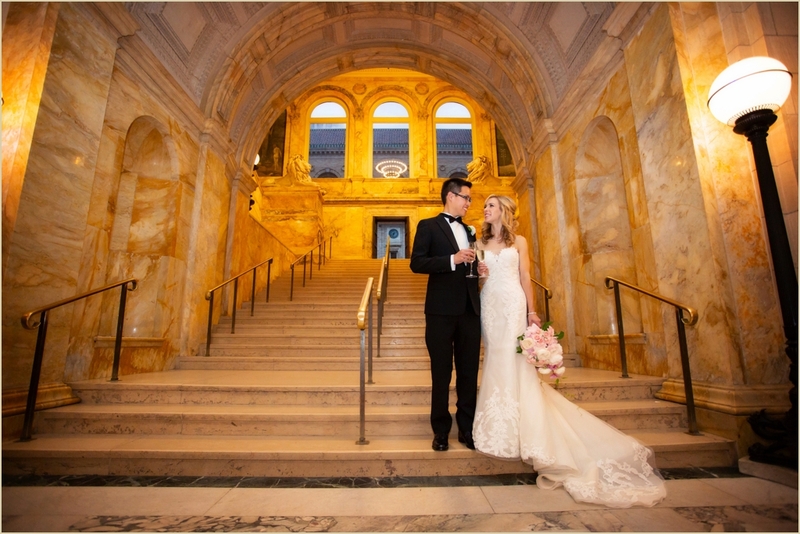 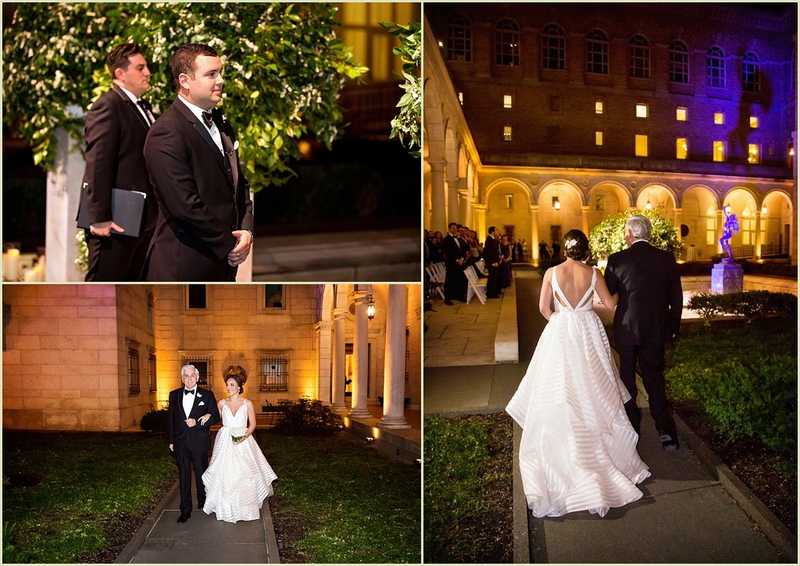 It is one of our favorite Boston wedding venues and was the perfect spot for this bride and groom to celebrate their classic and traditional wedding day. 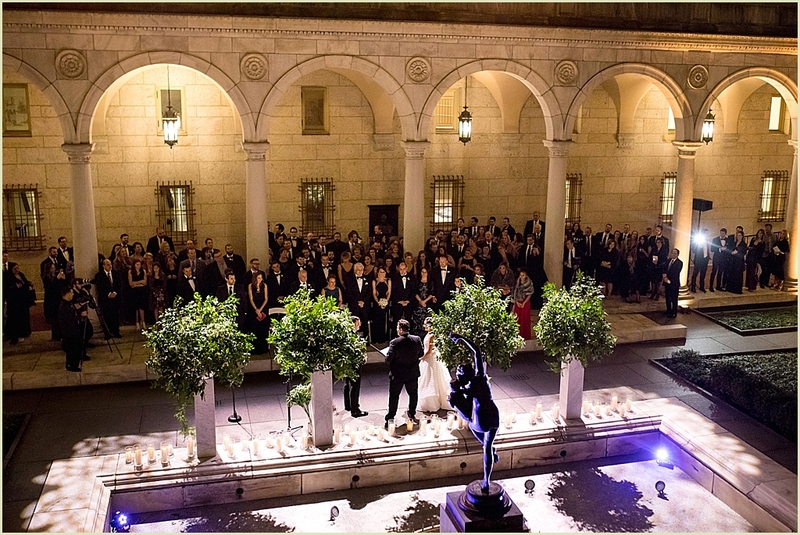 The evening started outside in the courtyard for cocktails. 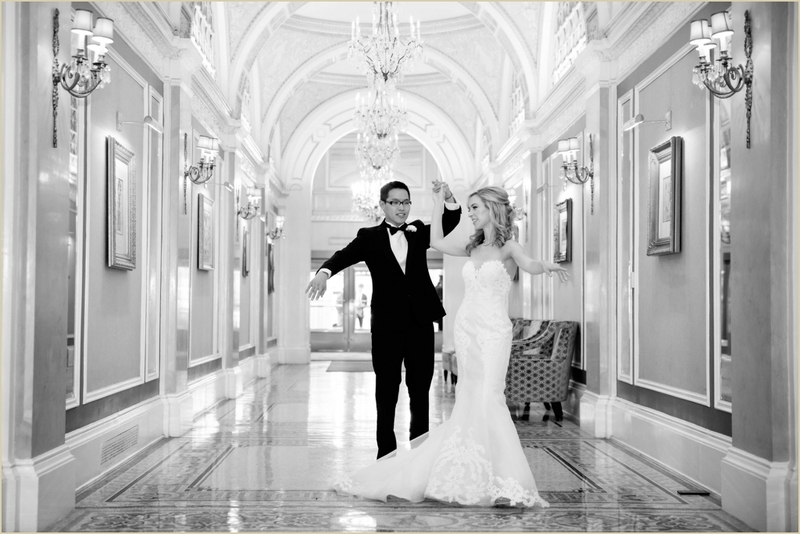 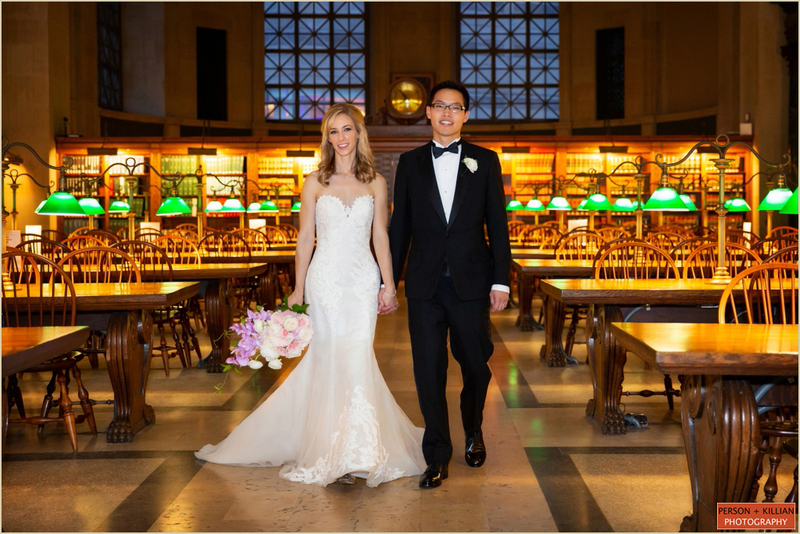 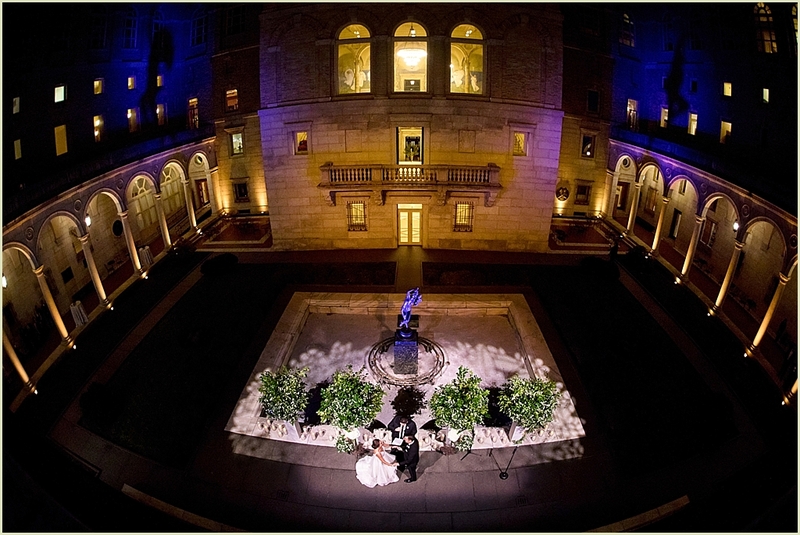 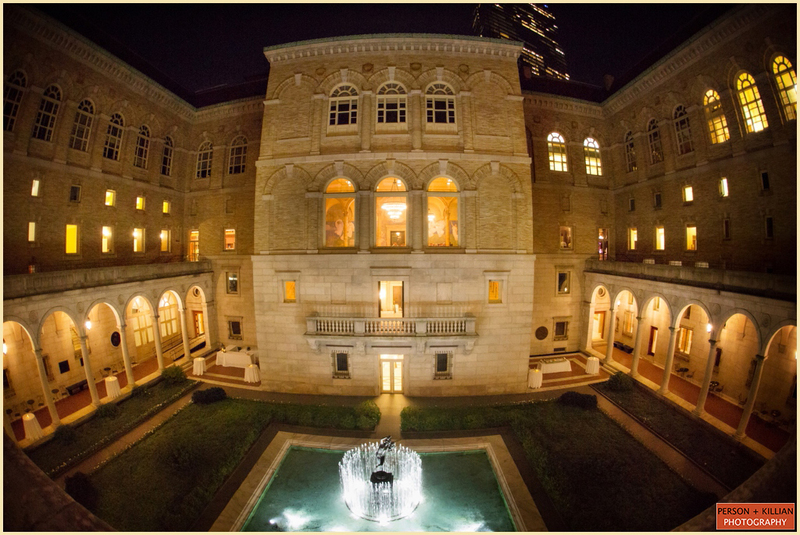 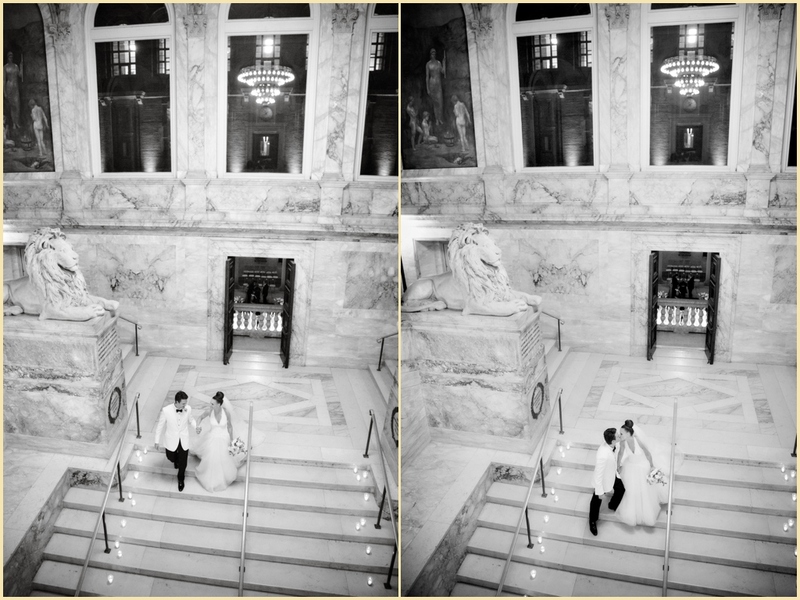 While guests mixed and mingled around the stunning central fountain, we took Alexandra and Daniel through the halls of the library for some formal photos. 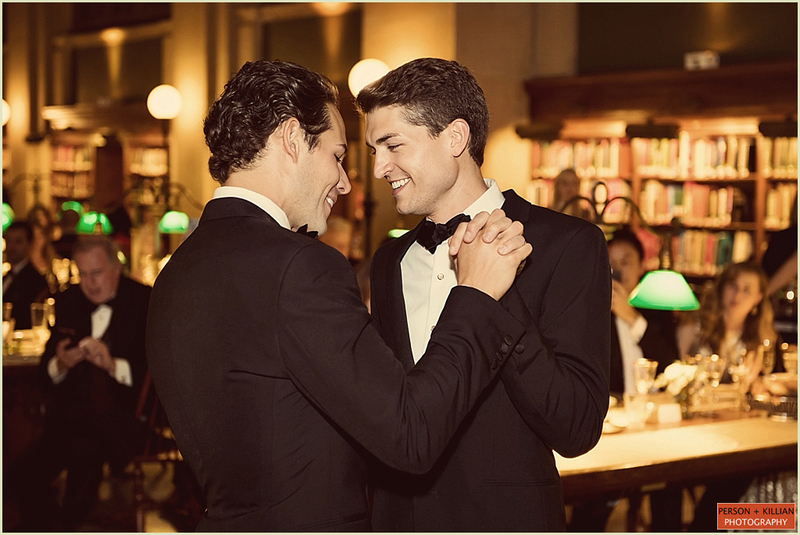 Everyone then moved into Bates Hall for dinner and dancing. 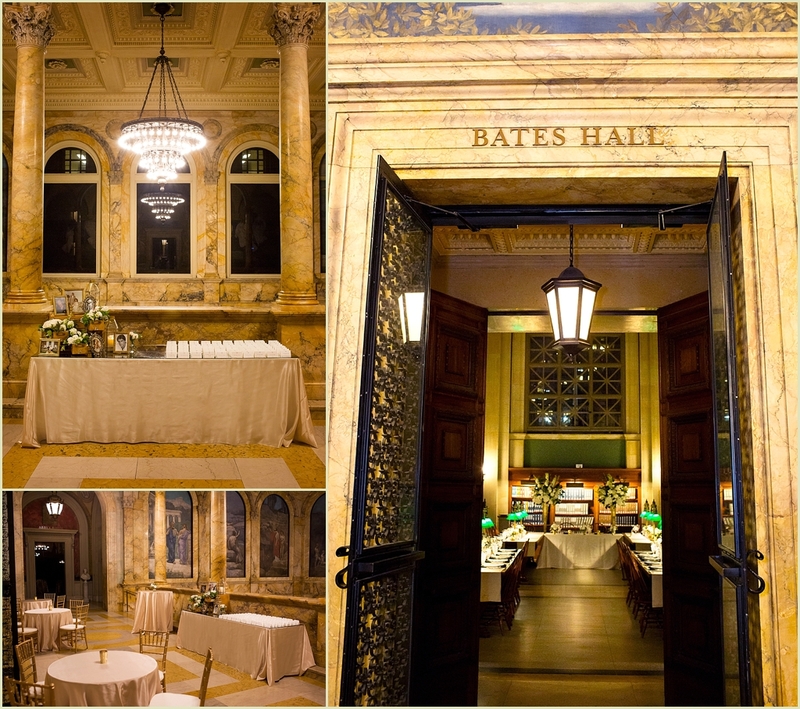 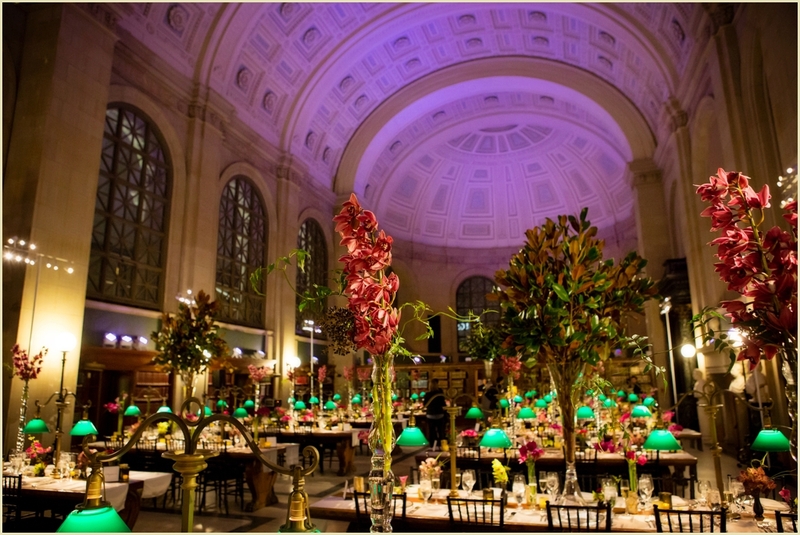 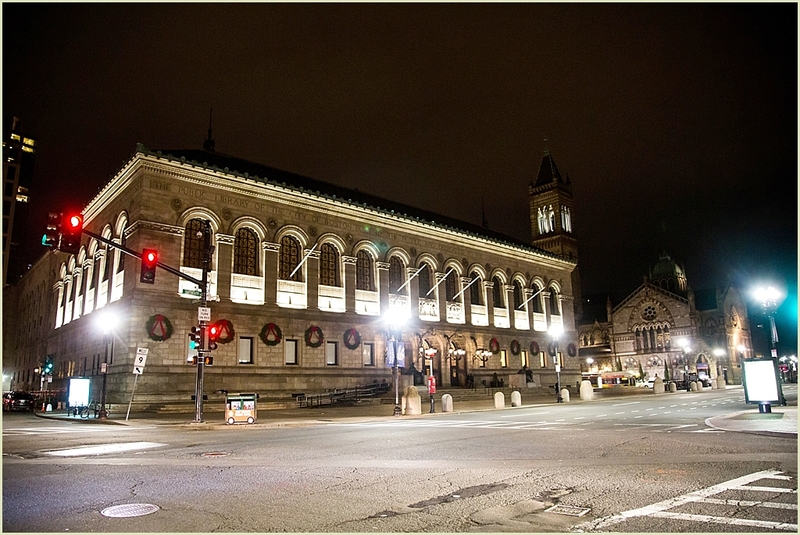 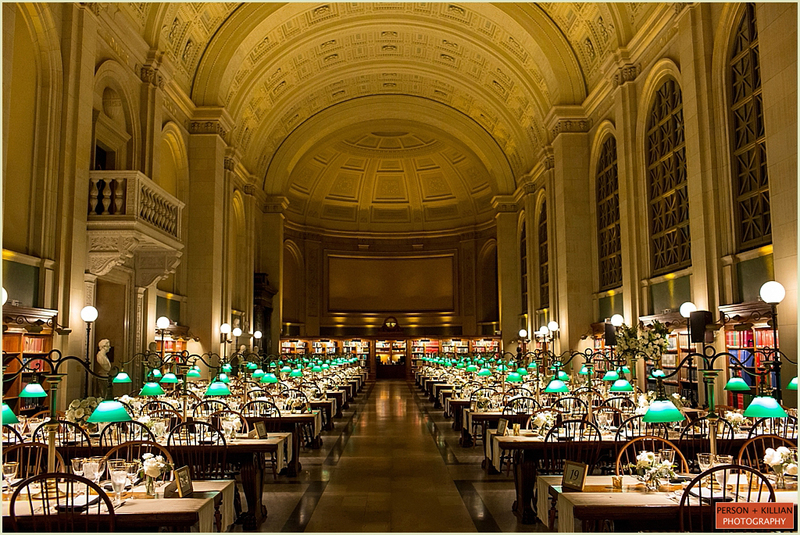 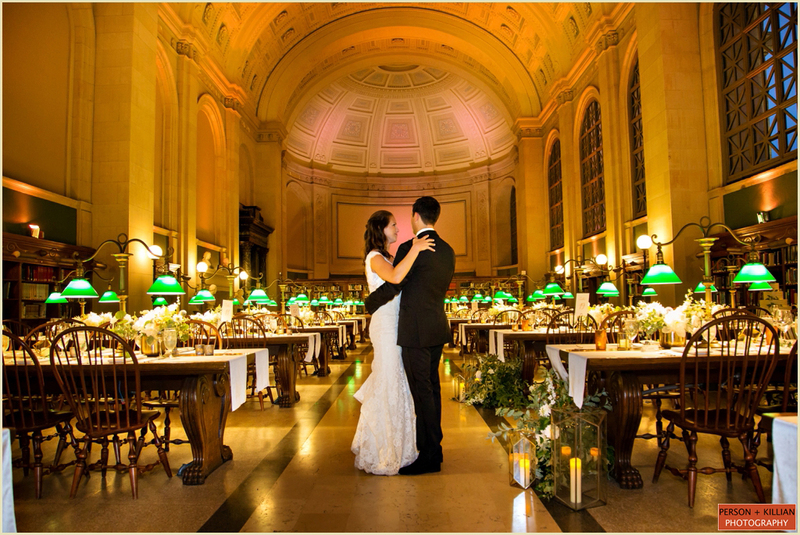 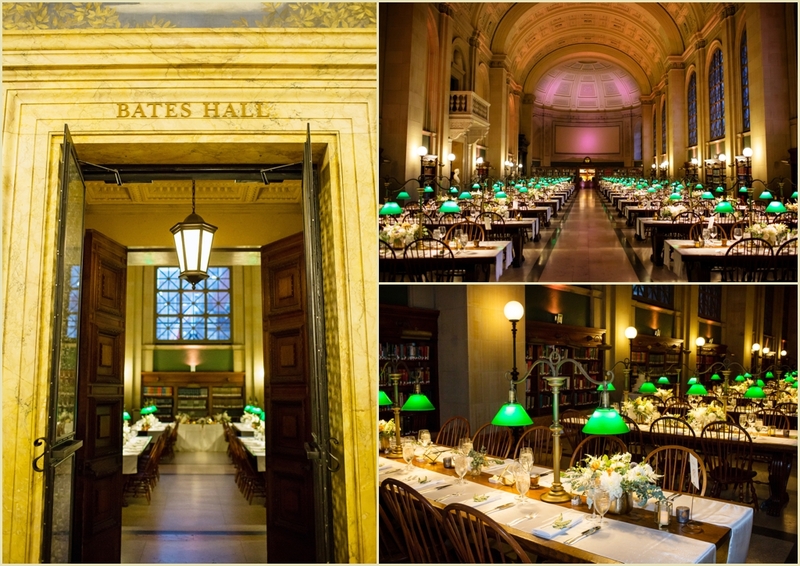 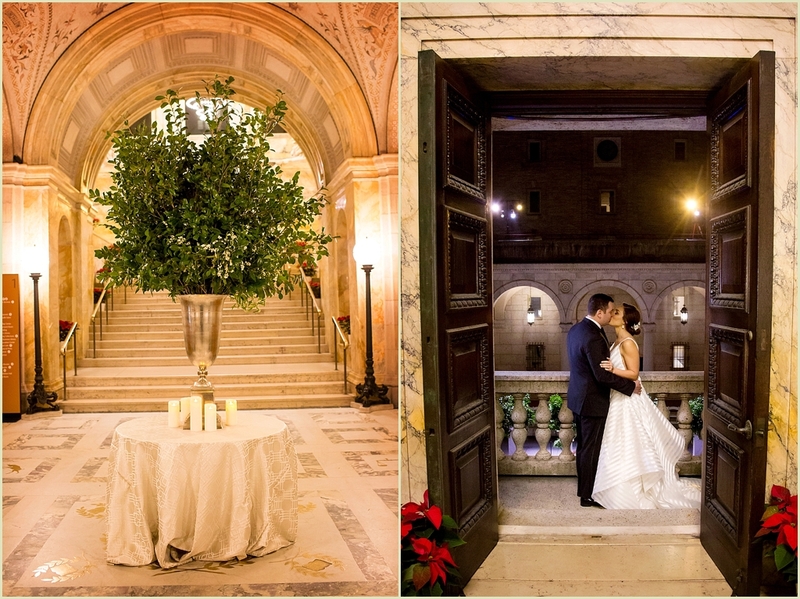 Bates Hall is the centerpiece of the Boston Public Library — with the high, arched ceilings and iconic green reading lights on each table, it has become a Boston wedding classic. 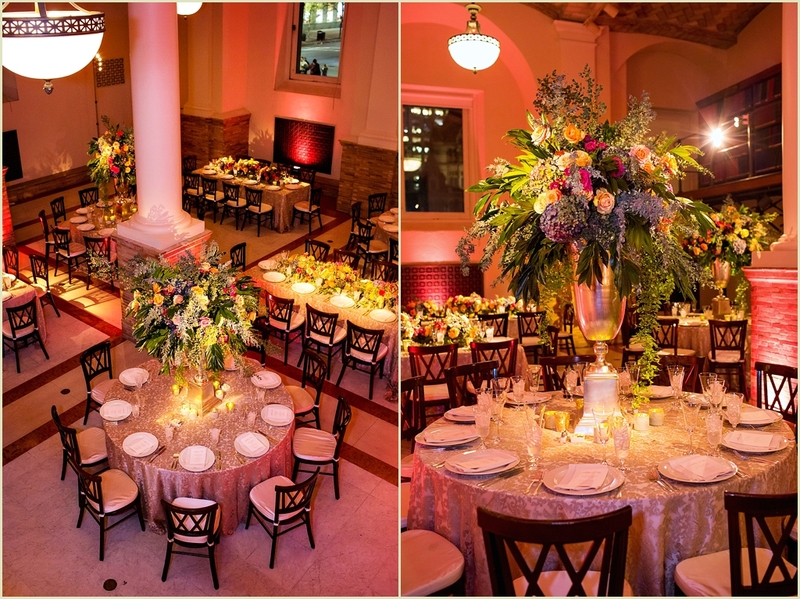 The bride and groom added fresh summer flowers to each table and soft purple uplights to accentuate the space, and now it was time to party! 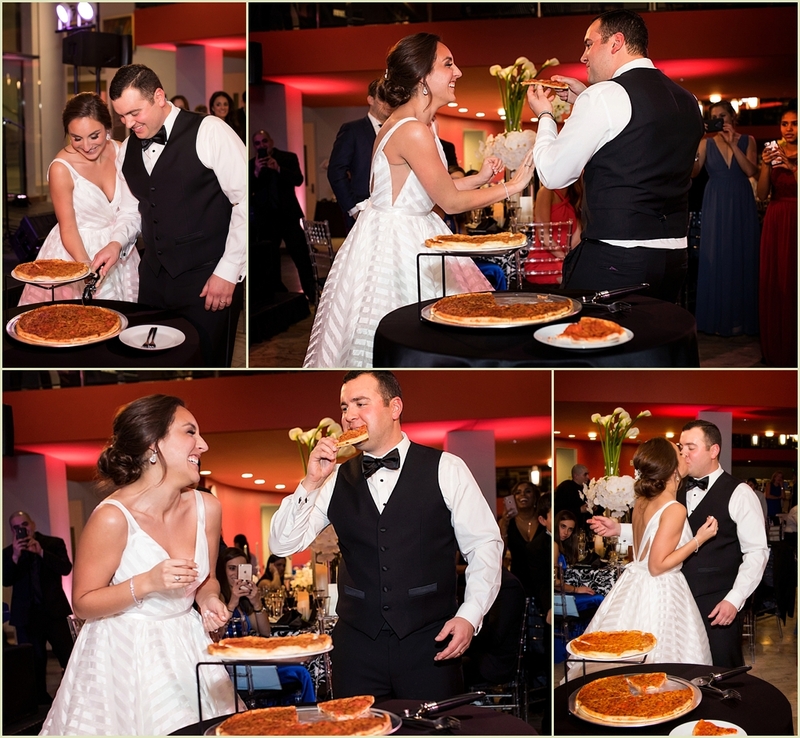 The night was full of food, drinks, toasts, and lots of laughter as everyone came together to celebrate this wonderful couple. 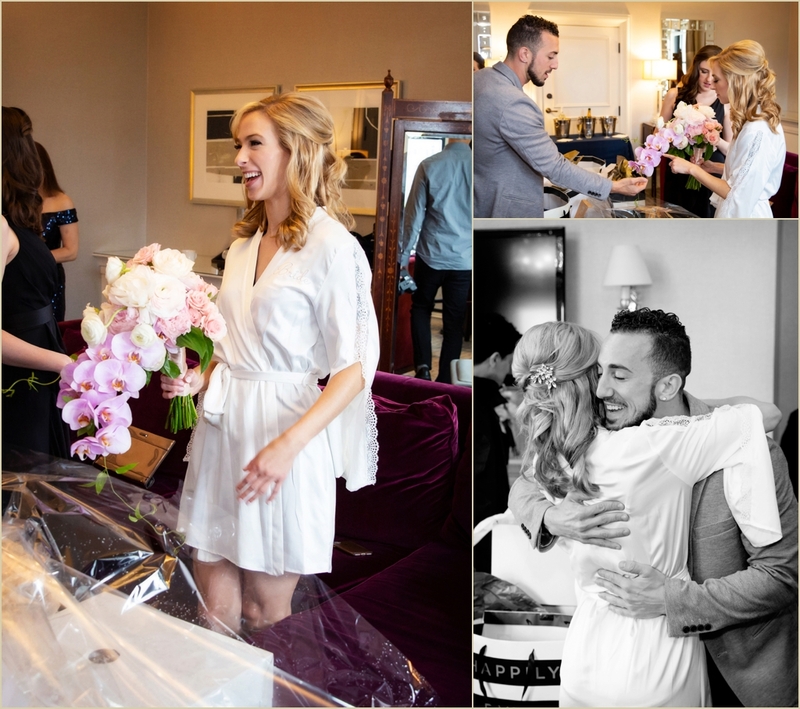 Thank you to Alexandra and Daniel for being so fun and easy to work with, we could not have been happier to join you on your wedding day! 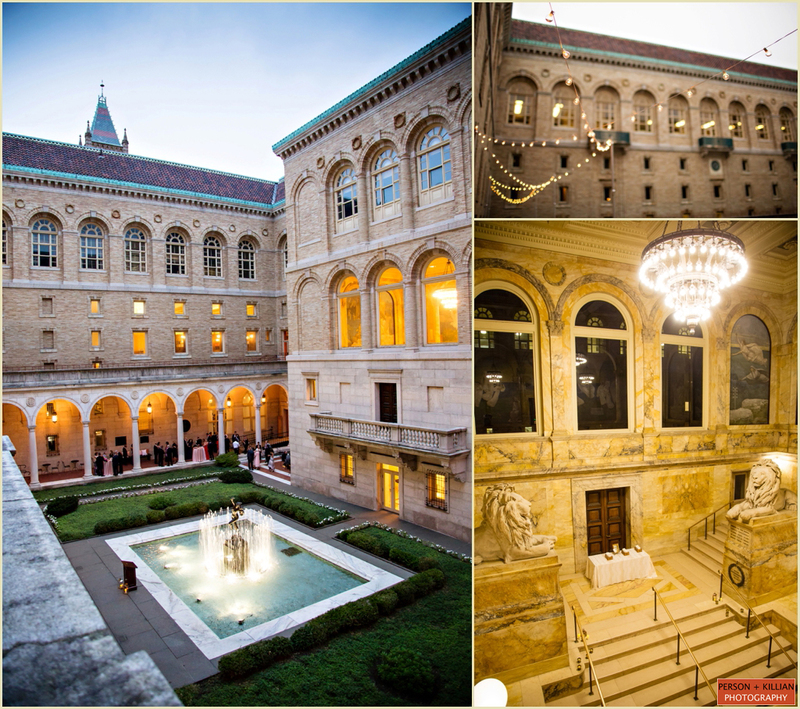 Vendors | Venue: The Catered Affair at the Boston Public Library; Entertainment: Music Management; Rentals: Peak Event Services; Hair: Jana Rago; Makeup: Dani Wagener; Wedding Planner: Tracey Kelly of Tangorra Wedding Planning; Ceremony: Harvard Memorial Church; Flowers: Orly Khon Floral LLC; Video: MapleLoft Studios; Lighting: Socialight Boston * This post is filed under Boston Public Library Weddings. 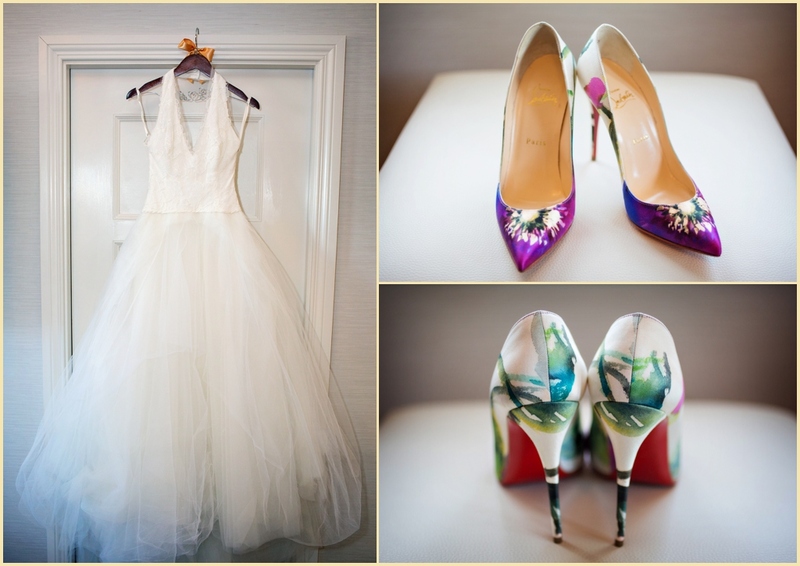 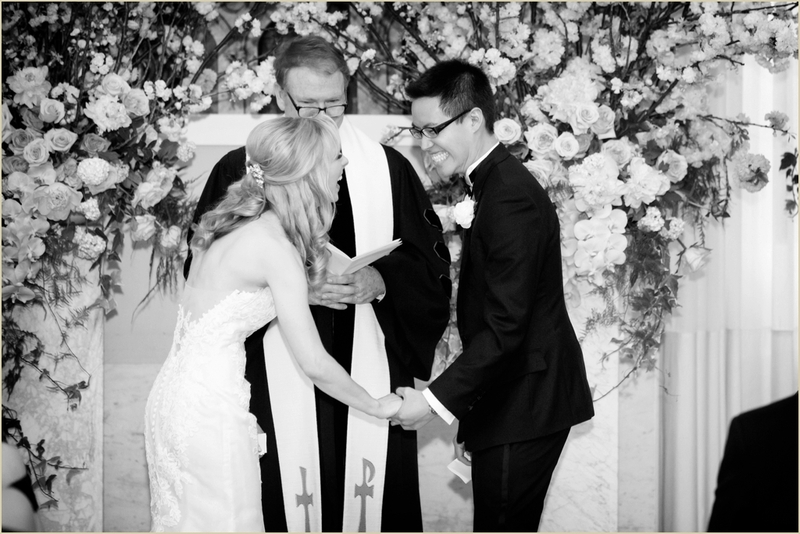 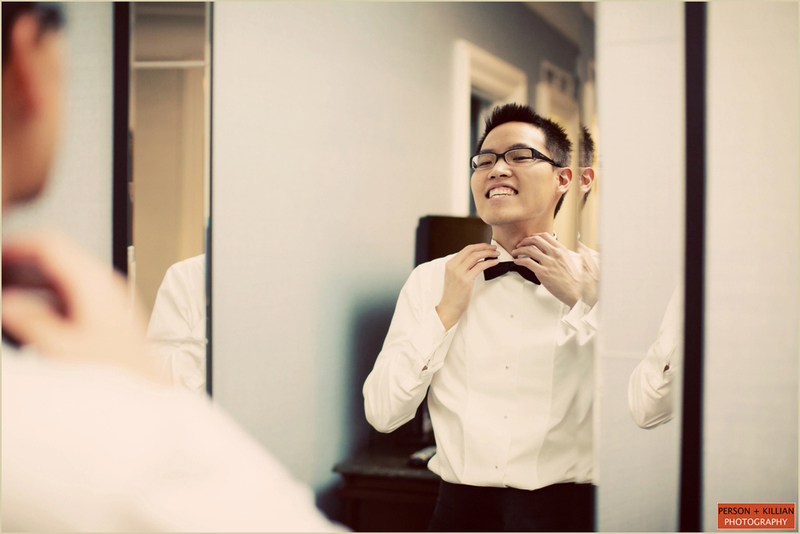 This wedding was photographed by Lauren Killian of Person + Killlian Photography. 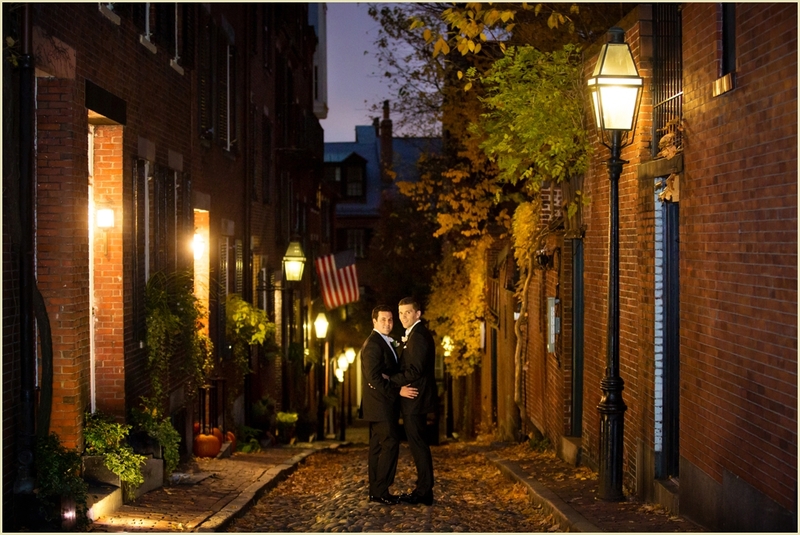 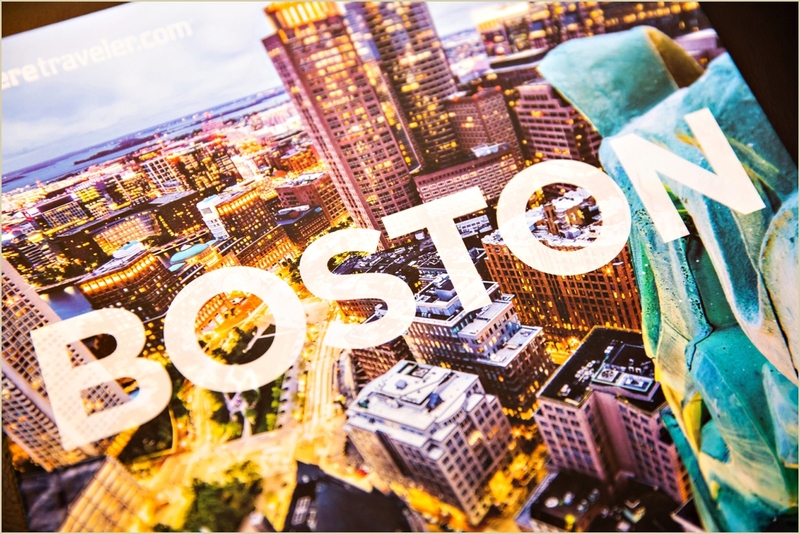 P+K photo is located at 251 Newbury Street in Boston MA. 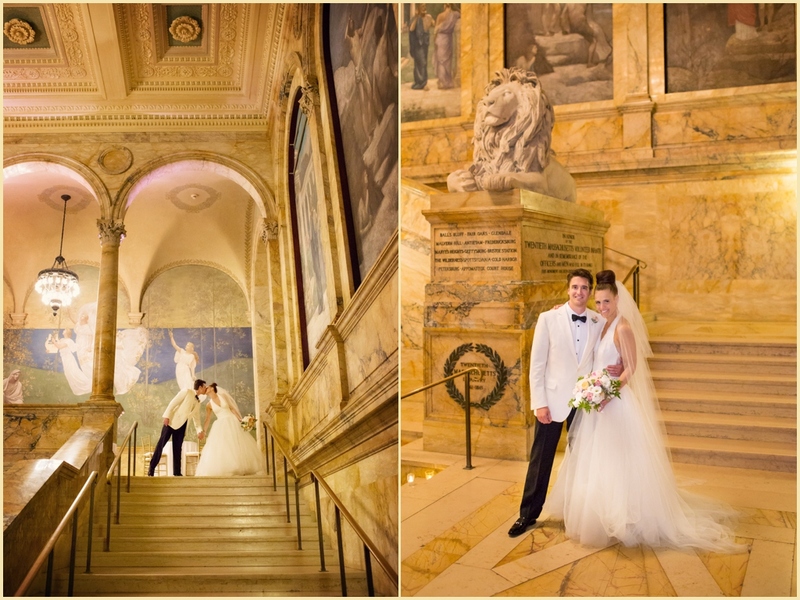 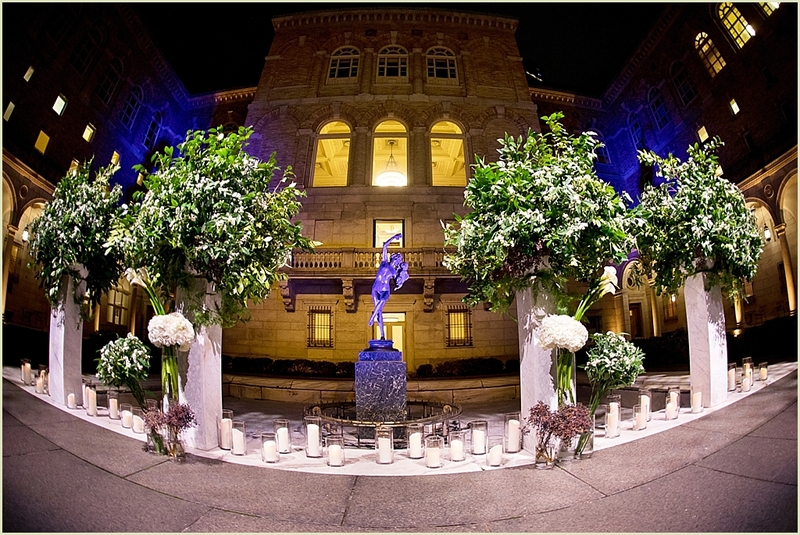 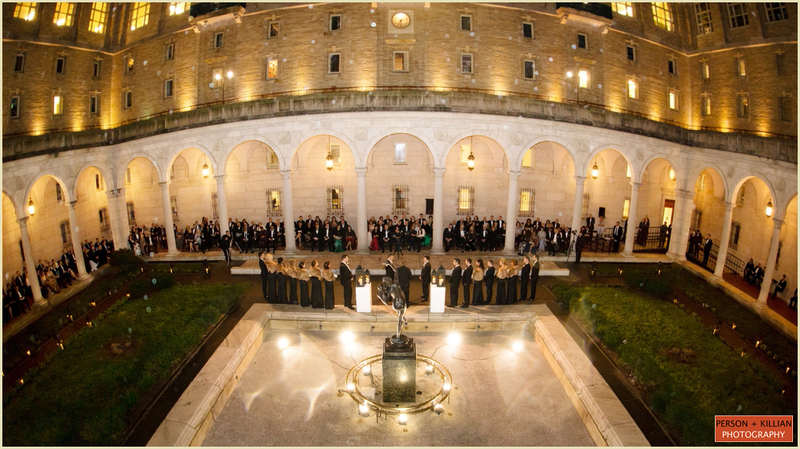 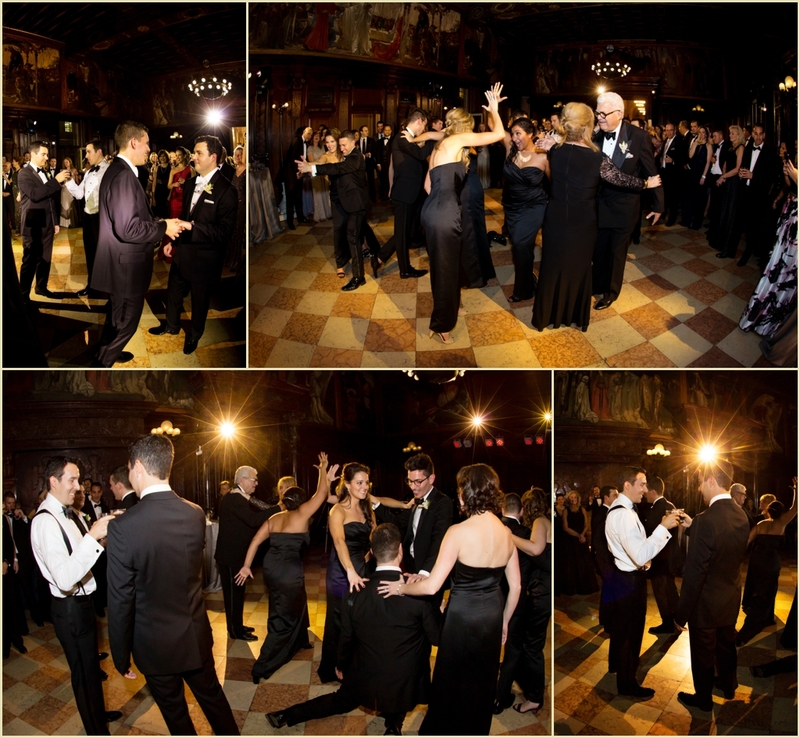 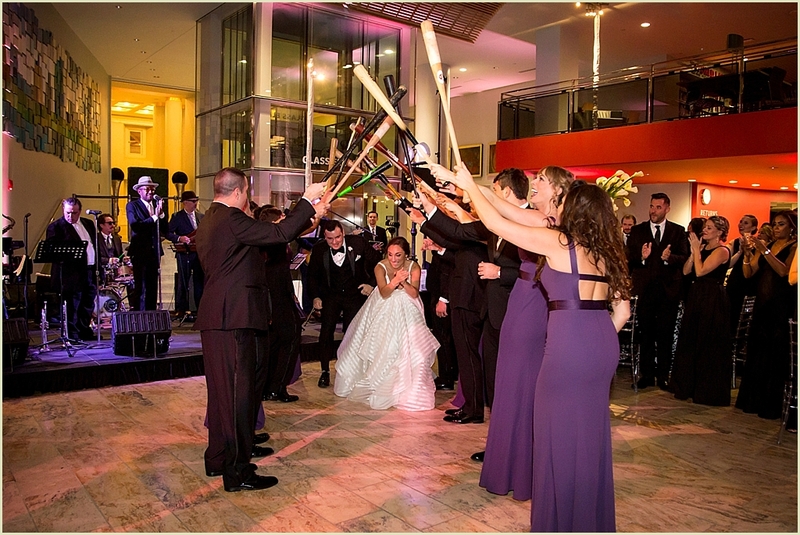 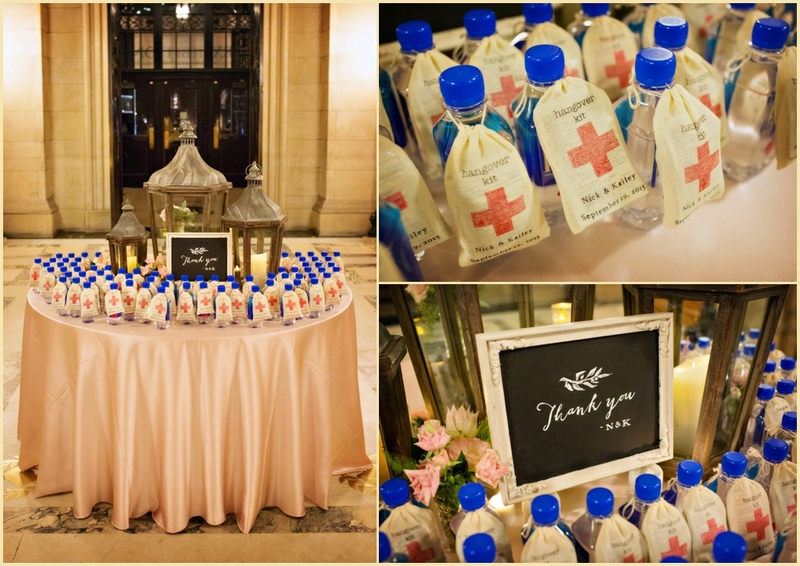 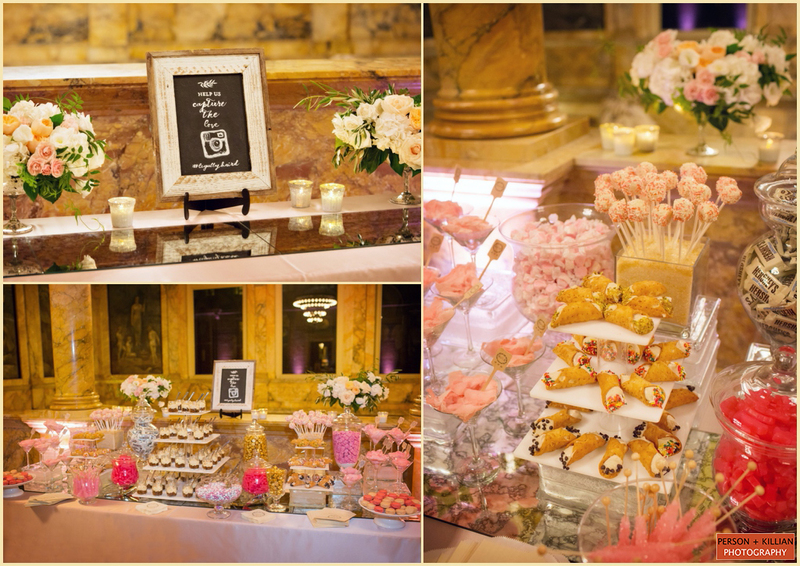 To see more weddings we photographed at the Boston Public Library with the Catered Affair, please click here.